Ribs are not something I eat on a regular basis. In fact, chances are that I will opt for a pulled pork sandwich, or something else of the sort, over a slab of baby backs. I decided to make my foray into rib making the day before I left to celebrate Christmas with my family. Amid the melee of wrapping gifts and trying to jigsaw them safely into my suitcase, I was unsure if I would really have the time to also make ribs for dinner. As always, Alton Brown made his recipe for baby back ribs look very, very easy, so I figured… why not? After watching the 26th episode of Good Eats, I headed to the grocery store to get the ingredients I would need to make baby back ribs the Alton Brown way. Thankfully, for me, this meant only a few ingredients. My grocery store happened to have no baby back ribs on the shelf, so I asked the butcher, who had some stowed away in the freezer. Since only two of us would be eating, I purchased one slab. 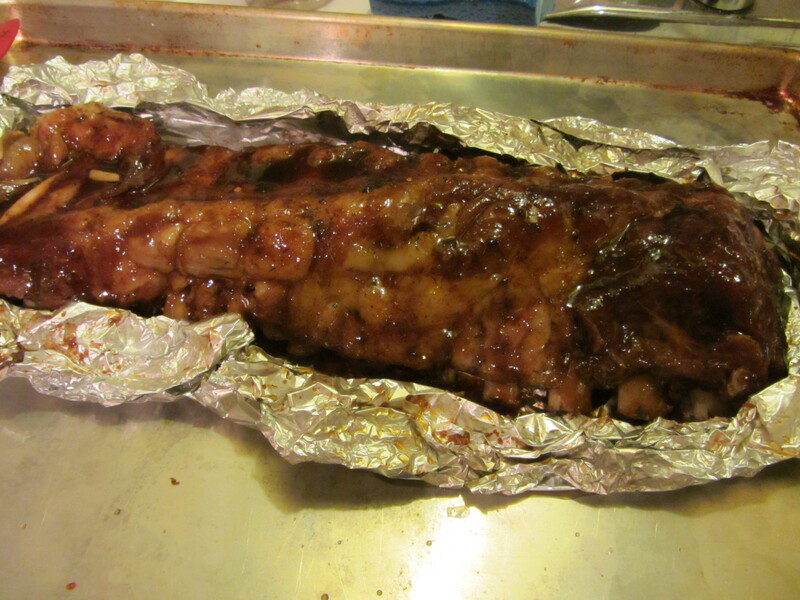 When I got home, I thawed my vacuum-sealed ribs in cold water, which really did not take too long. While my ribs thawed, I made Alton’s dry rub. If you plan to make these ribs time and again, go ahead and make a large batch of dry rub, as it will keep indefinitely. 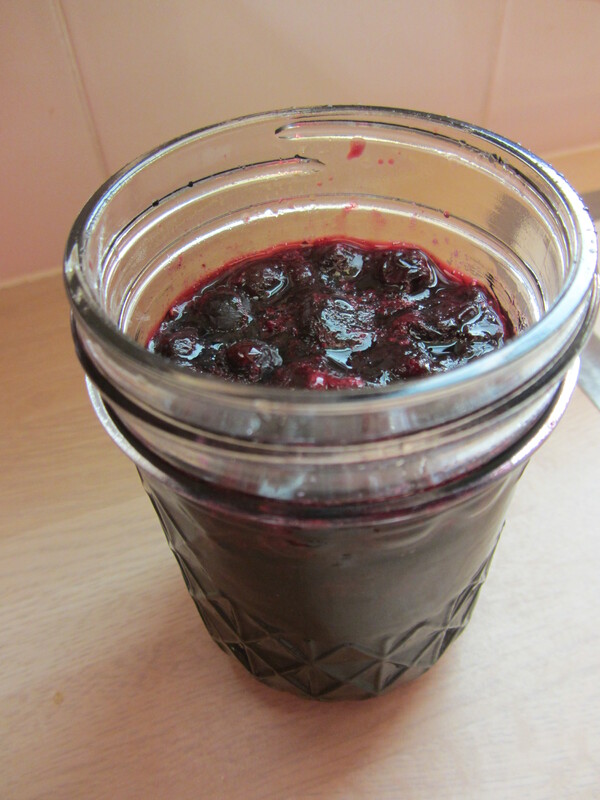 Alton mixes his ingredients in a quart-sized mason jar that he tops with two lids – the first lid has holes punched in it for sprinkling, while the second lid is solid for storage. I made a small batch of the rub since I did not know when I would be making the ribs again. 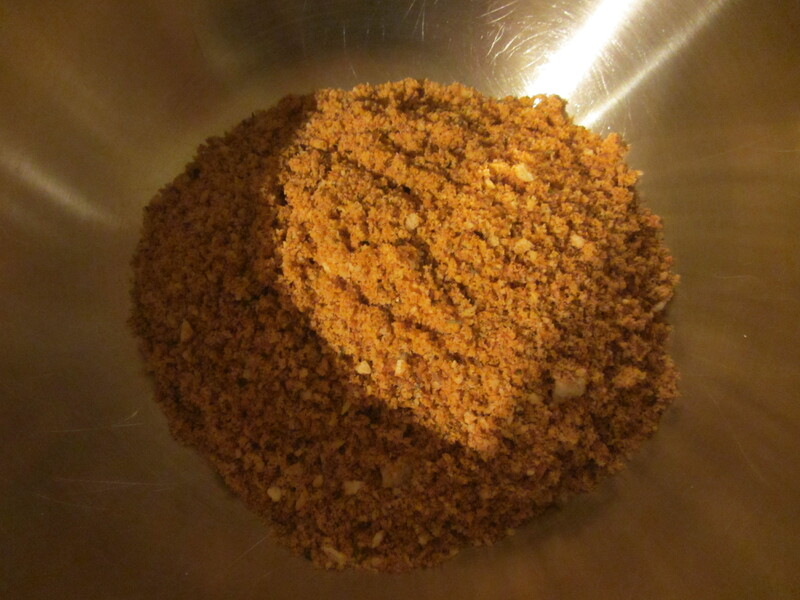 The only key with the rub is to keep the rub’s ratio the same: 8 parts light brown sugar:3 parts Kosher salt:1 part chili powder +1 part combo of black pepper, cayenne pepper, jalapeno seasoning (I used chipotle), Old Bay Seasoning, thyme, and onion powder. 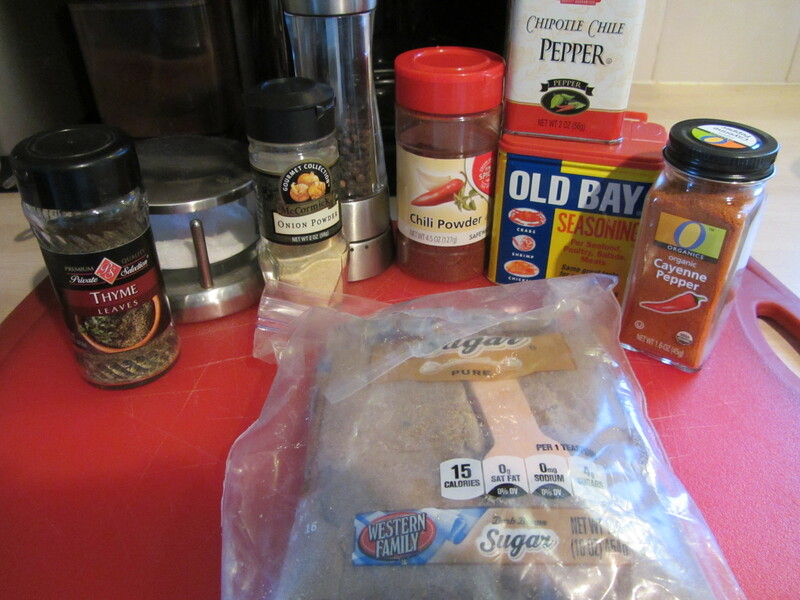 Dry rub ingredients: light brown sugar, Kosher salt, chili powder, black pepper, cayenne pepper, chipotle seasoning, Old Bay Seasoning, thyme, and onion powder. When my ribs were thawed, I placed them on a large sheet of heavy foil, which was placed shiny side down to slow heat absorption into the ribs. 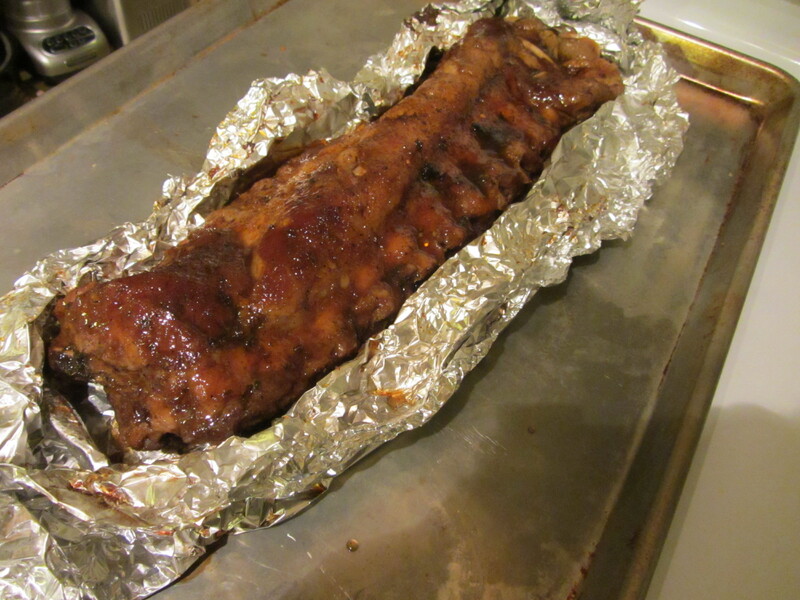 Slab of ribs on foil, shiny side down. 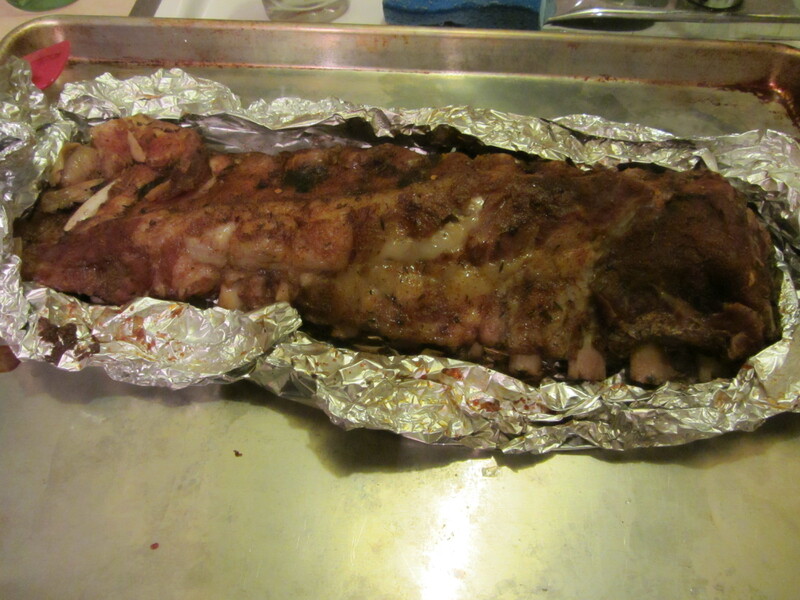 I sprinkled the top side of the ribs liberally with the dry rub, patting it gently with my hands. Ribs coated with dry rub. I flipped my ribs over and sprinkled some on the other side too, but Alton explains that the top, convex side, of the ribs is where you want to put the majority of the rub. Flipped ribs with some rub on concave side. Note: you will not use all of the rub. 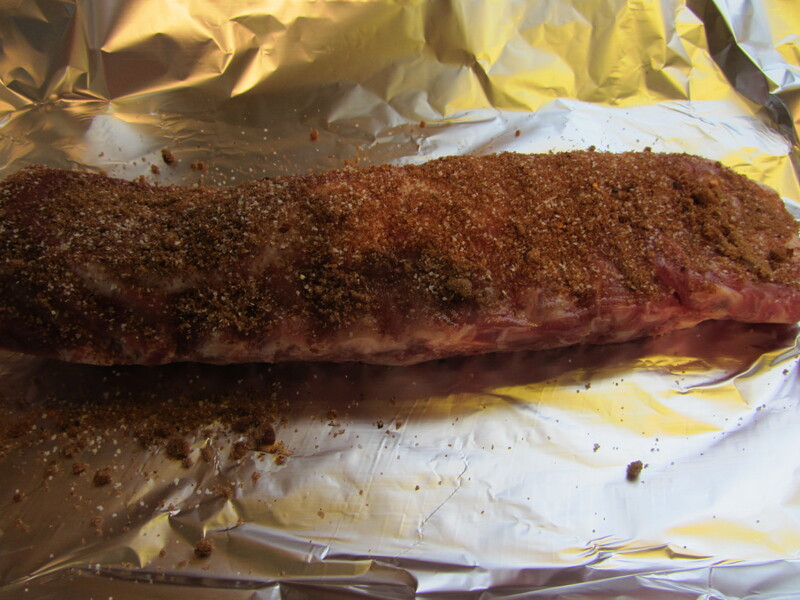 Once the ribs are coated with rub, fold the foil over the ribs and roll up the ends. Rolled up packet of ribs. 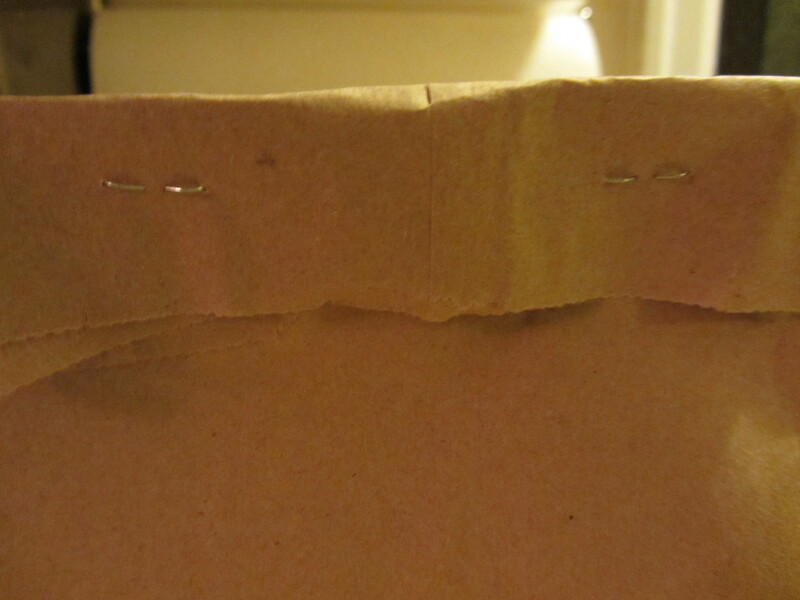 Stick the foil packet(s) in the refrigerator for at least an hour, and preferably overnight. I refrigerated my ribs for about three hours. You will want to put the packets on a baking sheet. When you are ready to cook your ribs, it is time to make the braising liquid. When braising, you only use enough liquid to keep the meat moist. Alton explains that his braising liquid is a combination of acidity, salinity, and sweetness. 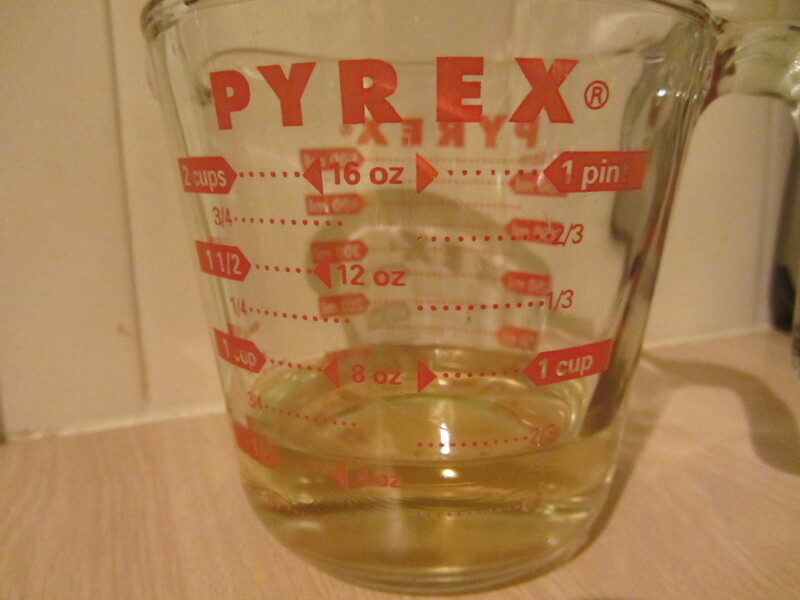 For the acidity, he uses white wine and white wine vinegar. 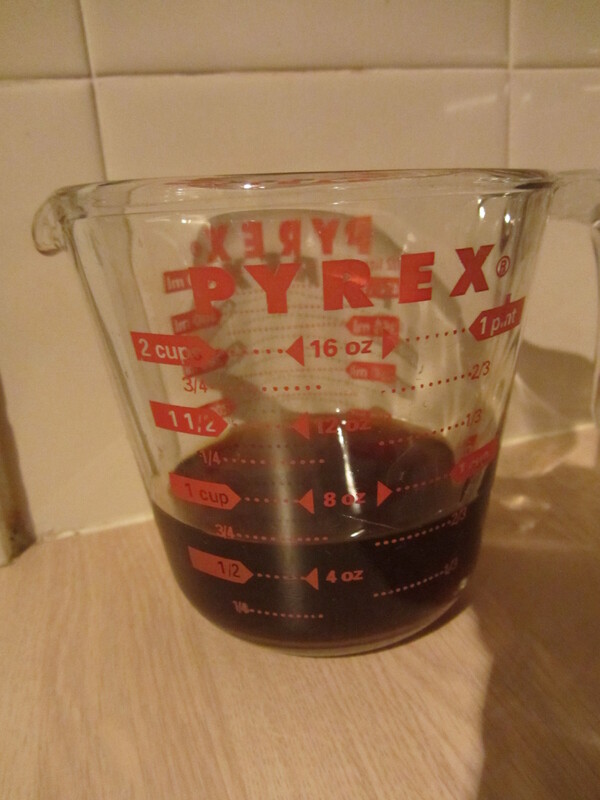 Worcestershire sauce gives the liquid its salinity, while the sweetness comes from honey. 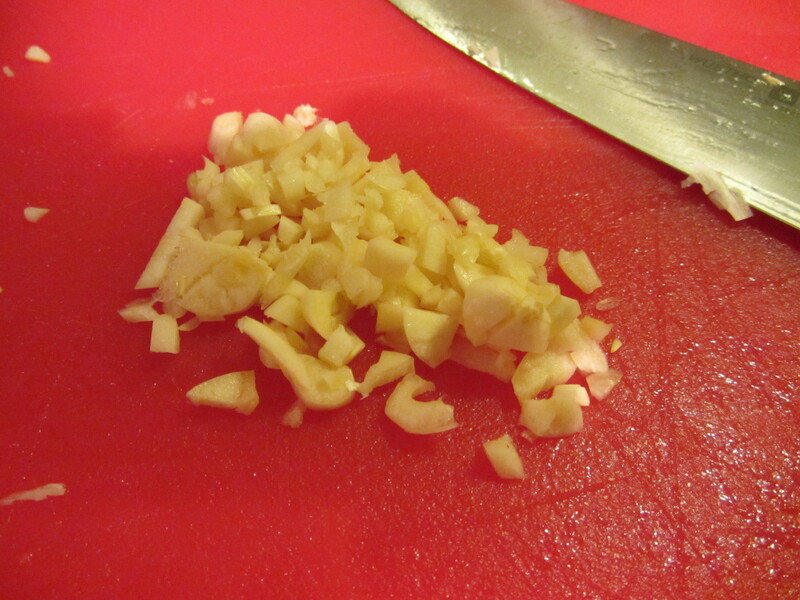 Oh, and you add some garlic, which Alton says needs no reason. 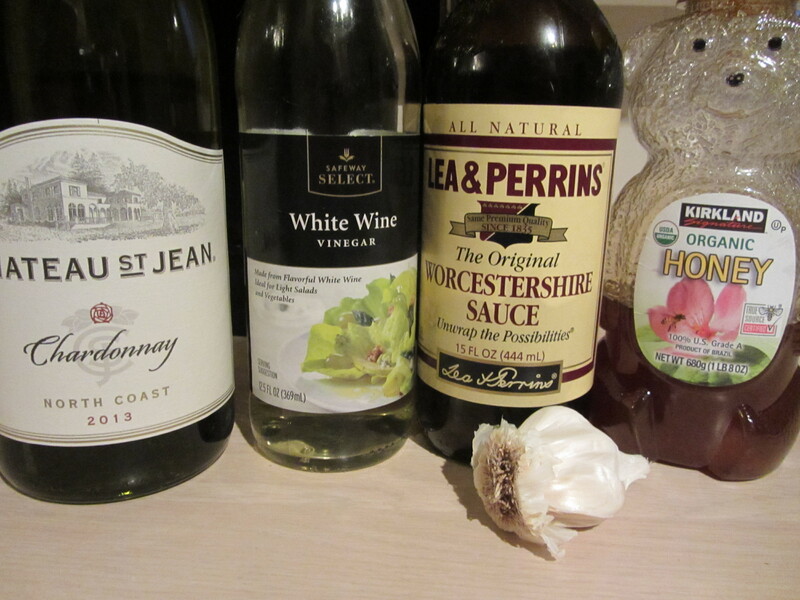 Braising liquid ingredients: white wine, white wine vinegar, Worcestershire sauce, honey, and garlic. The braising liquid goes into the microwave for a minute or so until everything is dissolved, and then you pour it into one end of your rib packet, using the foil like a funnel, and lightly tilting the pan to let the liquid run through the foil packet. Using the foil like a funnel for the braising liquid. 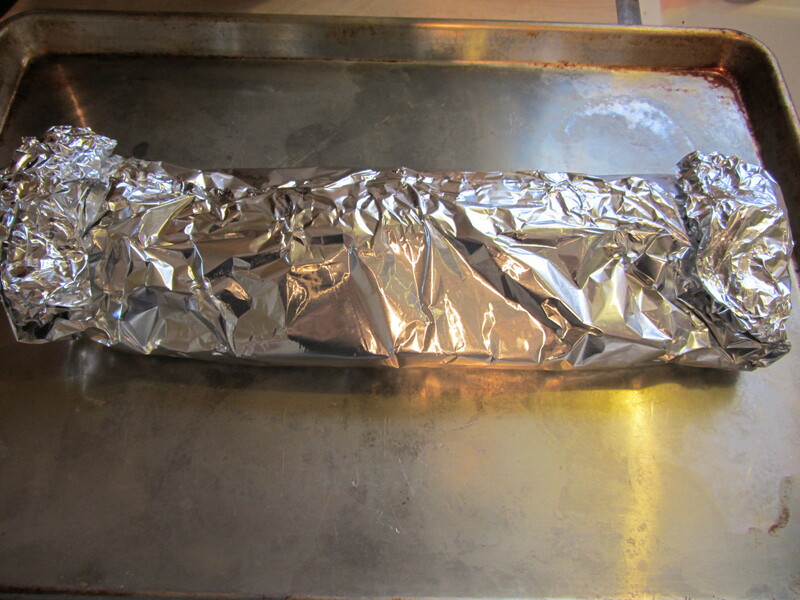 You close the foil packet back up, and it goes into a 225-degree oven for 2.5 hours. Alton stresses that you do not want to try to speed up this process, as slow cooking is critical. It is also a good idea to check the temperature of your oven. I checked my oven temperature with the new infrared thermometer I got for Christmas. To check for doneness, open the rib packet and twist a rib toward the middle of the slab; if it slightly rotates, the ribs are done. My one slab of ribs was done after 2.5 hours. After 2.5 hours in the oven. When the ribs are done, it is time to make the sauce. 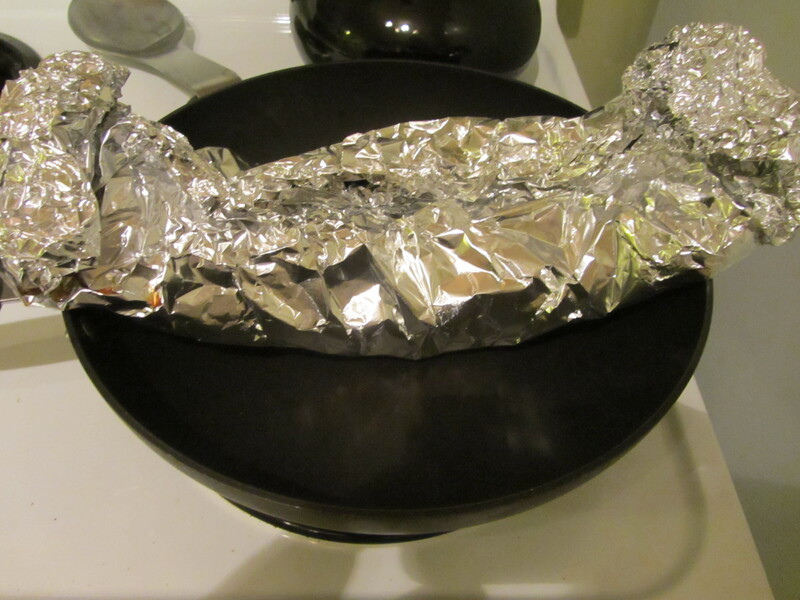 To do this, lay the rib packet over a large sauce pan and cut the foil to release the juice into the pan. I ended up with a pretty large volume of juice, and mine had a fair amount of visible fat. Placing ribs over pan to cut packet and get sauce. 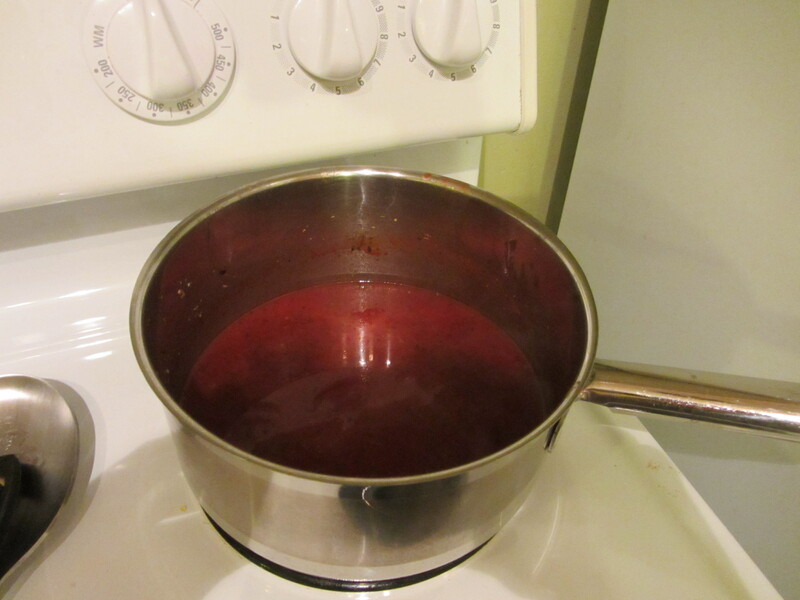 Heat the juice over high heat, letting it reduce until it is the consistency of barbecue sauce. Alton says this will take 5-10 minutes, but my sauce took a bit longer to reduce. 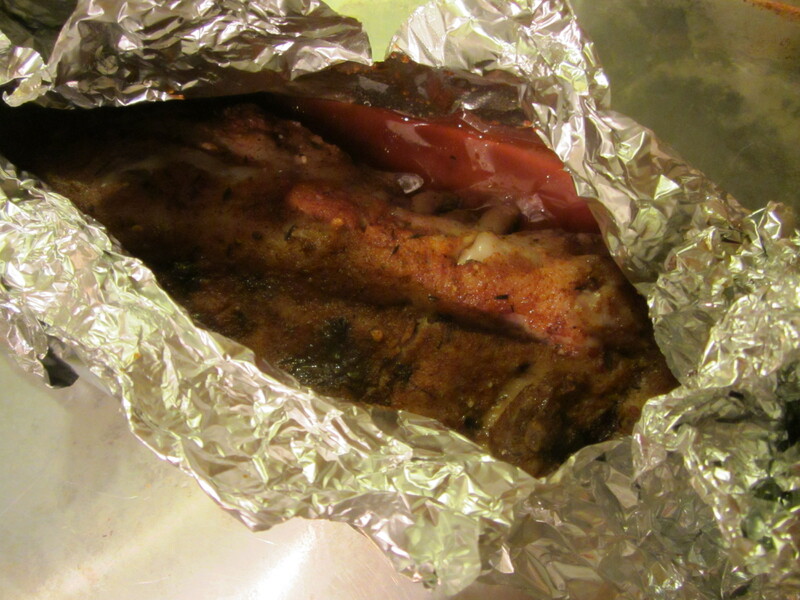 When the sauce is done, fold back the foil surrounding the ribs and paint them liberally with the sauce. You will have extra sauce. Ribs with sauce painted on. 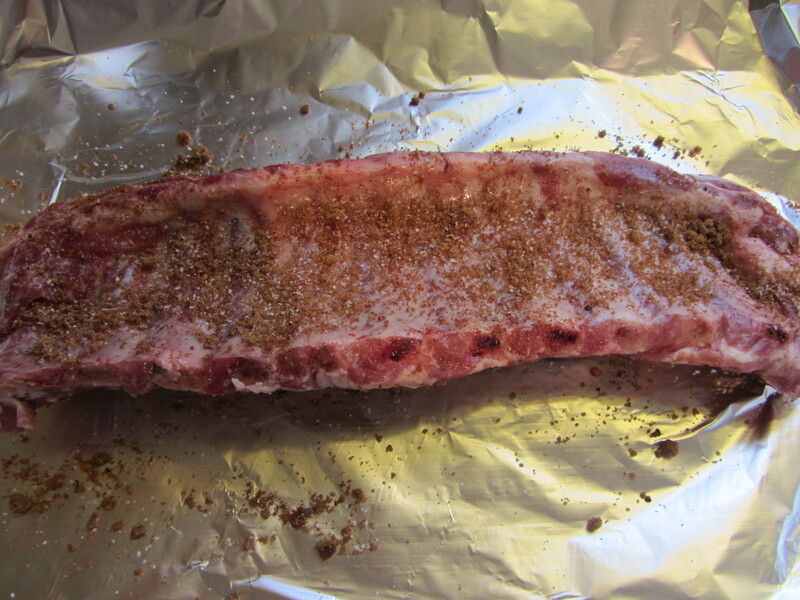 Keeping the saucy ribs exposed, stick them under the broiler, watching them carefully because they can easily burn. My ribs were under the broiler for maybe a minute before the sauce started bubbling and caramelizing. 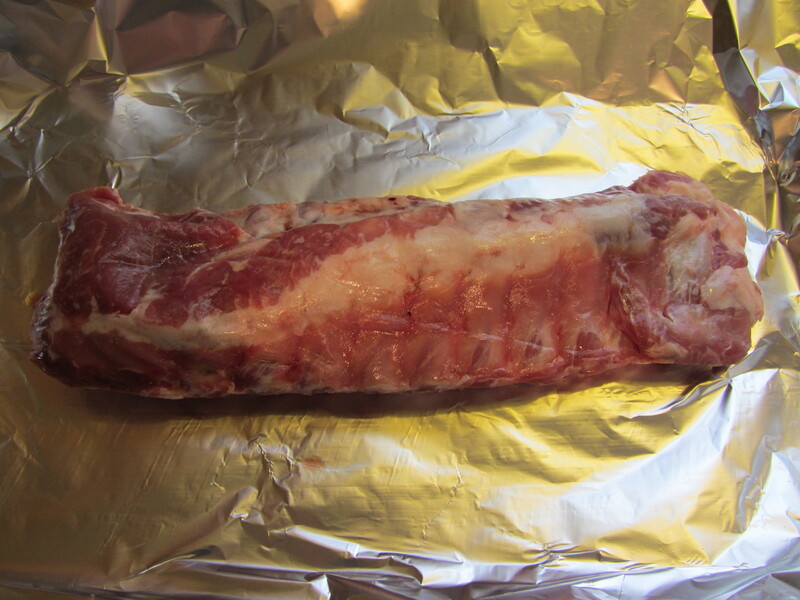 Remove the ribs from the oven and portion them into two-rib portions. Alton says he likes to portion them this way because they are easier to eat. Toss the ribs in a bowl with the extra sauce, and you are ready to eat. We ate our ribs with a side of coleslaw. They were sticky and messy – the way ribs are supposed to be. Ted thought the ribs were great, saying he would definitely make them again. I, not being a rib aficionado, thought the ribs were pretty good, though I found them to be a bit chewy. I wonder if they would be even more tender with a longer cooking period. 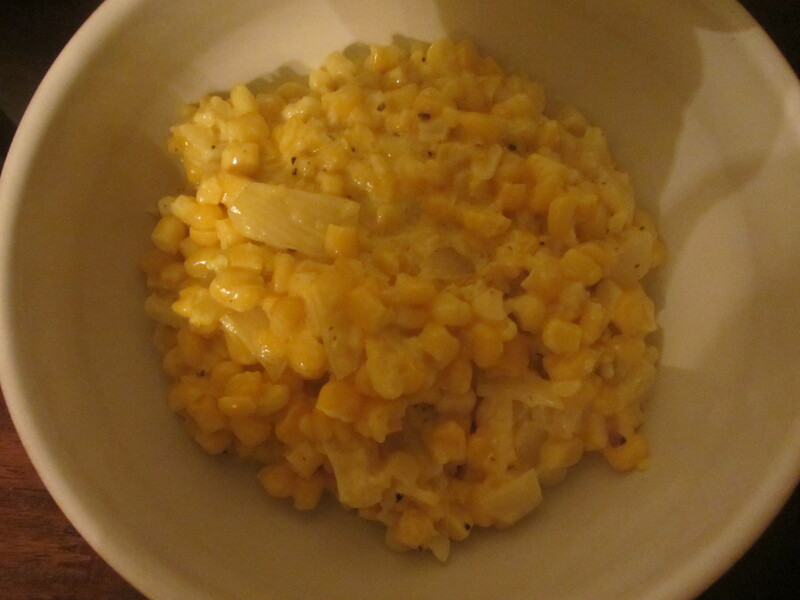 The flavor of the sauce was great – sweet, slightly tangy, and rich from the fat. 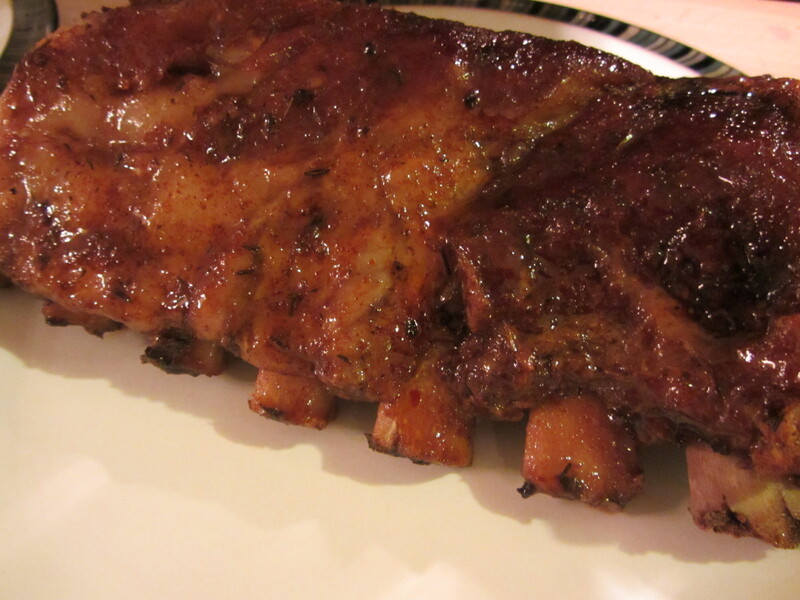 If you are a rib person, this is definitely a good recipe, and it is so easy you cannot believe it! I was very excited for this episode of Good Eats because my dad made this recipe for Ted and me several years ago. I remember telling my dad about Good Eats, thinking he would really love the scientific approach to food. My dad’s first reaction to Alton Brown, however, was to ponder who the “nerdy” guy in the Hawaiian shirt was. After watching a few episodes of the show, he became hooked and was a true Good Eats devotee. We went to my parents’ house for dinner one night several years ago and Dad told us he would be making a special dessert of Alton’s. Sure enough, it was Alton’s banana split. Dad was critical of his recipe outcome, but we all thought it was great. Needless to say, I was excited to try making this dessert myself. 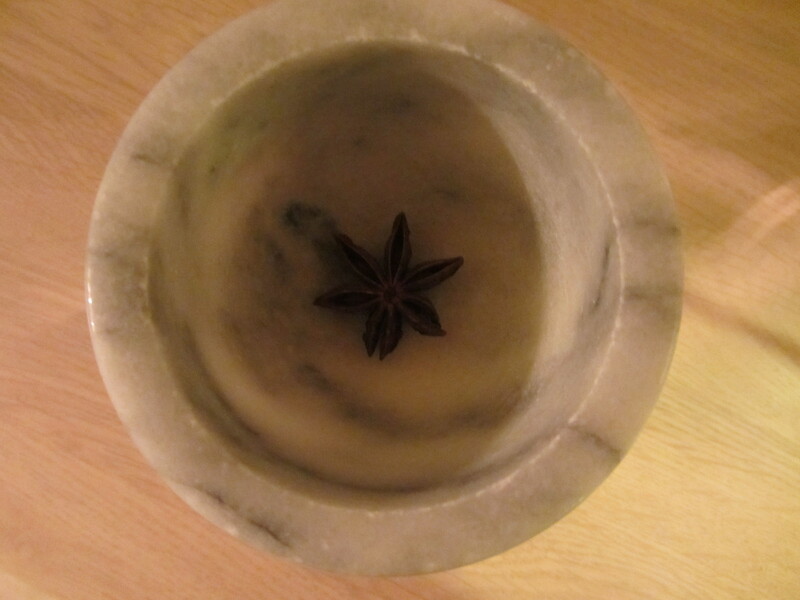 The star ingredient of the 25th (Have I really done that many already?) episode of Good Eats is sugar. One recipe is featured in this episode, but it features sugar in a few applications. 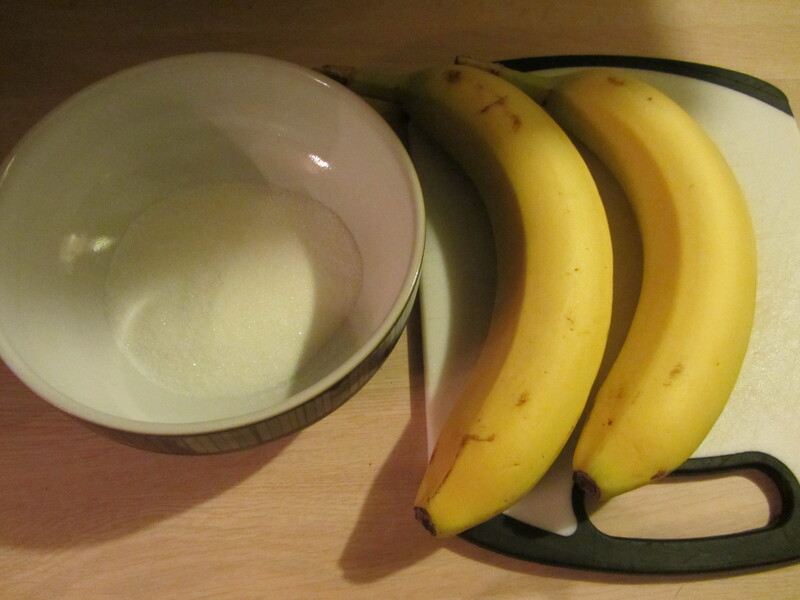 To start this recipe, you make the candy garnishes, or “doodads” as Alton calls them, for your banana split. 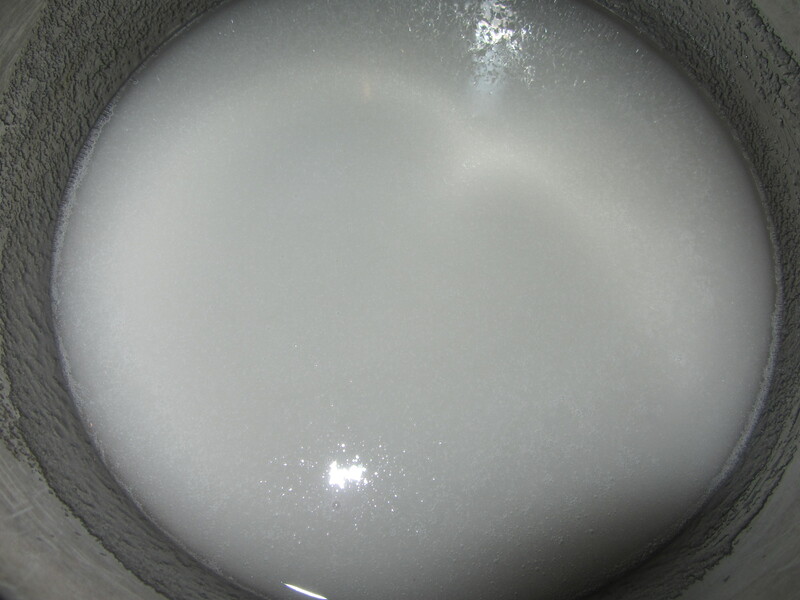 You put sugar in a saucepan, adding water until you have the consistency of wet sand. The online recipe calls for a full cup of water, but this will give you a consistency that is far thinner than what you desire. I used a half cup of water, at most. 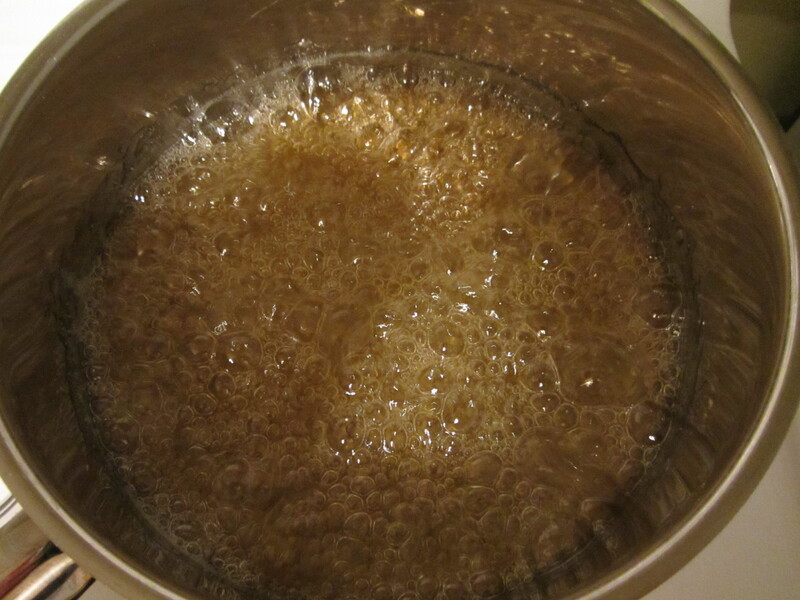 Oh, and you want to add ~ 1 T of corn syrup to this mixture, as it will prevent the sugar from recrystallizing. Sugar, corn syrup, and water. 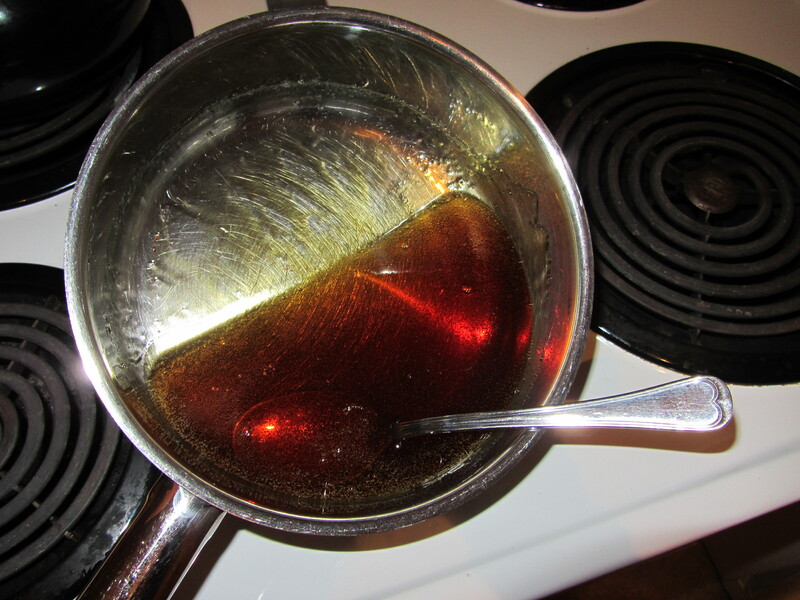 Heat this sugar syrup over high heat until the sugar dissolves. If you have a candy thermometer, you will want to use it at this point. I made a mistake in using too wide of a pan, so my thermometer was not submerged. 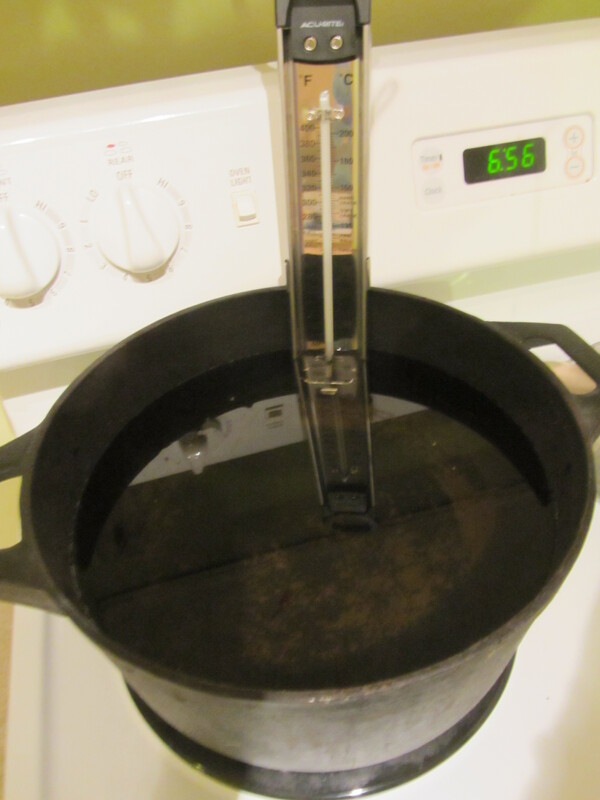 Heating the sugar syrup, but my thermometer was not submerged enough. 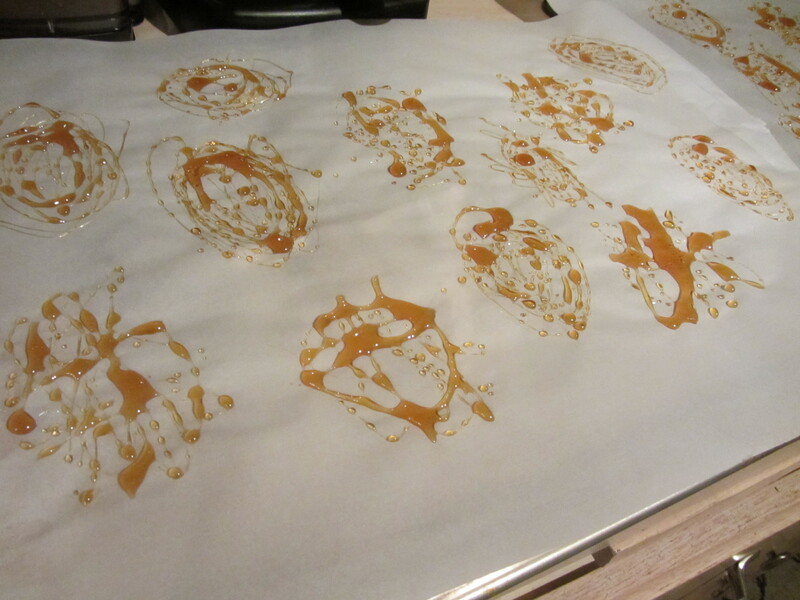 This left me to go by my eye, but I do not recommend that method if you have not made candy or caramel before. 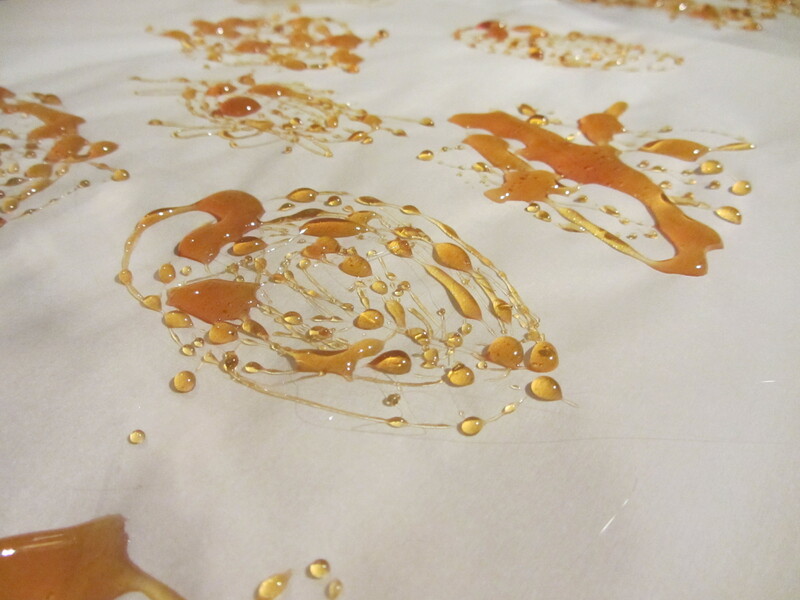 While your syrup heats, prepare two sheet pans by turning them over and covering them with parchment paper. 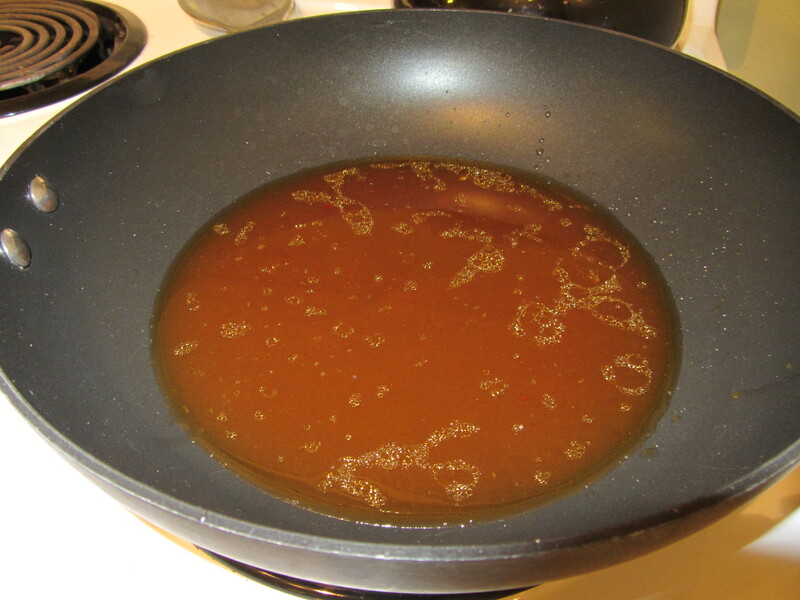 When your syrup hits ~300 degrees, you can begin to swirl the pan. Until this point, you want to leave the syrup alone. 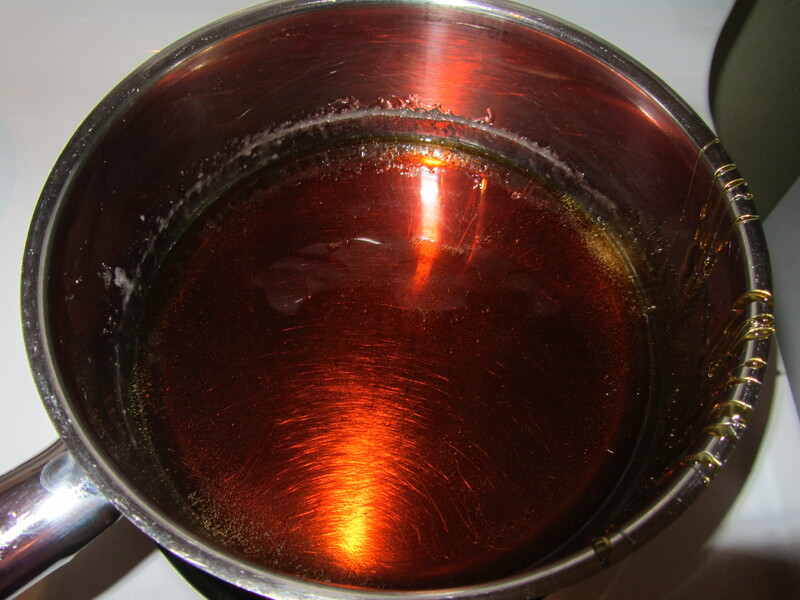 You will know that your syrup is approaching 300 degrees, as it will start to turn amber in color. When your syrup reaches 340 degrees, remove it from the heat. It will be a deep amber by this point. 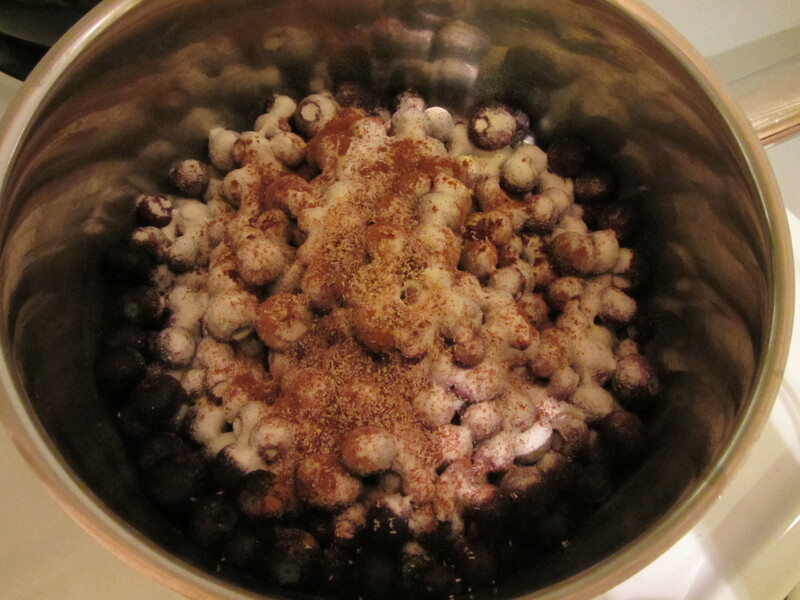 Stir the mixture slowly, as you do not want to incorporate too much air; this can result in cloudy candy. 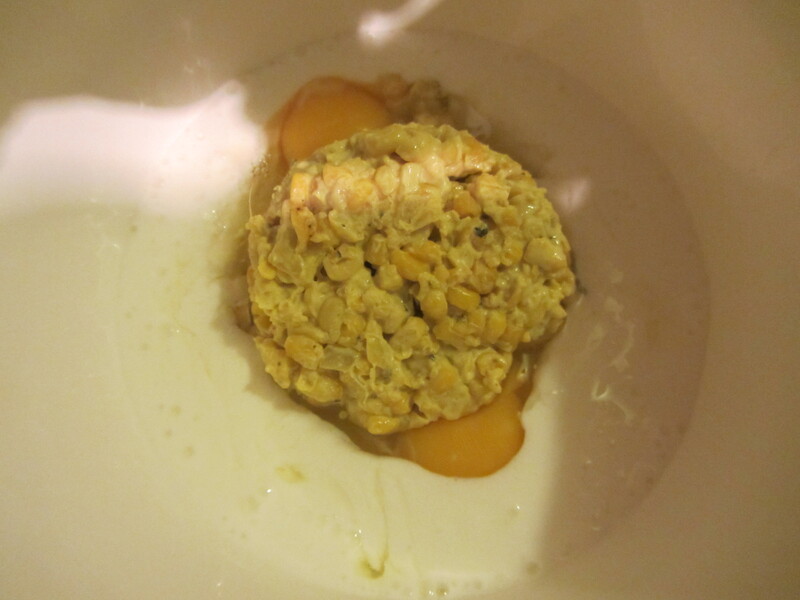 Continue to stir the mixture until it falls from a spoon in a steady stream. Around 340 degrees. Cooling the syrup by stirring gently. 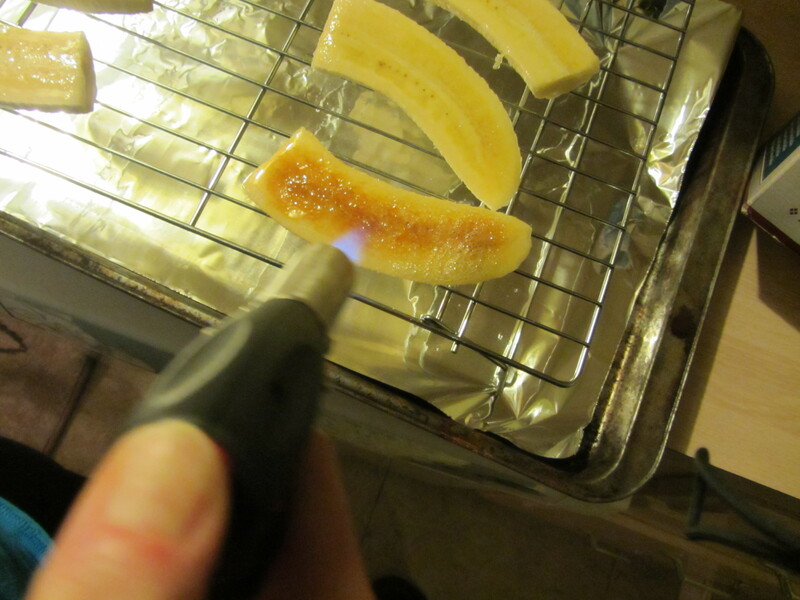 When your syrup has reached this point, you want to make your “doodads” by swirling the syrup over the parchment paper, creating abstract sugar art to accessorize your banana splits. I found that I should have waited an additional minute or so before starting my doodads because they were easier to make as the syrup cooled more. Do not over-obsess about your doodads, as they will likely not be perfect, nor will they all look alike. Once your doodads are made, allow them to cool on the parchment. While your doodads cool, put the remaining syrup back on the heat until you see faint wisps of smoke; when this happens, remove the pan from the heat and add an equal amount of heavy cream. The caramel will bubble and hiss. Syrup back on the heat. Cream added once smoke was seen. I added nearly 2 C of cream, roughly guessing as to how much cream to add. 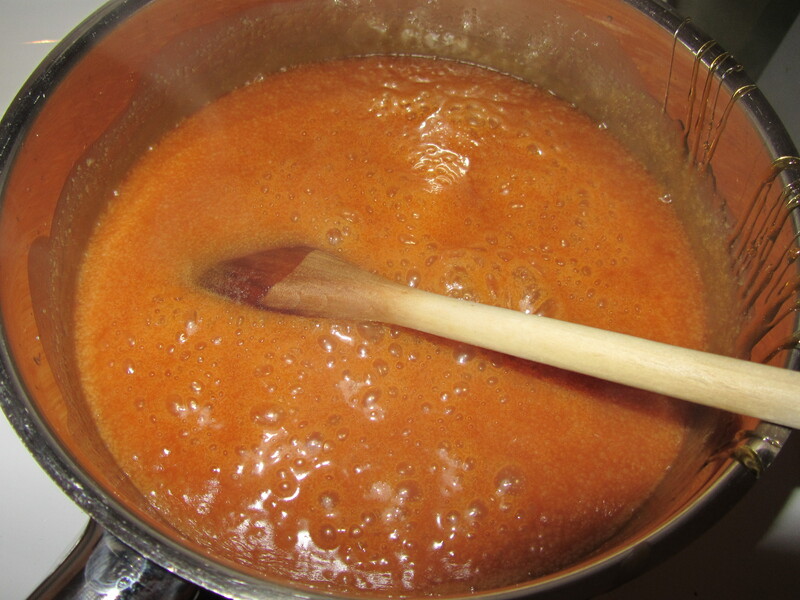 Put the caramel back over the heat and cook for ~3 minutes, stirring occasionally. 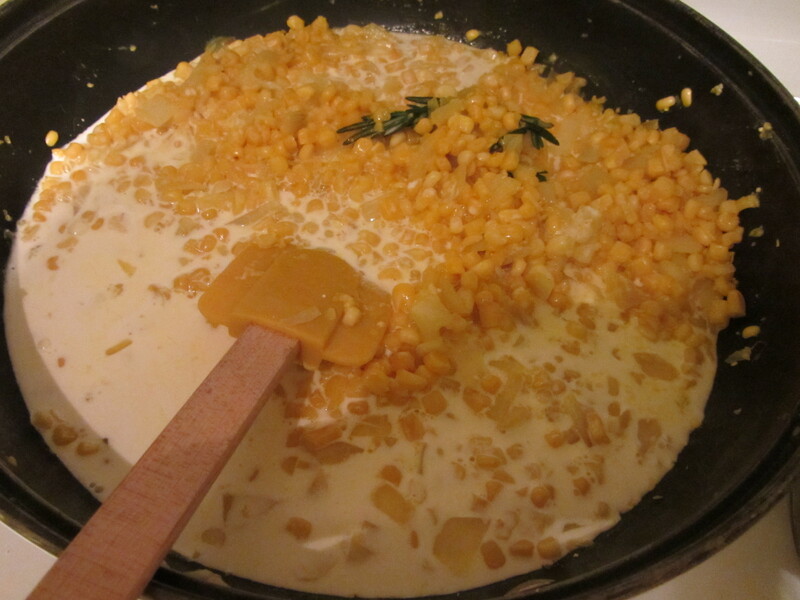 Do not be alarmed if a glob of caramel seems to be in the bottom of the pan, as it will melt again when you put it back over the heat. The sauce for the dessert is now complete. If possible, make this in advance, so it has time to cool down. 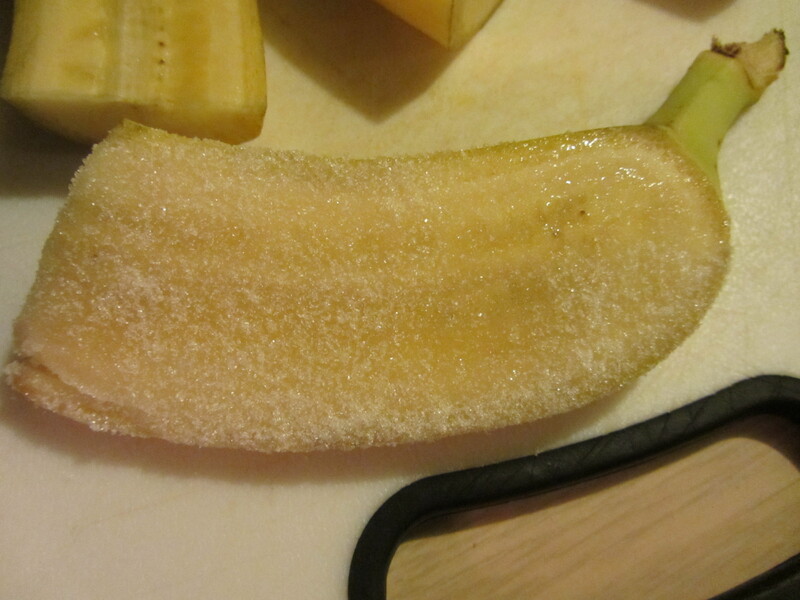 When ready to serve dessert, quarter one banana per person, leaving the peels on. 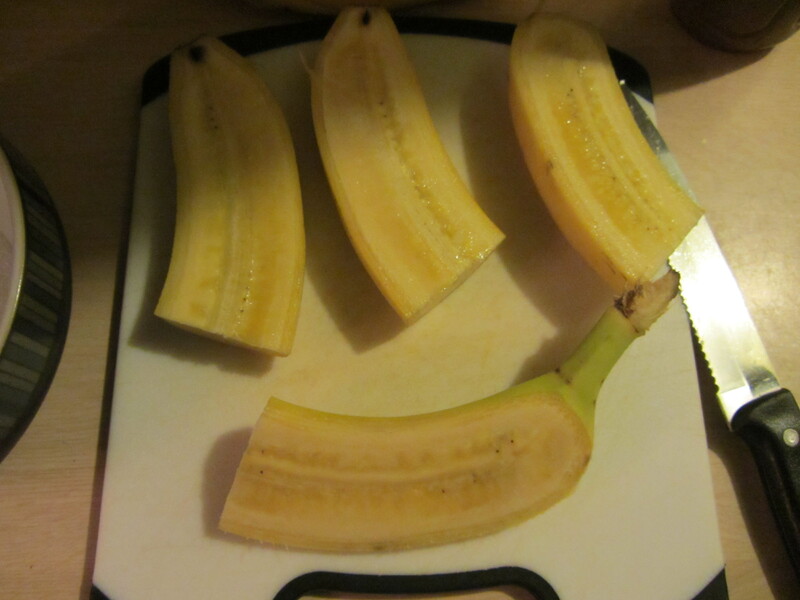 One banana, quartered, per person. 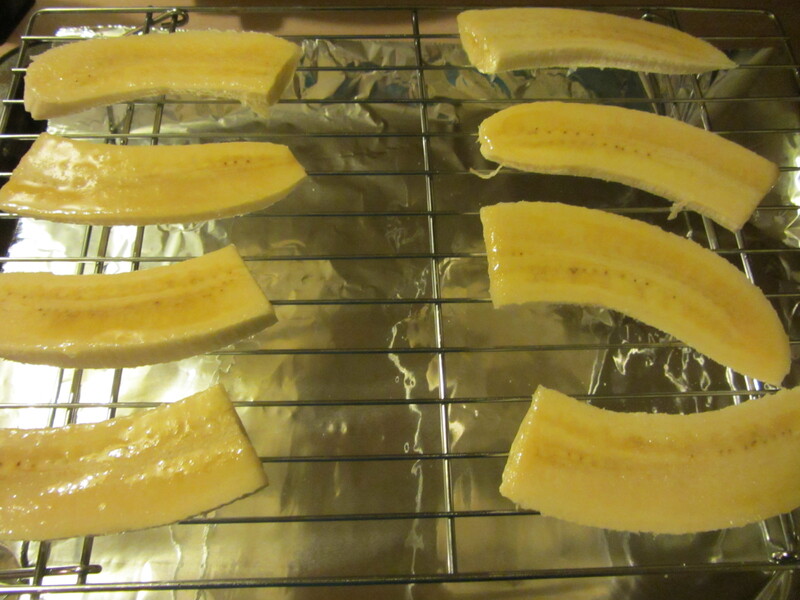 Rub the exposed surfaces of the bananas in sugar, and then remove the peels. 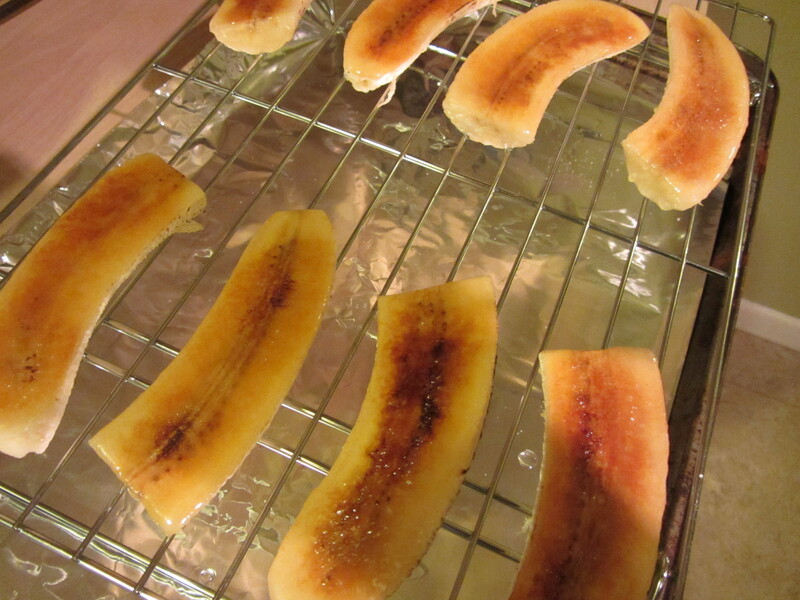 Place the sugared bananas on a rack over foil, and brulee them with a torch until they are golden brown. 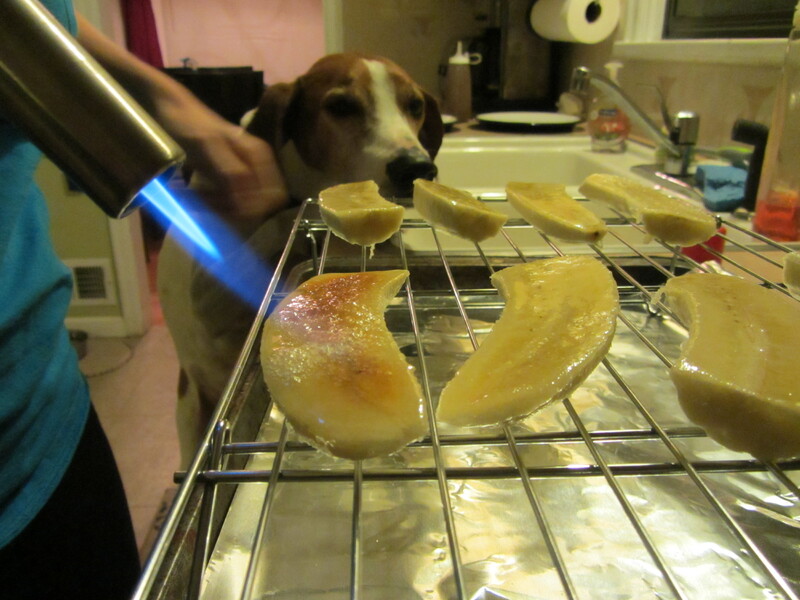 Torching the bananas, with a helper. At this point, all of the components of your dessert are ready. 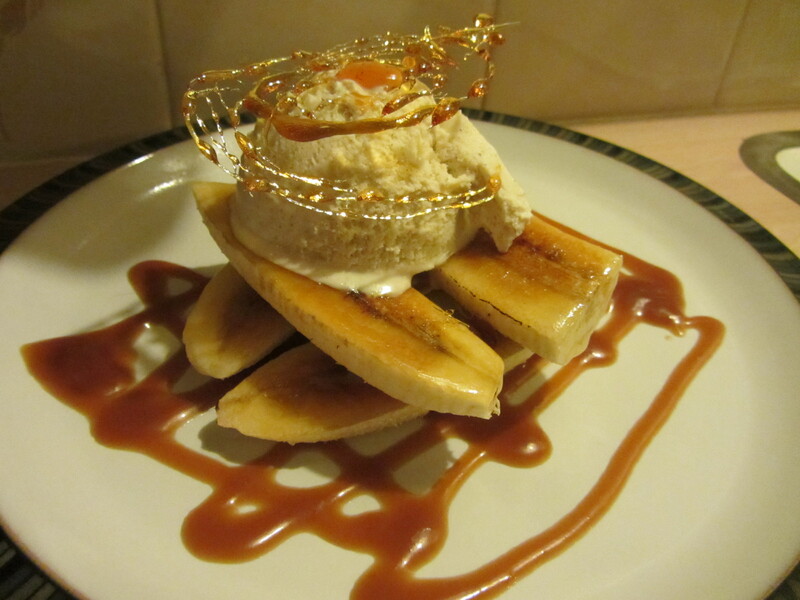 For plating, put the caramel sauce in a squeeze bottle and squirt it in a decorative pattern on the plate. Top the sauce with four banana pieces, layered like Lincoln logs in two layers. Add a scoop of ice cream (I used store-bought vanilla, or you could use Alton’s vanilla ice cream recipe), and top with a doodad. 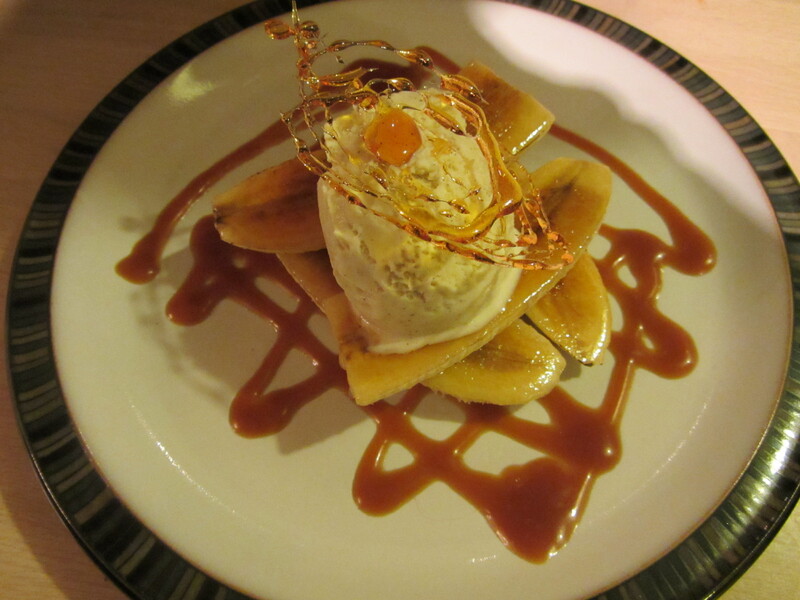 We ate these banana splits as dessert after a regular weeknight dinner, and the dessert definitely stole the show. The great things about this dish are the contrasting textures and temperatures. 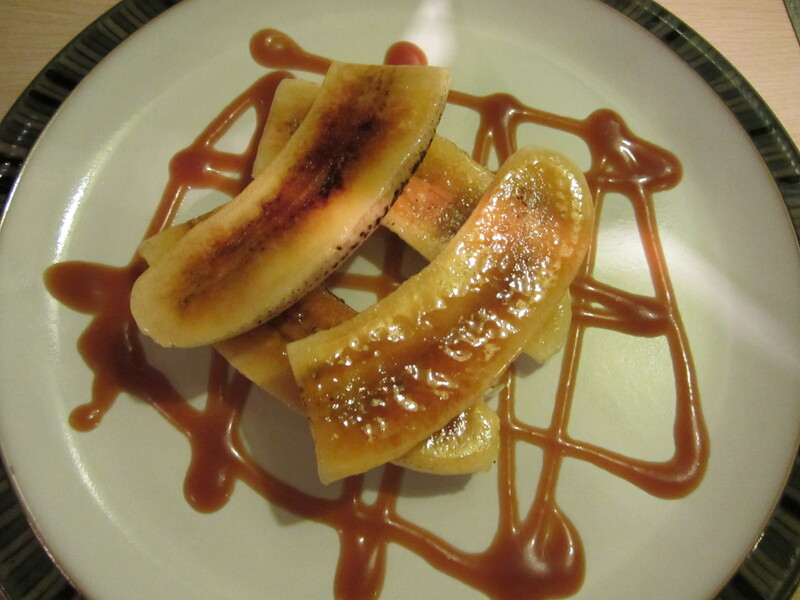 While the caramel sauce is smooth, sweet, and smokey, the bananas are warm, moist, and coated with a crunchy shellac. In addition to the bananas, you have cold ice cream and a crunchy doodad. This is a great dessert, and I would definitely make it again. The resulting presentation is impressive, especially given the effort put in. I can see why my dad wanted to make this when he originally watched the episode. It is a great dessert. The 24th episode of Good Eats is all about tomatoes. Specifically, Alton Brown makes a case for the value of canned tomatoes in the pantry, arguing that fresh tomatoes should really only be used when they are in their peak season and locally grown. Why would one opt for canned tomatoes when fresh tomatoes are readily available in the produce department year-round? Alton points out that “fresh” does not necessarily equal “ripe.” I see his point, as a tomato purchased in December in Washington has not ripened naturally, but rather has been artificially ripened by exposure to ethylene gas. While these tomatoes may look shiny and red, they are often rock hard and lacking flavor. In contrast, with canned tomatoes, you know you are purchasing fruit that was picked when ripe. While nothing compares to a fresh tomato from your own garden, we pretty much always have canned tomatoes in our pantry, as we often through them in soups, pasta sauces, etc. 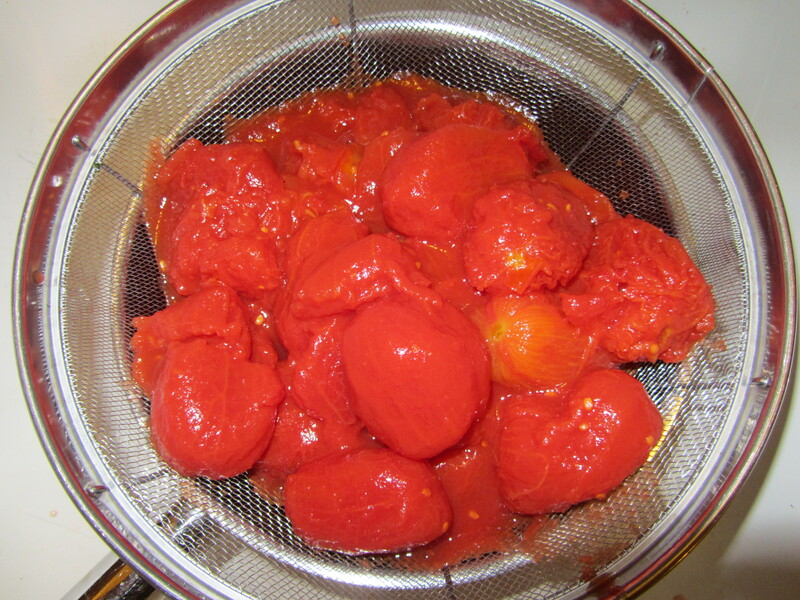 In this episode, Alton makes an all-purpose tomato sauce, using canned tomatoes. For making a tomato sauce, it is best to use canned tomatoes that have had the least cooking, which rules out pureed and stewed tomatoes. 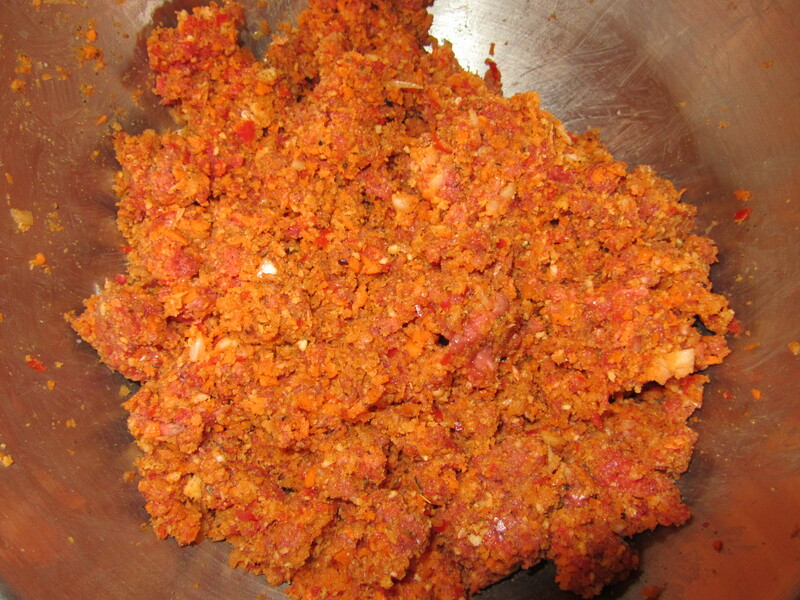 Crushed tomatoes are also not a great option, as they have many of their seeds, which can contribute some bitterness to a sauce. That leaves diced and whole tomatoes, and Alton opts for whole tomatoes because they are less processed than diced tomatoes. 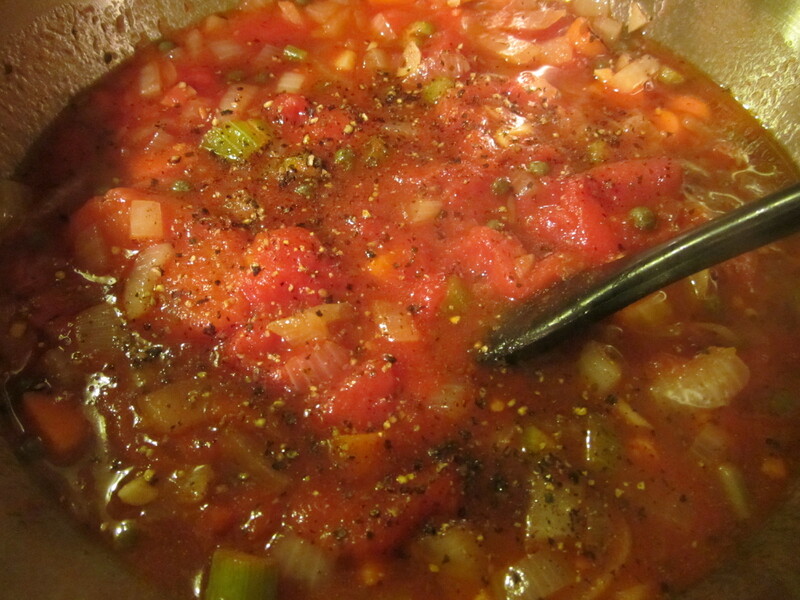 Tomato sauce ingredients: canned whole tomatoes, sherry vinegar, sugar, red pepper flakes, oregano, basil, onion, carrot, celery, olive oil, garlic, capers, white wine, Kosher salt, and black pepper. 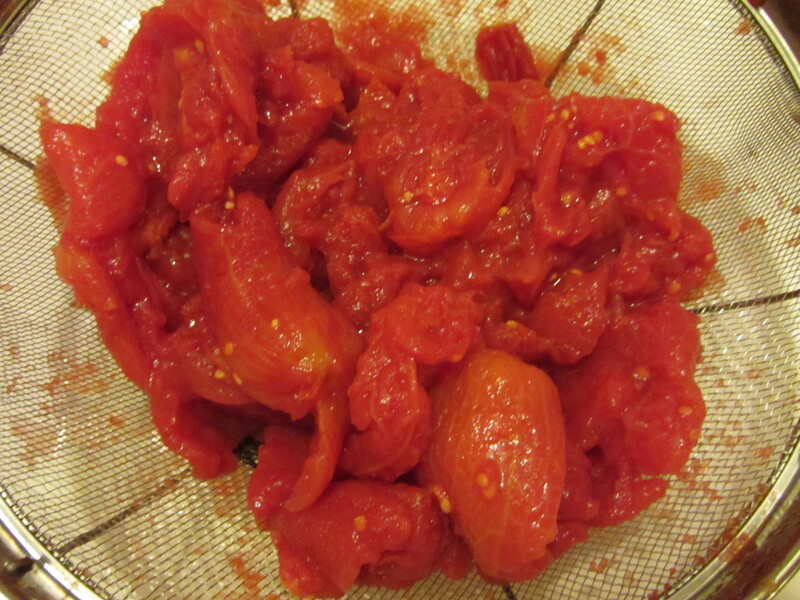 To start this recipe, strain your canned tomatoes into a saucepan. Split the tomatoes open with your fingers and scrape the seeds into the drain, getting rid of as many seeds as possible. 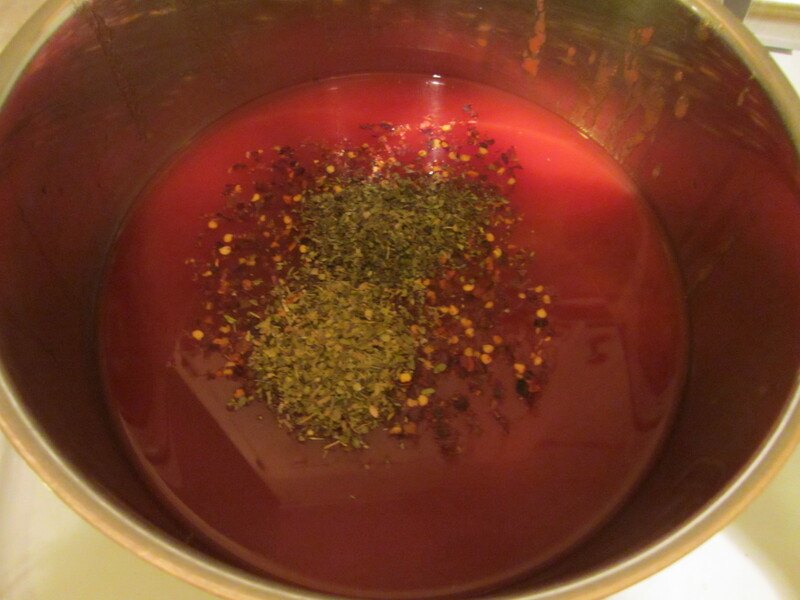 To the tomato juice in the pan, add sherry vinegar, sugar, red pepper flakes, oregano, and basil. I had trouble finding sherry vinegar, but finally found it at a natural market. Tomato liquid plus sherry vinegar, sugar, red pepper flakes, oregano, and basil. 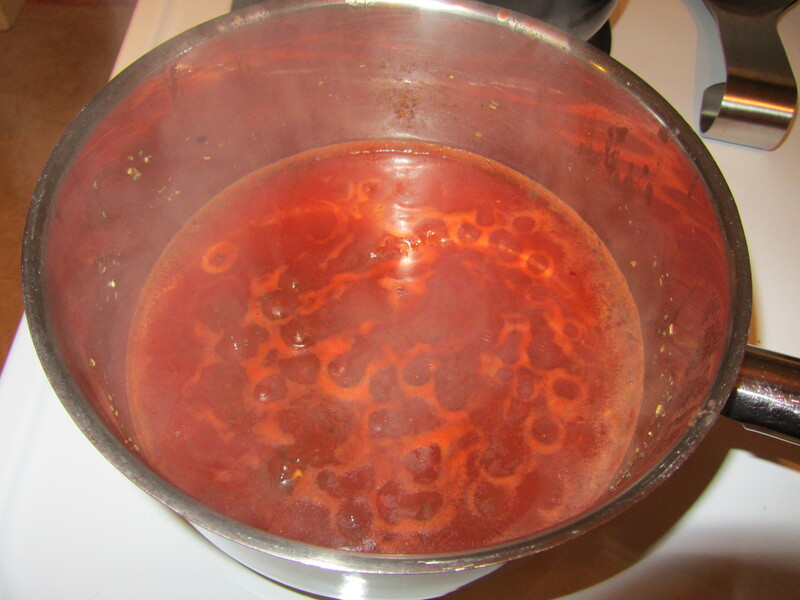 Heat this tomato liquid over high heat until bubbles stack up and then reduce the heat to a simmer. 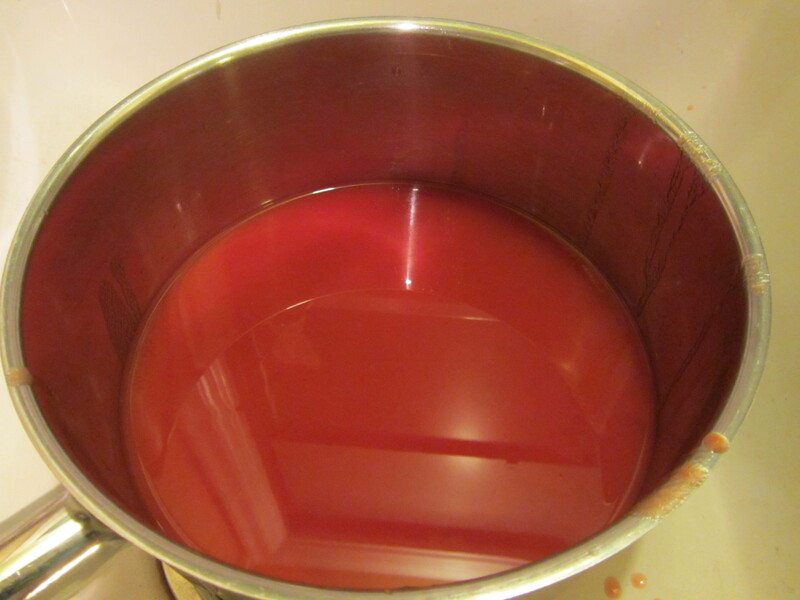 You will want to cook this liquid until it reduces by 50%, and then remove it from the heat. While your tomato syrup reduces, it is time to prep the mire poix, which is the classic French combination of onion, celery, and carrot. 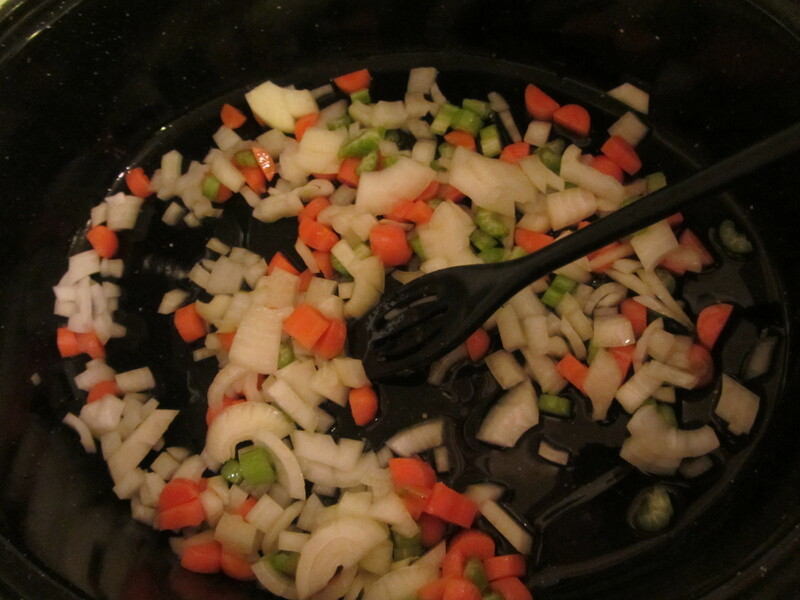 The ideal ratio for a mire poix is two parts onion to one part carrot and celery. 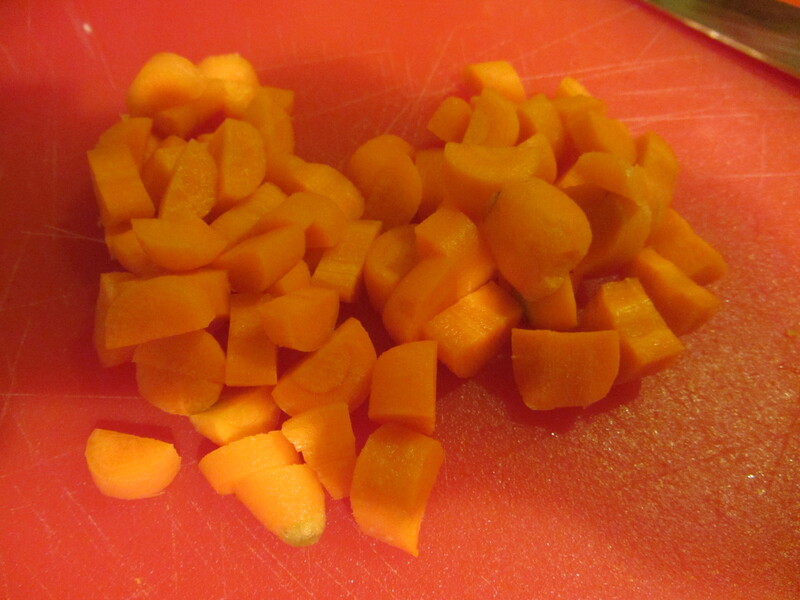 Chop the carrot first, as it will take the longest to cook, and add it to a roasting pan set over two burners. 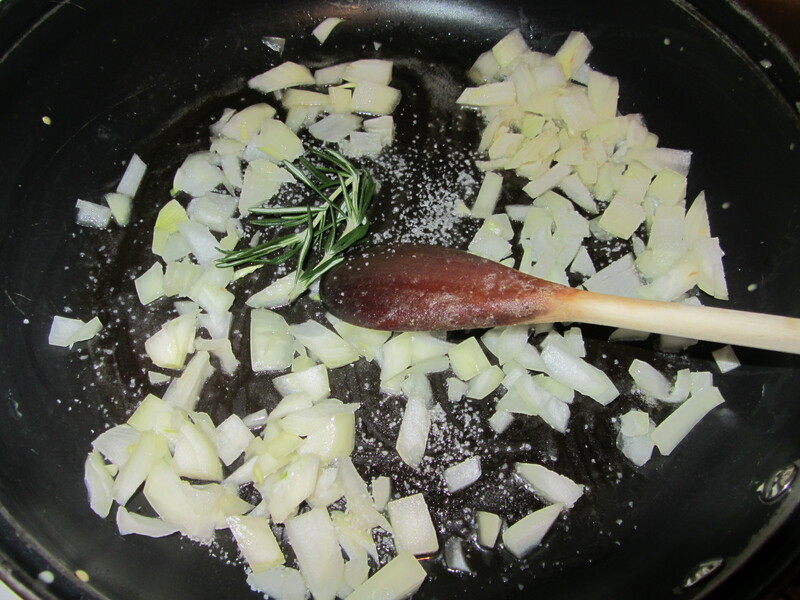 Coat the bottom of the pan with olive oil, and let the carrot start to sweat while you chop the onion and celery. 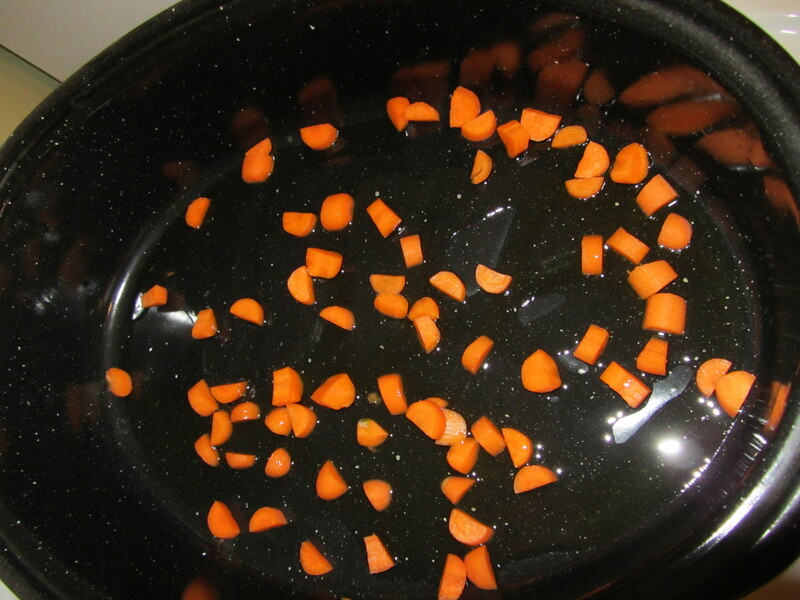 Carrot in roasting pan with olive oil. 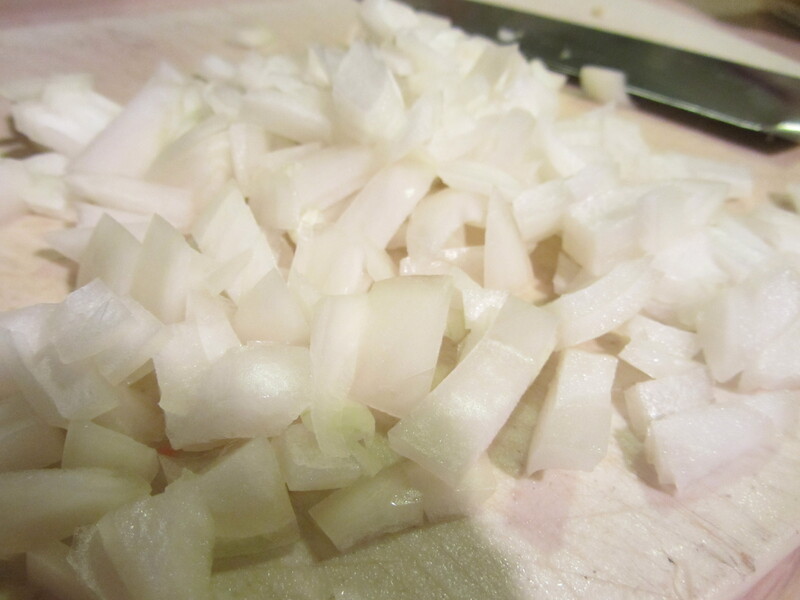 It is ideal to cut the vegetables uniformly, so they will cook evenly. 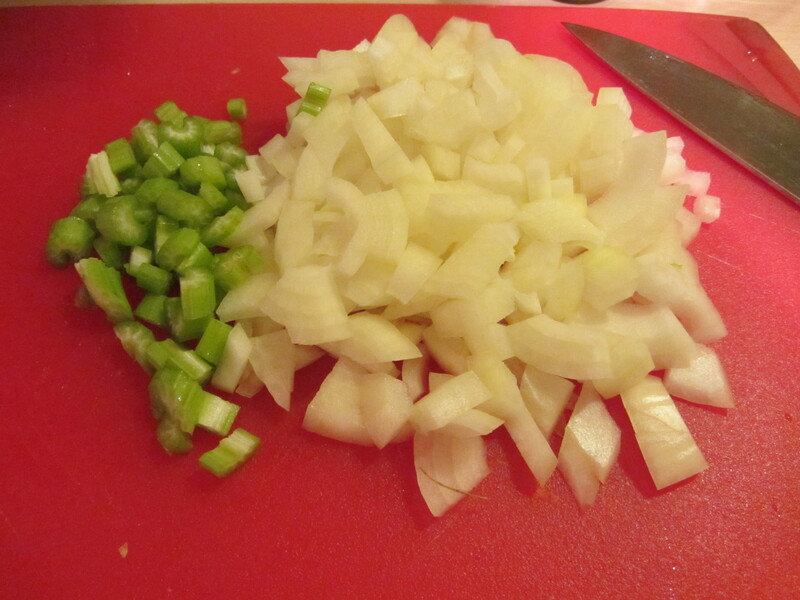 Add the onion, celery, and four gloves of garlic to the pan. Mire poix in the roasting pan. 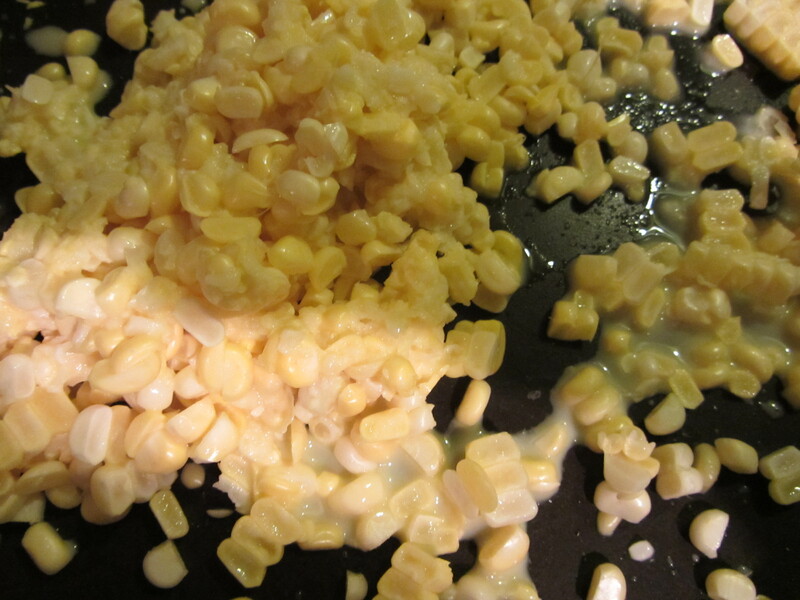 Alton simply smashed his garlic with a marble slab, but I opted to chop my garlic since I knew I would not be pureeing my sauce, and therefore did not want huge chunks of garlic in the sauce. 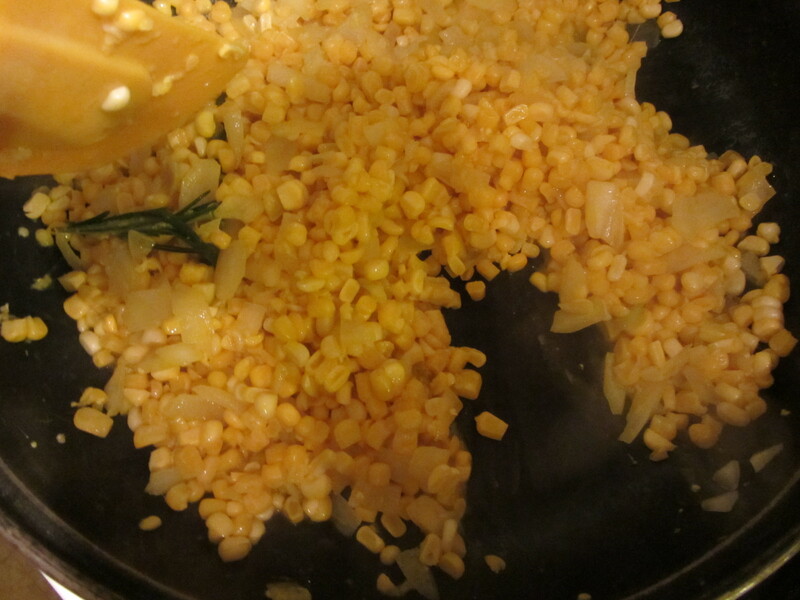 Continue sweating the mire poix for about 15 minutes, or until the vegetables are tender. 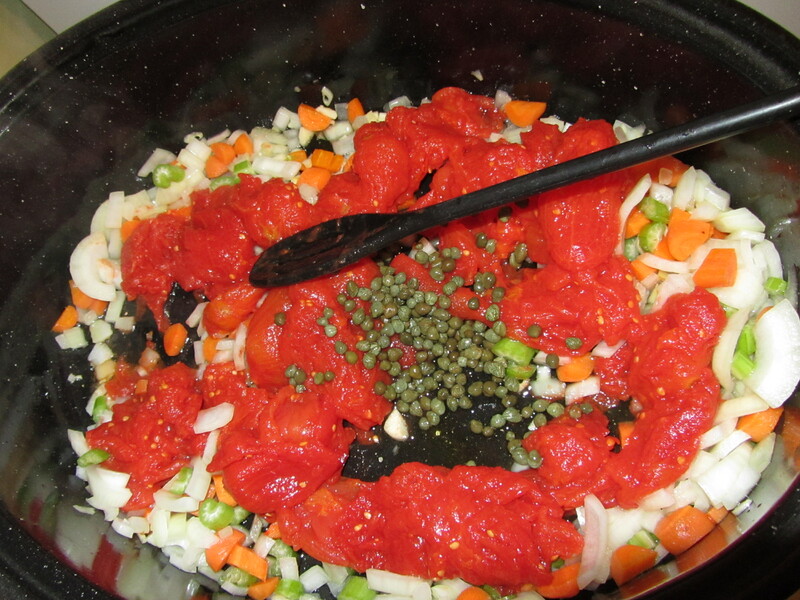 At this point, add your tomatoes and capers to the pan and put the pan under the broiler. 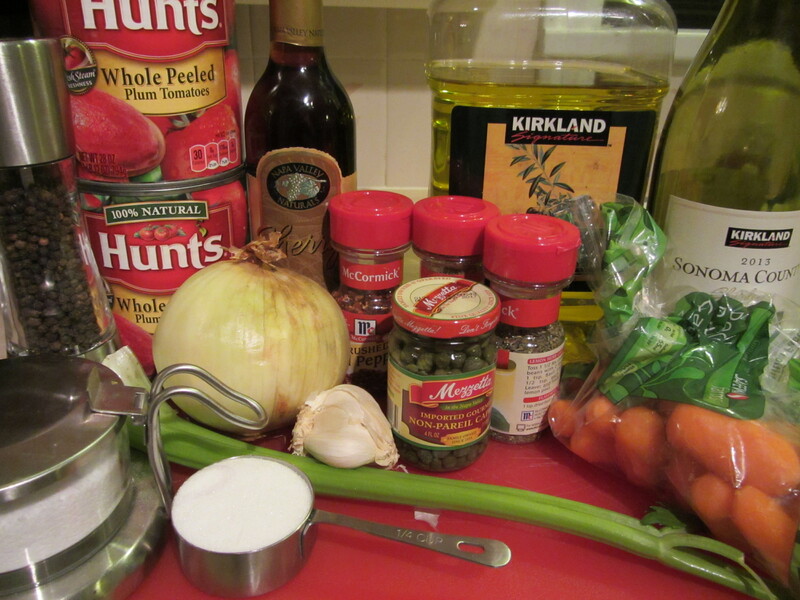 Tomatoes and capers added to vegetables. Broil the vegetable mixture until the tomatoes start to caramelize, which should take 15-20 minutes. You will want to stir the vegetables every five minutes or so. When the vegetables are done, remove the roasting pan from the oven and add some white wine. 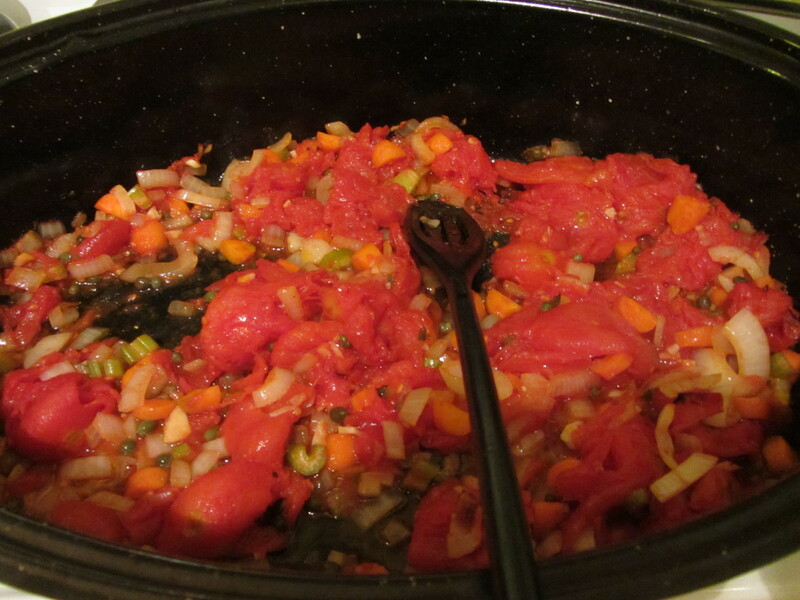 This will serve to release some alcohol-soluble flavors from the tomatoes, giving the sauce more dimension. 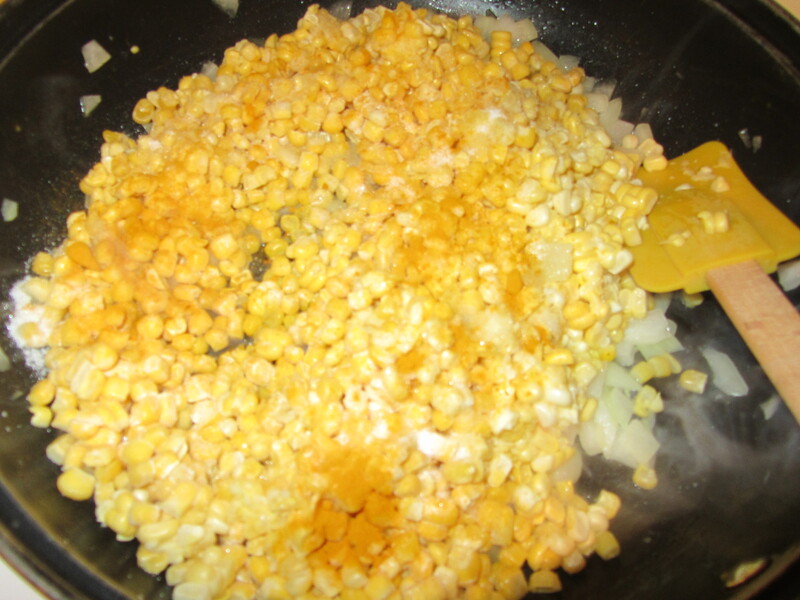 Combine the cooked vegetable mixture with the reduced tomato syrup, add some black pepper, and mix. You may need to add some Kosher salt too, which I did. Combined syrup and vegetables, plus black pepper. Depending on the end use of your sauce, you can leave the sauce as it is, mash it lightly with a potato masher, or puree it completely. As we were to be eating our sauce over pasta, I took Alton’s recommendation to lightly mash the sauce, leaving it with some texture. 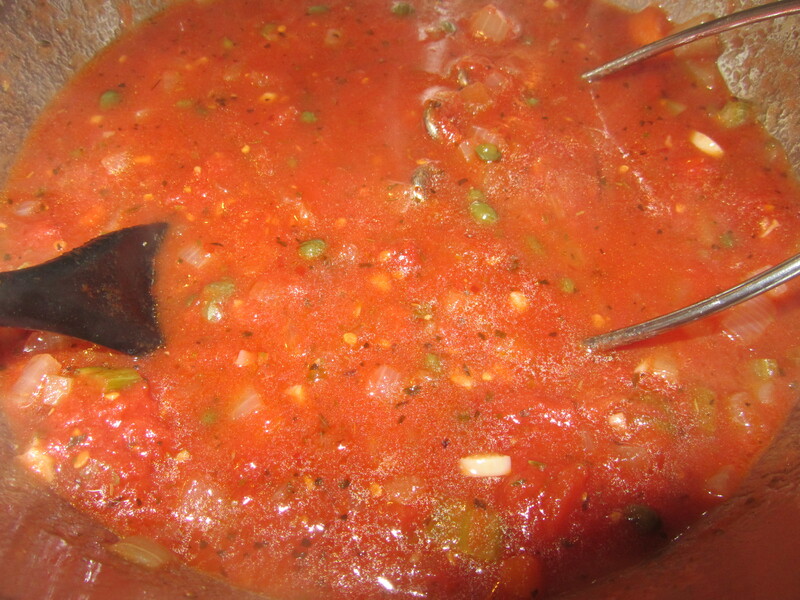 Completed sauce after light mashing. 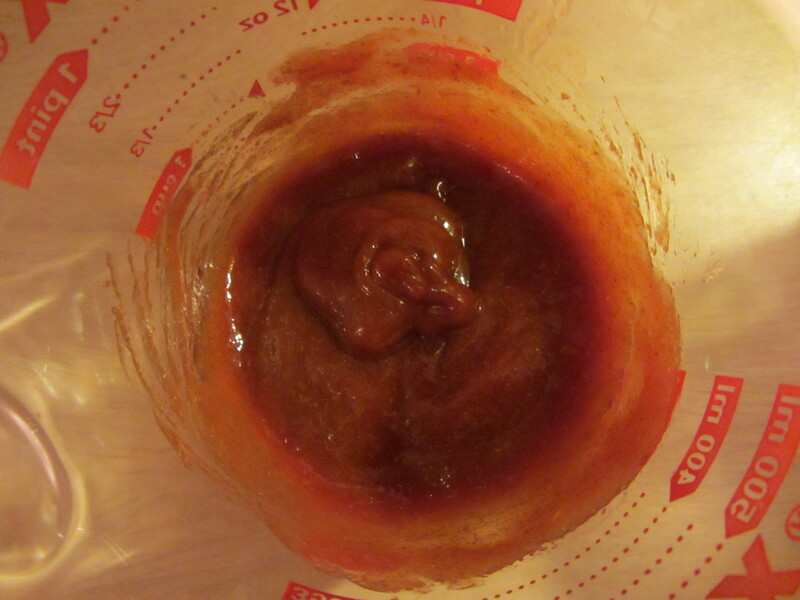 For a pizza sauce, or to cook meatballs in the sauce, you would want to puree the sauce to a smooth consistency. 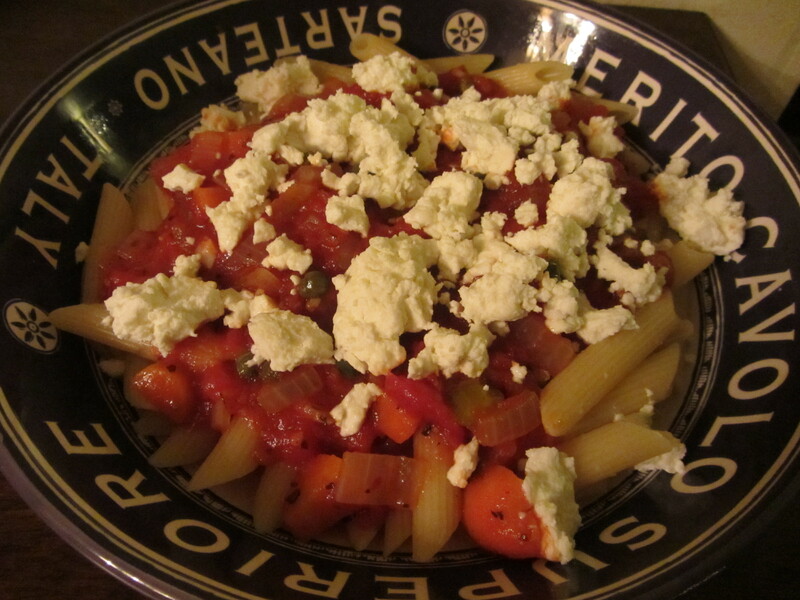 I served my tomato sauce over penne pasta, and sprinkled a little (okay, maybe a lot) of goat cheese over the top. Tomato sauce over penne with goat cheese. Ted and I thought this was a great tomato sauce. The vegetables gave it some texture, it was slightly sweet, had some heat from the red pepper flakes, and tang from the capers. As someone who frequently throws together pantry tomato sauces, this is one I will be adding to my repertoire. 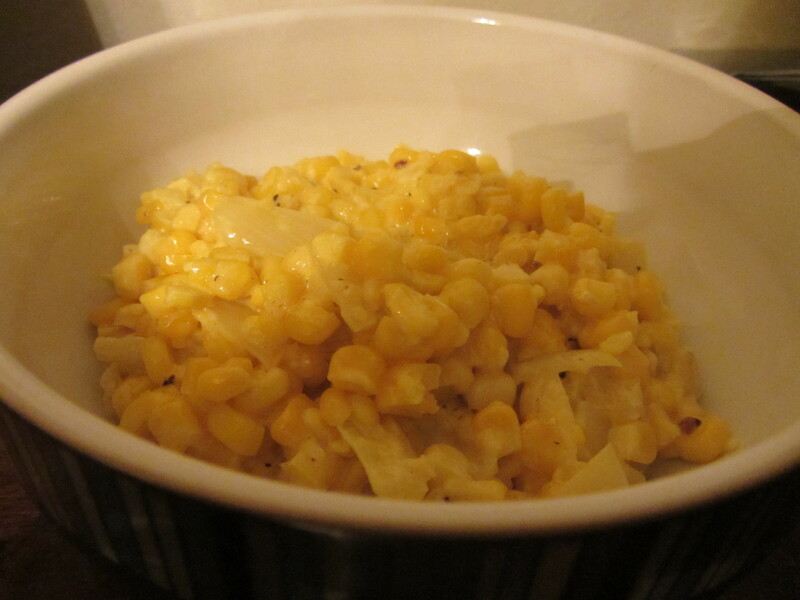 I will make this again, puree it, and freeze in batches for homemade pizza. If you are looking for an easy, healthy, year-round tomato sauce that tastes much better than commercial jarred sauces, be sure to give this one a go. As a side note, I prepped my pasta for our dinner per Alton’s newer recommended method, which I mentioned in my previous pasta post here. 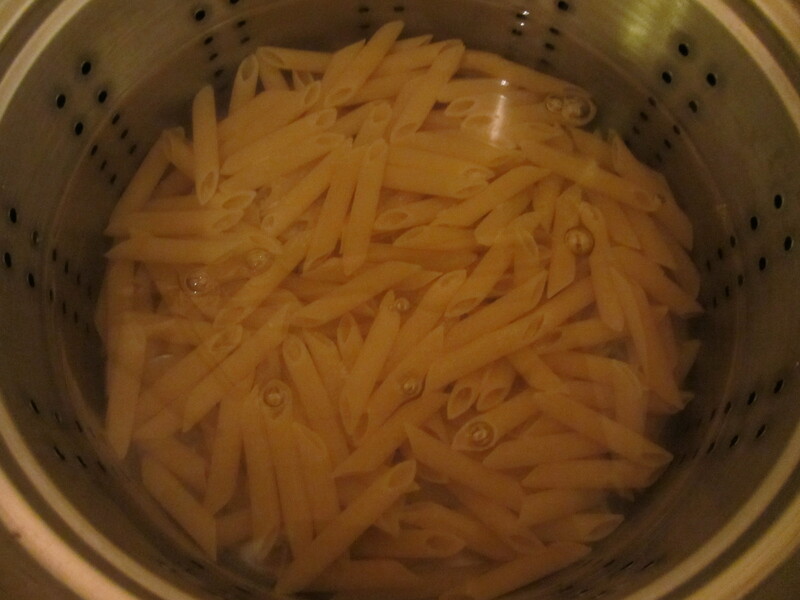 Alton argues that there is no reason to boil water prior to cooking pasta. 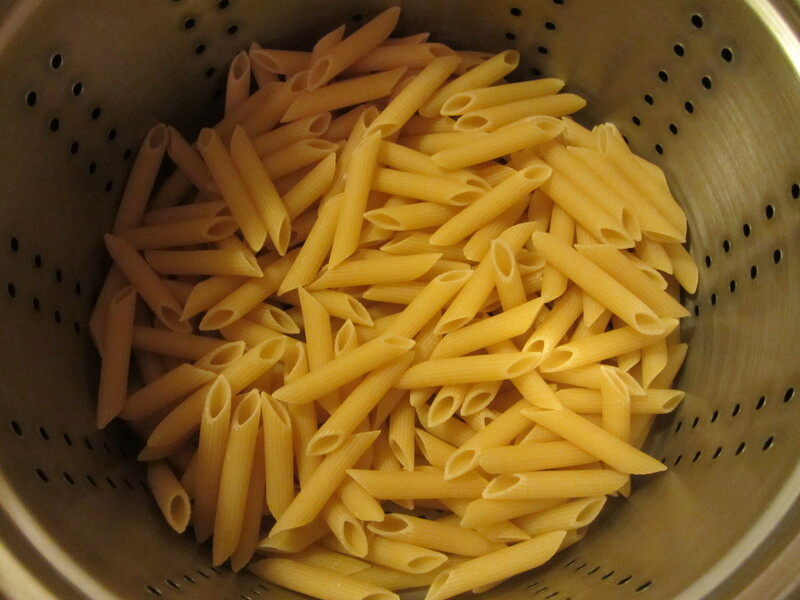 Instead, cover the dry pasta with cold water and put it on the burner, cooking until the pasta is al dente. Really, after cooking pasta this way (I’ve done it a few times), I have to say that Alton is right; there really is no need to boil the water first. Following a Thanksgiving hiatus, I am back with the 23rd episode of Good Eats. 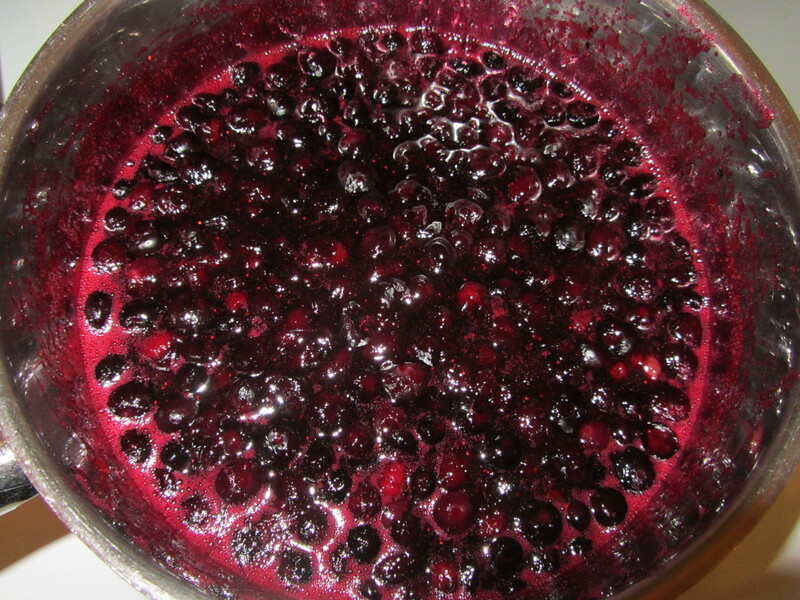 In this episode, Alton makes only one recipe, which is for Spiced Blueberry Jam. I have made freezer jam before, but my only other canning experience has been the dill pickles my mom and I have made for the past eight to 10 years. 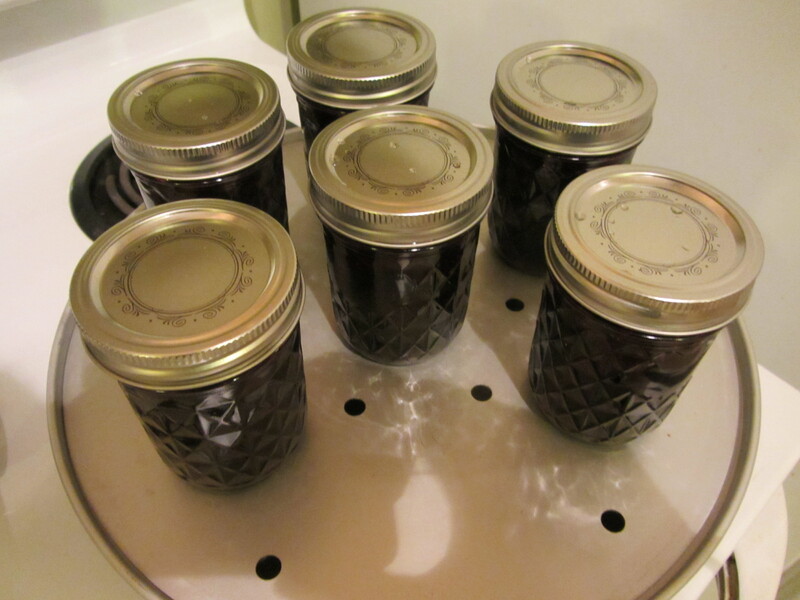 To start Alton’s jam, you need to begin by washing all of your canning equipment, which I did by hand. Jars, bands, funnel, masher, and ladle after hand washing. After a good wash, it is critical to sanitize your equipment, which Alton did by boiling everything (except the jar lids) for 10 minutes. 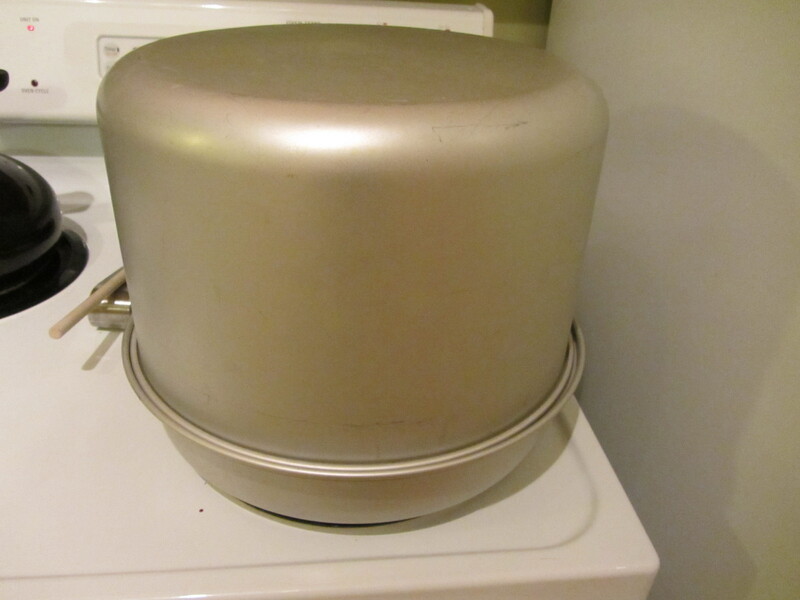 The jar lids can be added to the pot after it has been removed from the heat for ~10 minutes, as boiling the lids could destroy their sealing compound. 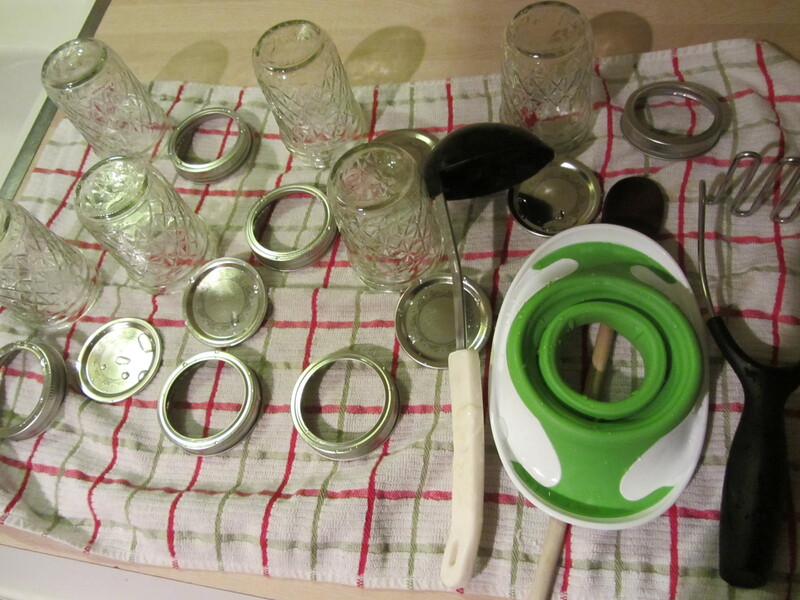 I could not find a good pan to boil all of my equipment, so I opted to run everything through the dishwasher instead; this included my jars, bands for the lids, a canning funnel, and a ladle. 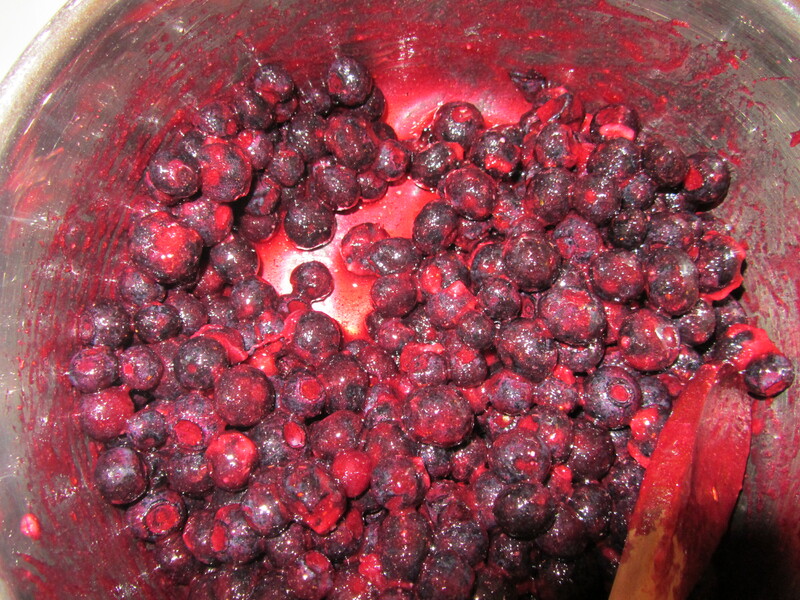 While your equipment is sanitizing, you can begin making your jam by combining frozen blueberries, a packet of dry pectin, cinnamon, ground star anise, fresh nutmeg, lemon juice, and cider vinegar. 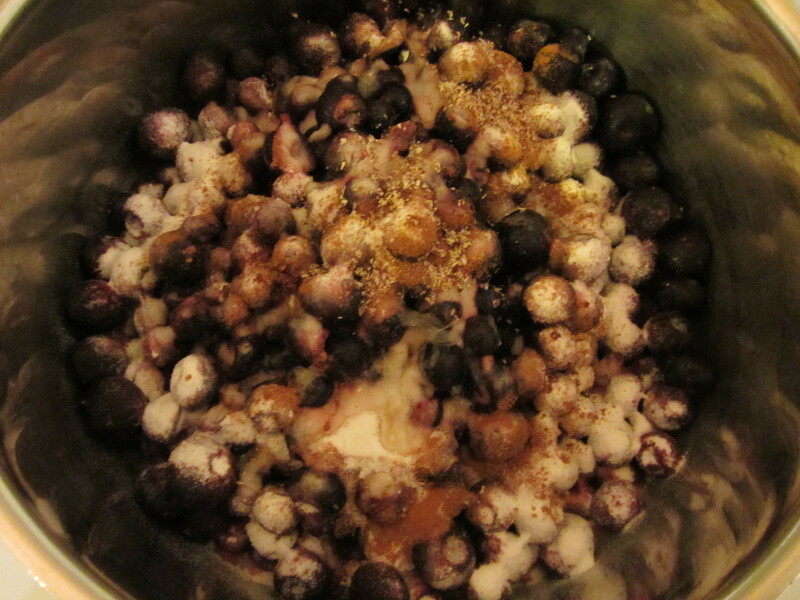 Jam ingredients: frozen blueberries, star anise, nutmeg, cinnamon, pectin, lemon juice, and cider vinegar. Now, there are a couple of differences between the recipe prepared in the episode and the online recipe. In the episode, Alton uses 1/4 t of cinnamon and 4 T of cider vinegar, while the online recipe calls for no cinnamon and 5 T of cider vinegar. I made the recipe as Alton did in the show. Once everything is combined in the saucepan, you want to bring it to a boil over low heat, as you do not want your frozen fruit to burn. 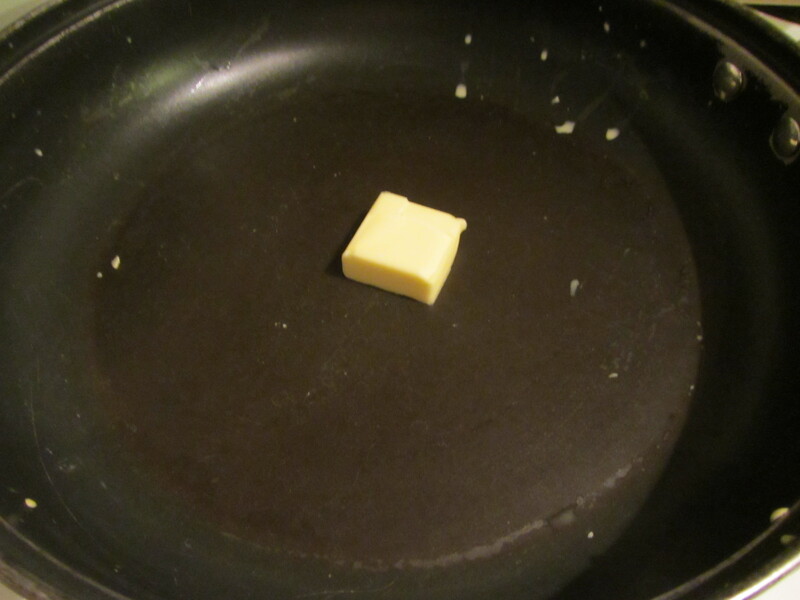 All ingredients in the pan. 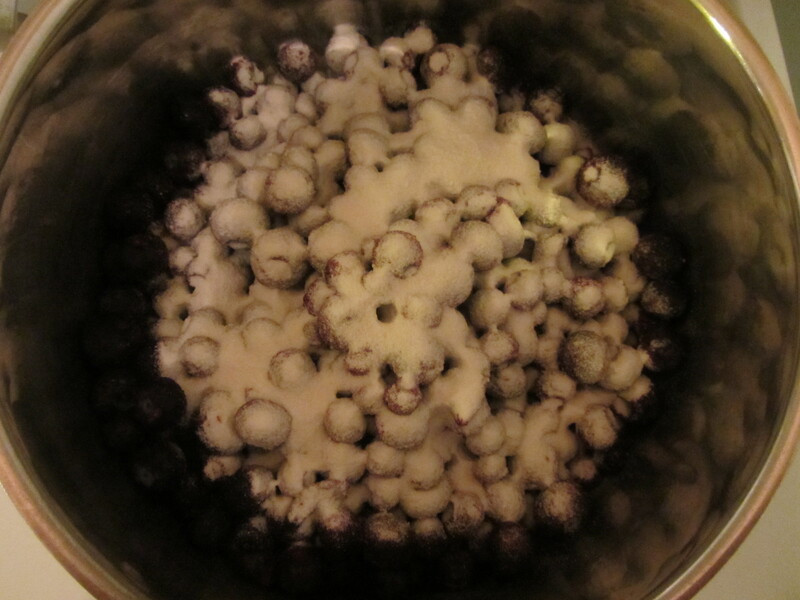 Once juice starts forming on the bottom of the pan, you can increase the heat and began to mash the blueberries with a hand masher. 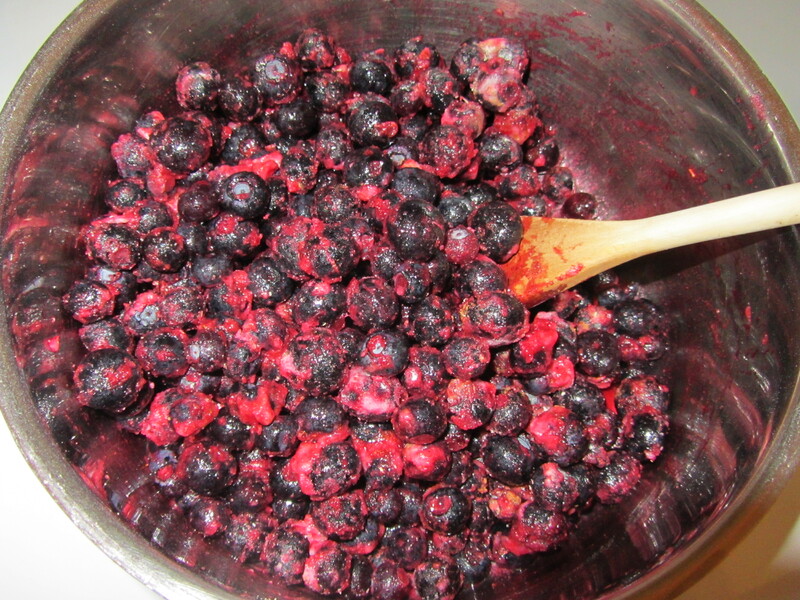 You want to boil the mixture for about five minutes, continuing to mash the berries. Juice starting to form at bottom of pan. Bringing the mixture to a boil. 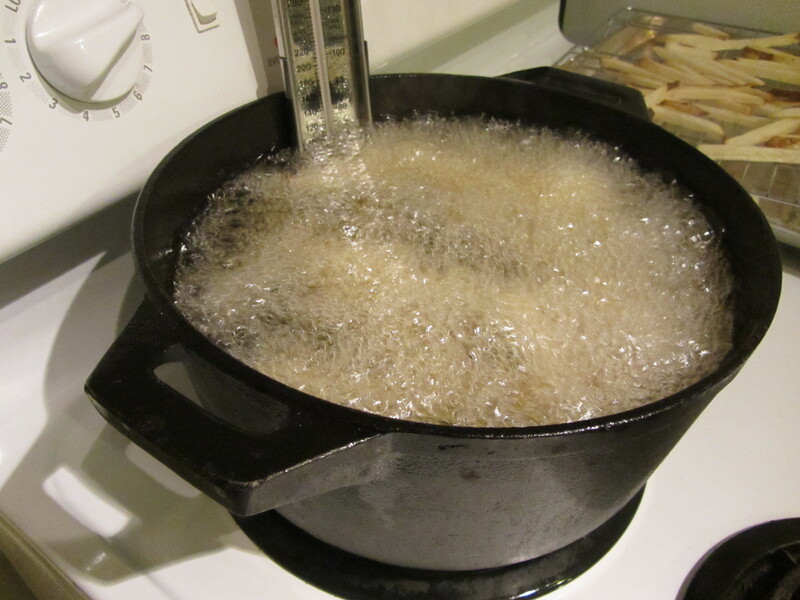 At this time, you add your sugar and some water to compensate for evaporation. 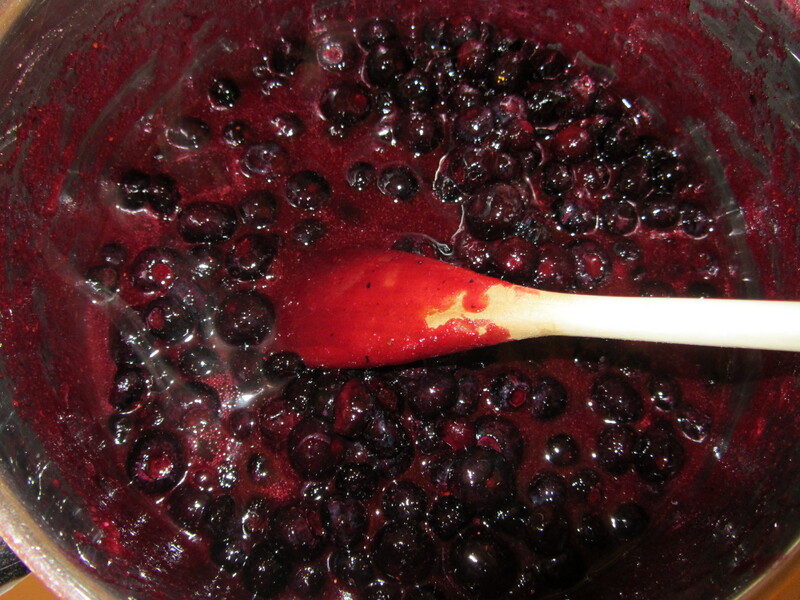 Sugar serves to make jam spreadable, helps to set the pectin, and it takes up excess water. 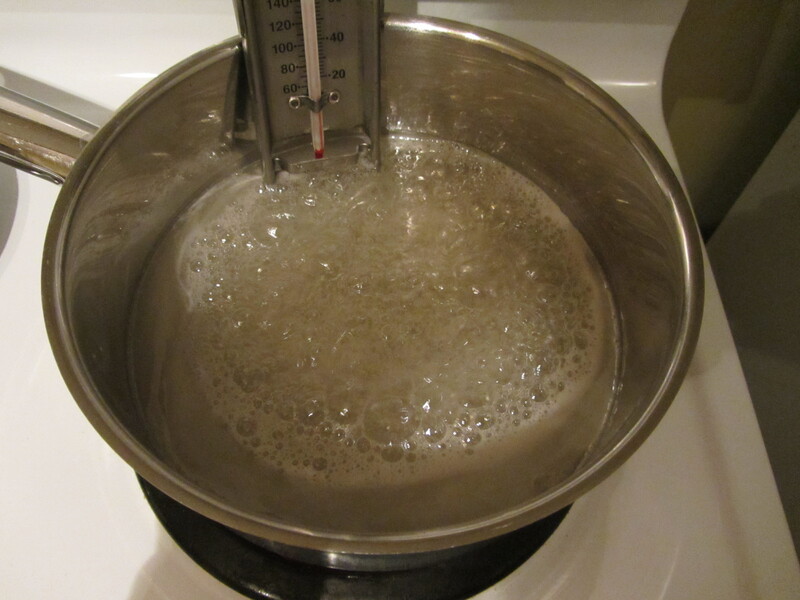 After adding the sugar and water, you increase the heat to medium-high and stir until your jam reaches a boil. Boil the jam for one minute and you are done. Jam after boiling for a final minute. At this point, you could put lids on the jars and store them in the refrigerator for a couple of weeks. I opted to process my jars for longer shelf life, and because it is what Alton does in the episode. 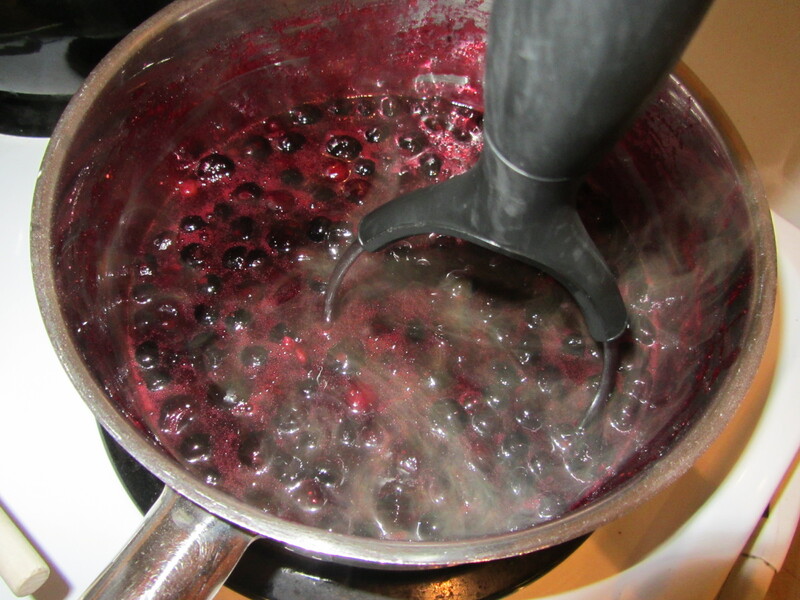 While your jars are still hot, you want to fill them with the hot jam mixture, using a ladle and your funnel. 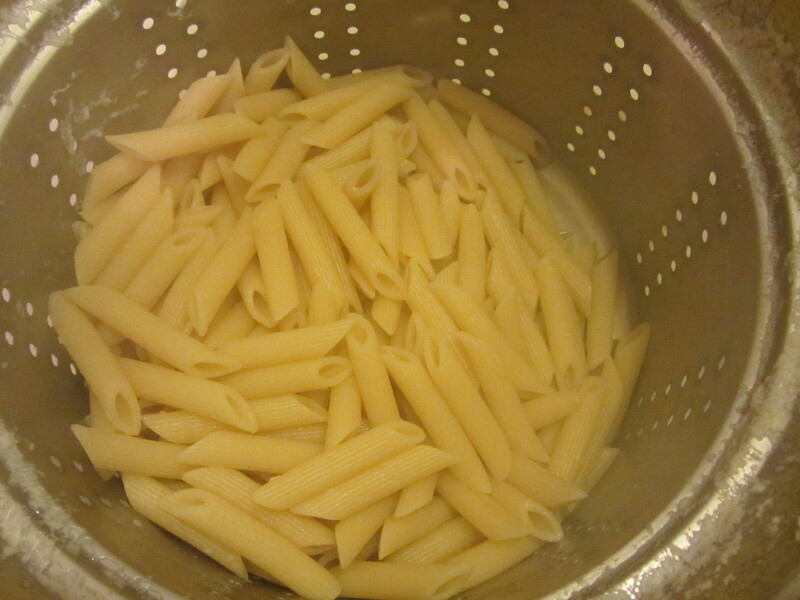 At this time, I put my jar lids in a bowl with some hot (not boiling) water. 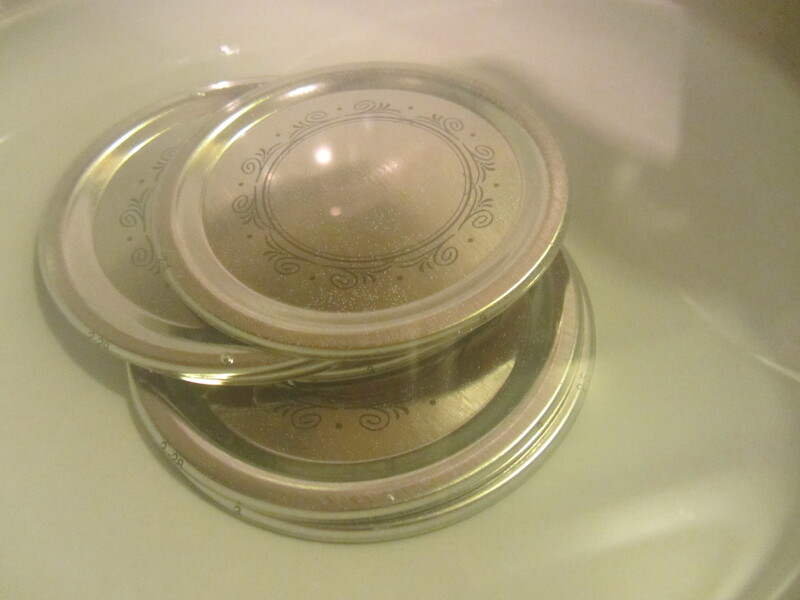 Jar lids in hot water. You only want to fill your jars to the bottom of the funnel. 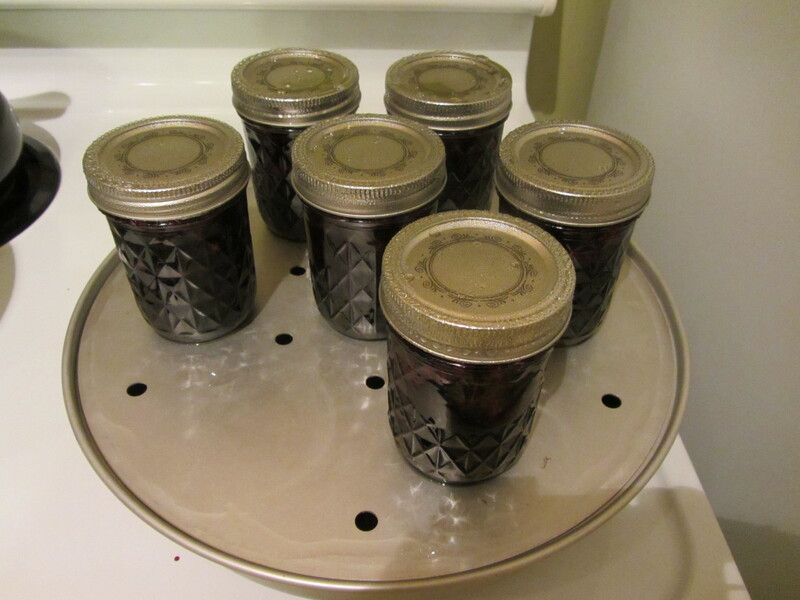 I had just about the perfect amount of jam for six half-pint jars. 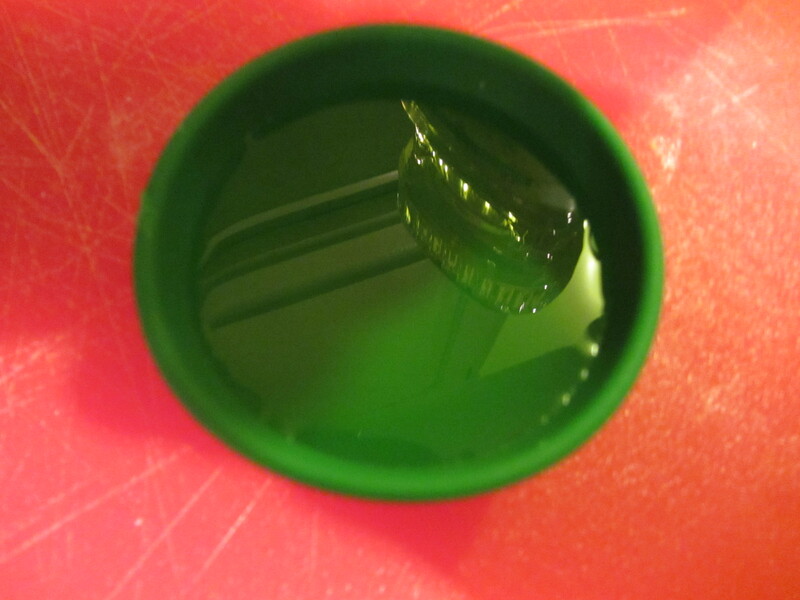 Once filled, wipe the rims of your jars with a damp paper towel and add the lids. Alton used a magnetic wand to put his lids on, but I simply used a fork and my fingers, avoiding touching the bottoms of the lids. Screw the bands on your jars, but only finger-tight. Alton processed his jars by putting them in a water bath. I, on the other hand, borrowed my mom’s steam canner, which is what she and I have always used for our pickles and it has always served us very well. 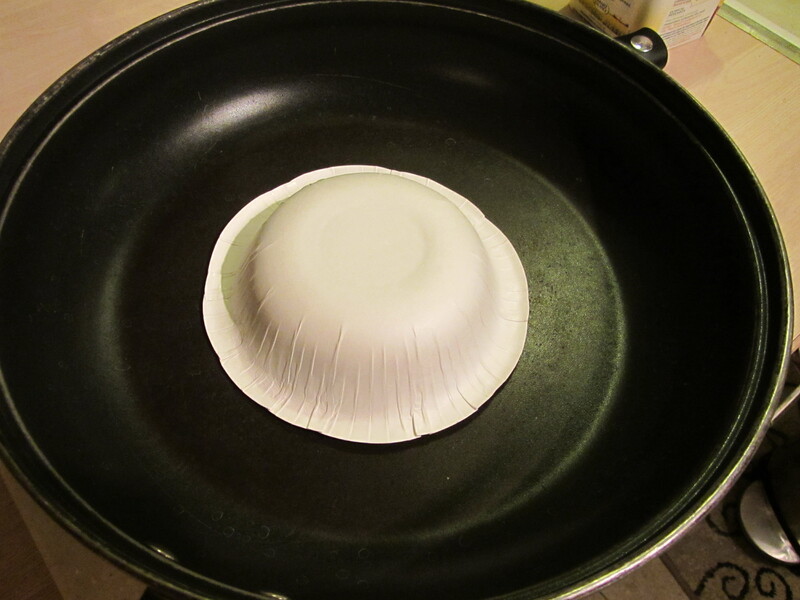 Basically, it is an aluminum dome that sits over a water bath. As the water boils, steam comes up through holes between the bases of the jars. Jars in the steam canner. Watching for steam to come from the vents. After 10 minutes of processing (processing times depend on the elevation where you live), I pulled my jars from the canner. 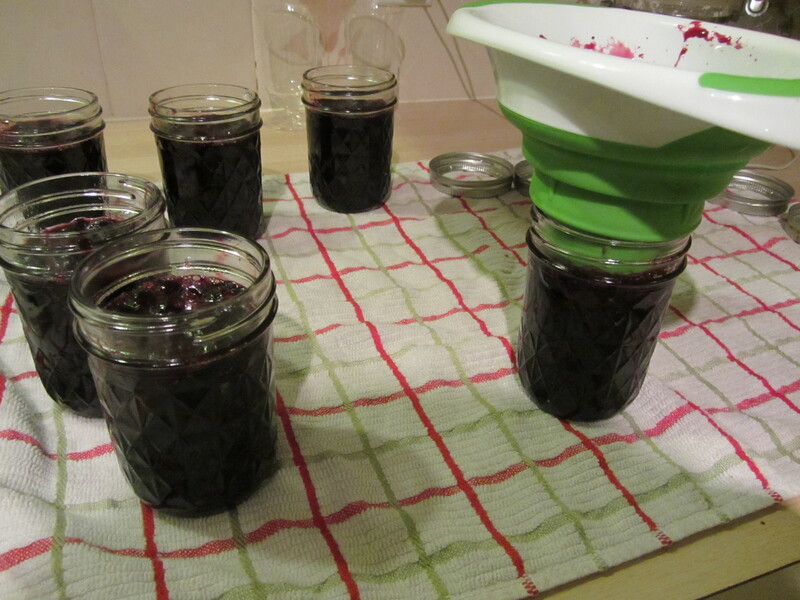 While my mom and I have occasionally had a jar that has failed to seal, all of my jam lids made a happy popping sound immediately when removed from the canner. Jars after 10 minutes of processing. Fresh (and hot!) from the canner. You want to let your jars cool completely, and Alton recommends storing them without their bands. Why? The bands tend to rust and it is easier to tell if a jar is spoiled when the lid is not held in place by a band. 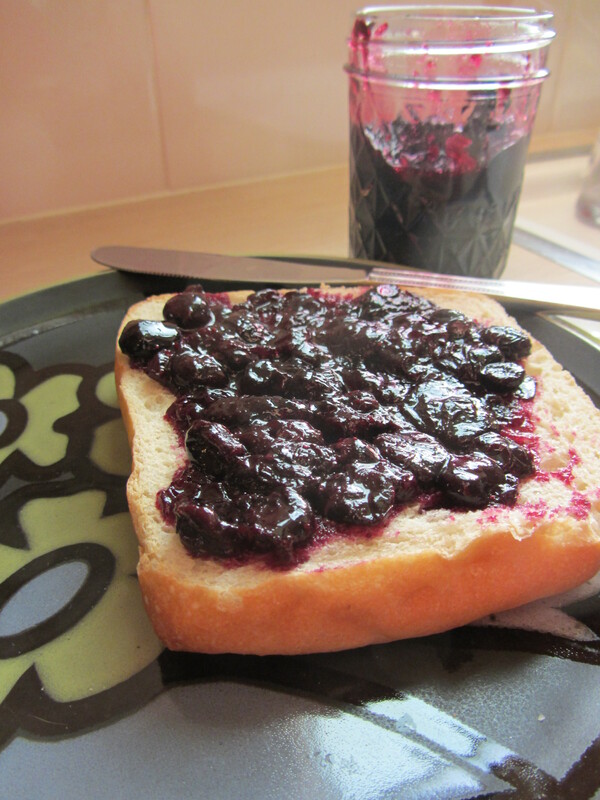 Ted and I had the jam yesterday morning for breakfast, spreading it on toast. Nice color to the jam. 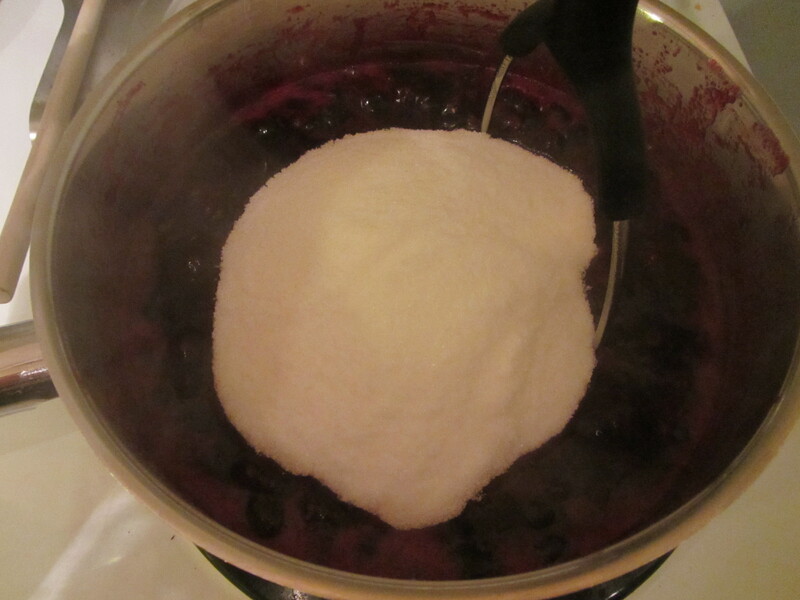 The blueberry flavor is super intense and you would not guess that the jam is made of frozen fruit. We both thought the anise flavor paired really well with the blueberries, and Ted described the jam overall as “spicy.” While the nutmeg and cinnamon are fairly subtle, the anise flavor is obvious, though not overpowering. 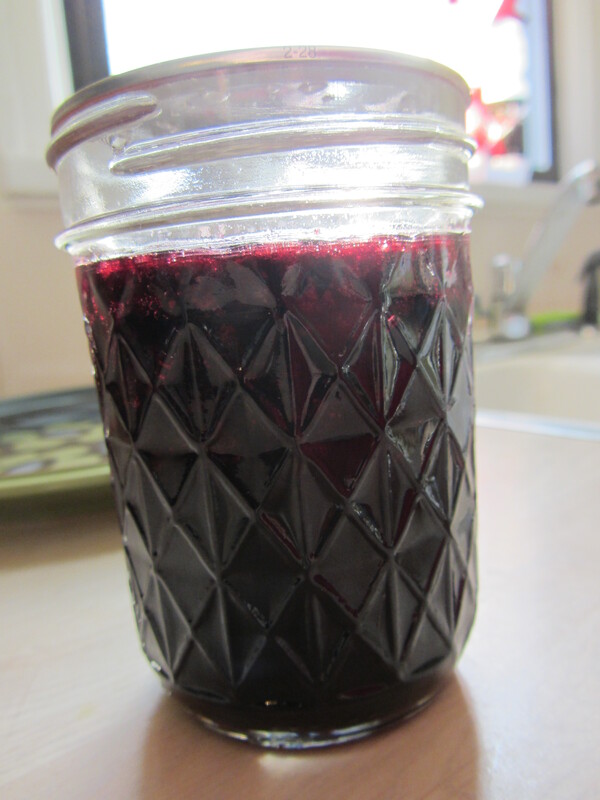 This jam is a little on the looser side, but I would not call it runny or thin, and it does have a beautiful purple color. 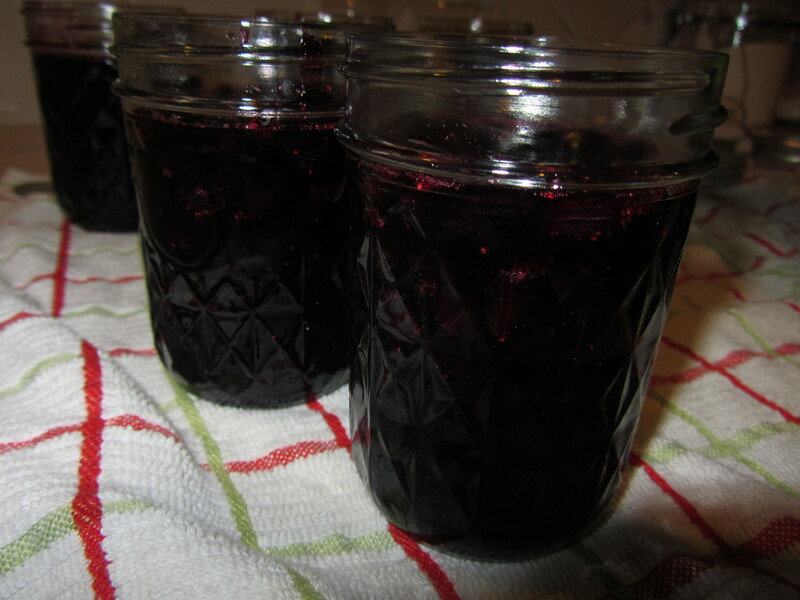 Overall, I think it is really good jam, and the spice notes are a surprise, as they are more intense than in most jam. 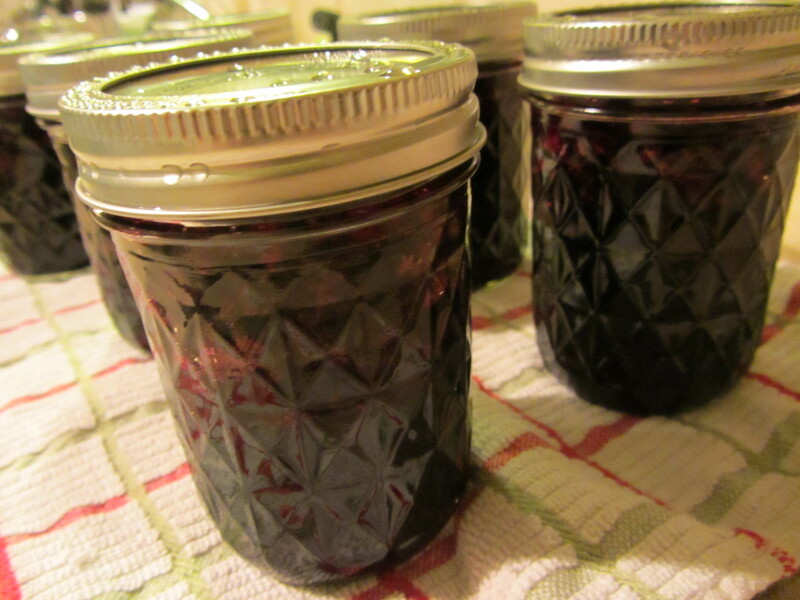 Jam is so easy to make, and this one could make a nice holiday gift. I was excited to see that I would be making Alton’s fish and chips after watching the 22nd episode of Good Eats. I love fish and chips, but had never made it before. 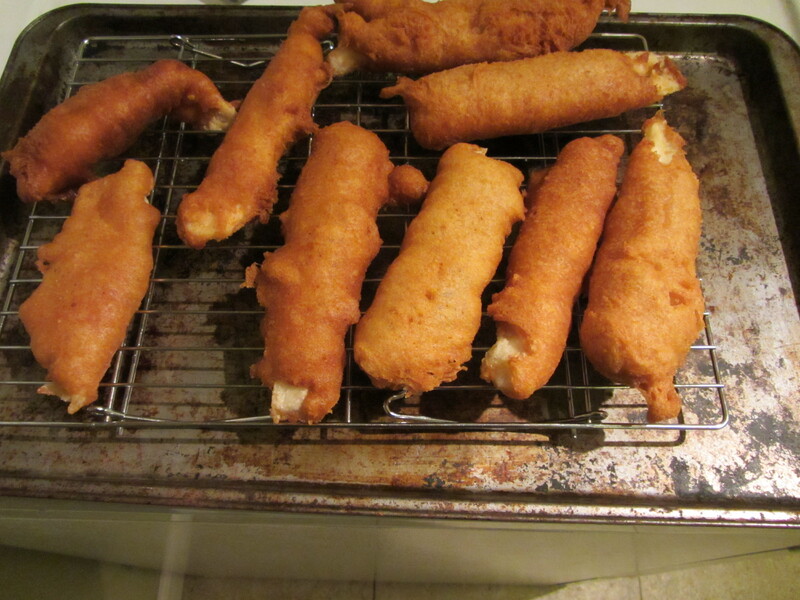 We do not really do any deep frying at home, so this was to be a new experience for me. My parents fried food when I was a kid, so I have memories of them making French fries, onion rings, etc. For most of their frying, I remember them using a deep fryer. For this recipe, Alton uses a Dutch oven to fry his potatoes and fish. 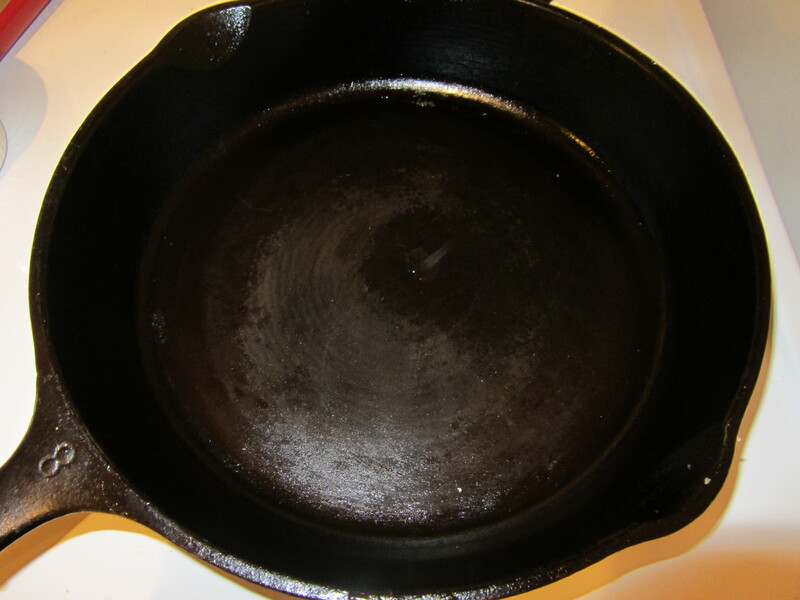 Our only Dutch oven is cast iron, and Alton explains that one should not fry in cast iron because the iron oxide from the metal can cause your oil to turn rancid. I, however, could not justify the purchase of a new Dutch oven simply for this recipe, and figured I could toss the oil after frying, should it appear rancid. 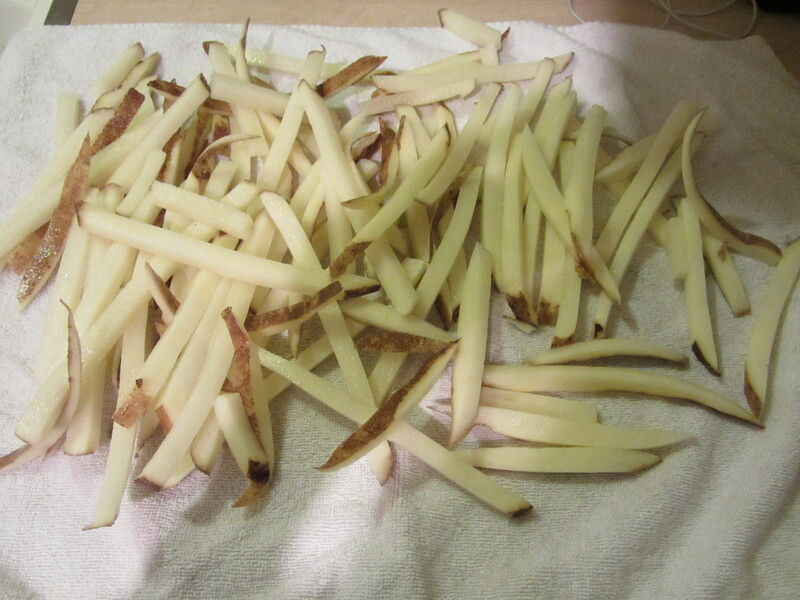 Prior to commencing frying, I sliced my Russet potatoes (one per person) on a mandolin into perfect French fries. As soon as your potatoes are cut, you want to submerge them in cold water, which serves to remove excess starch; excess starch prevents steam from escaping during cooking and also causes the potatoes to brown. The potatoes can sit in the cold water for up to 10 hours. My potatoes sat in the water for a couple hours. 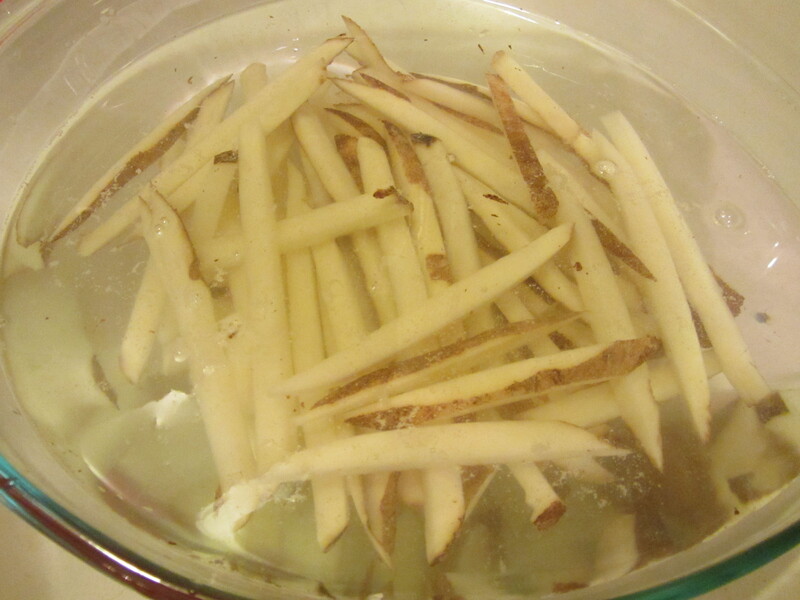 Potatoes soaking in cold water to remove starch. 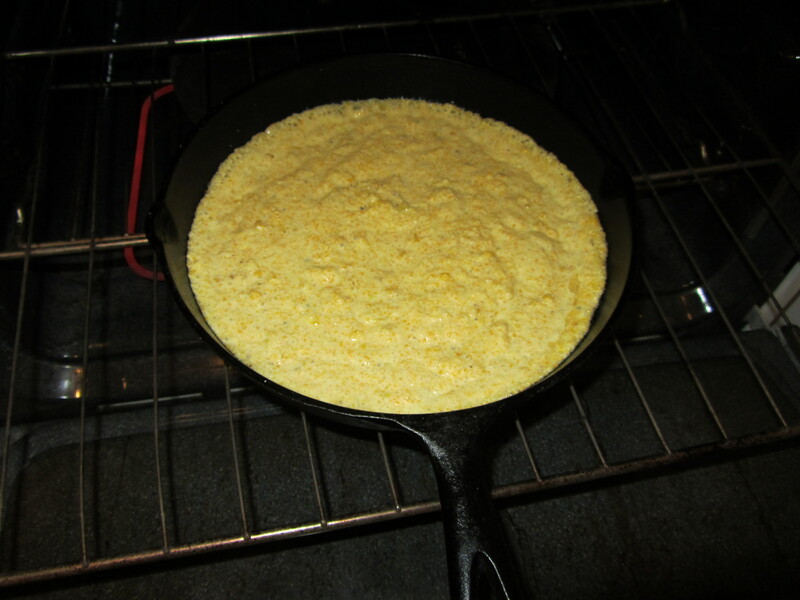 Once I was ready to fry, into my Dutch went my gallon of Safflower oil, after my husband, Ted, kindly made an extra trip to the store to purchase more oil (we had not initially purchased enough). 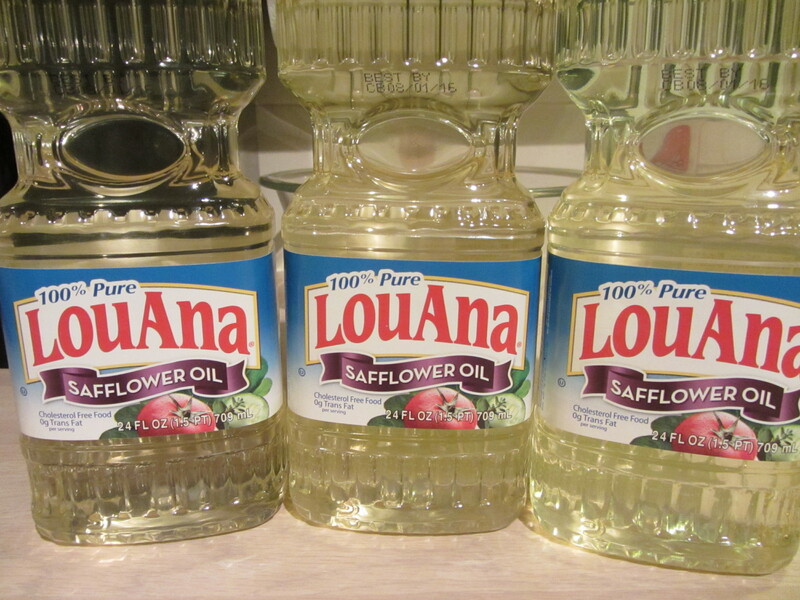 Safflower oil has a high smoke point of 510 degrees, making it an ideal oil for frying. Alton tells you to fill your Dutch oven to within 1.5 inches of the top. 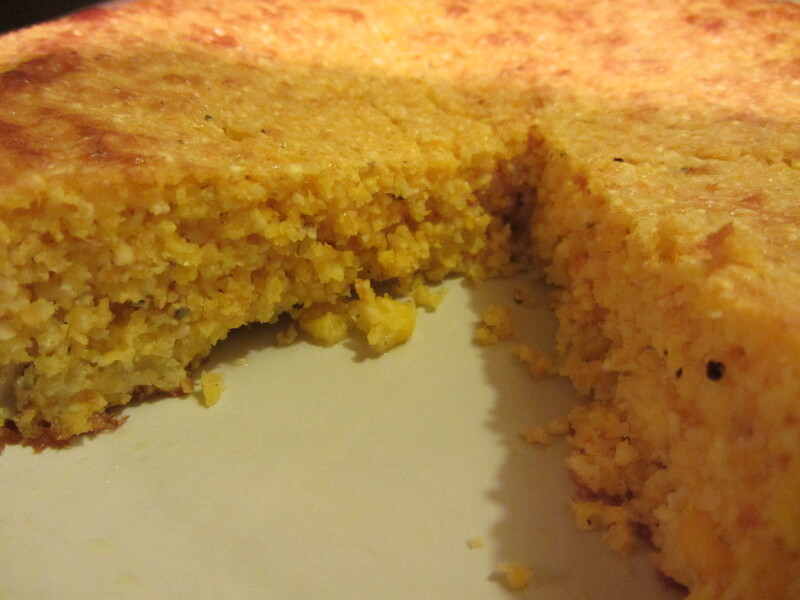 A gallon of oil in a five-quart Dutch oven is perfect for this level. I used a candy/frying thermometer to monitor my oil’s temperature, as this is what Alton had done in the episode. A gallon of oil in a five quart Dutch oven. 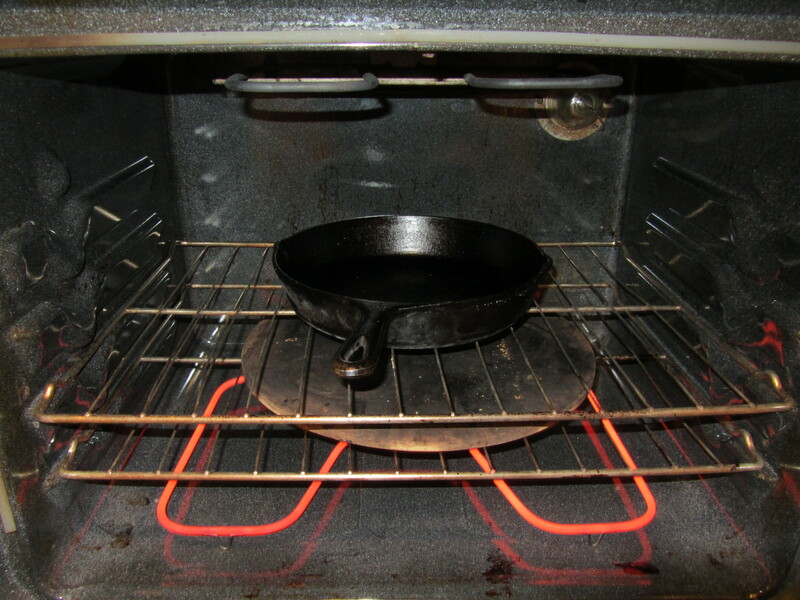 Once your oil is in the pan, you want to heat it over high heat. 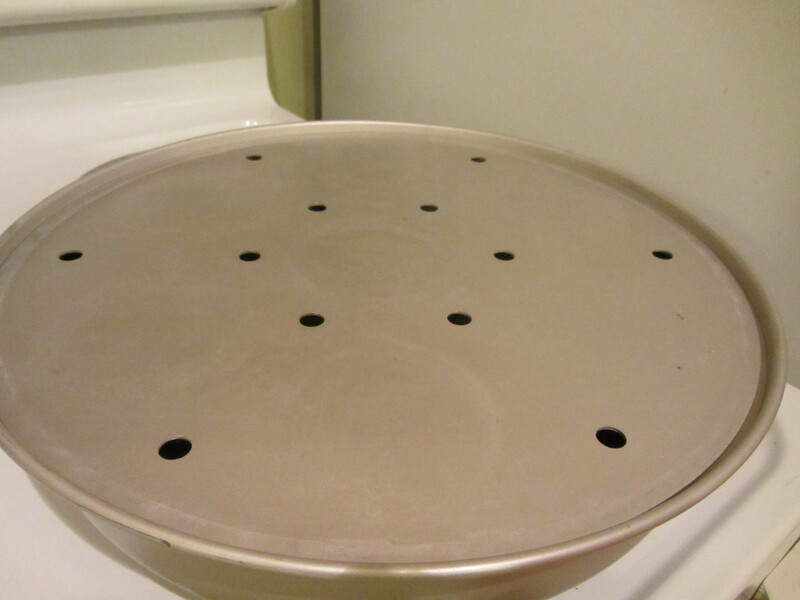 Meanwhile, you want to prep a rack over a sheet pan, as this is where your food will drain after frying. 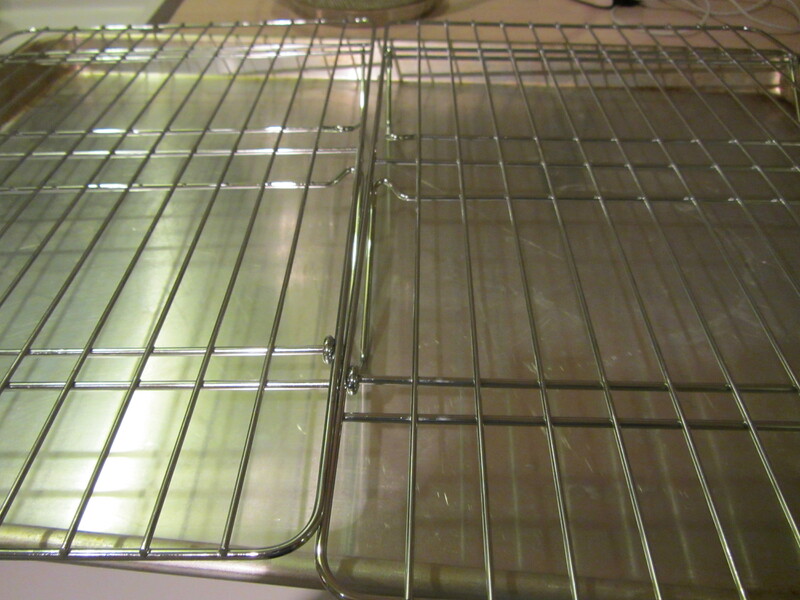 Rack over a sheet pan for draining fried food. 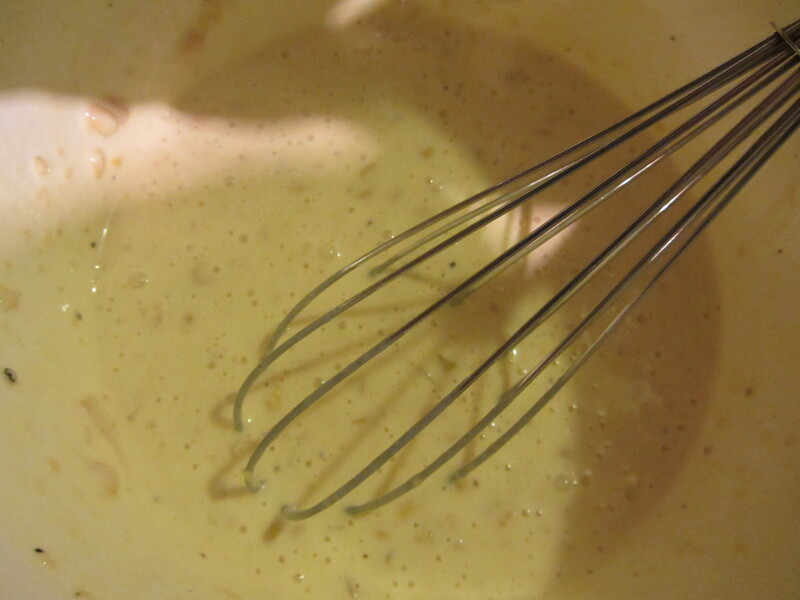 Fifteen to 60 minutes prior to frying your fish, you want to mix up your batter. 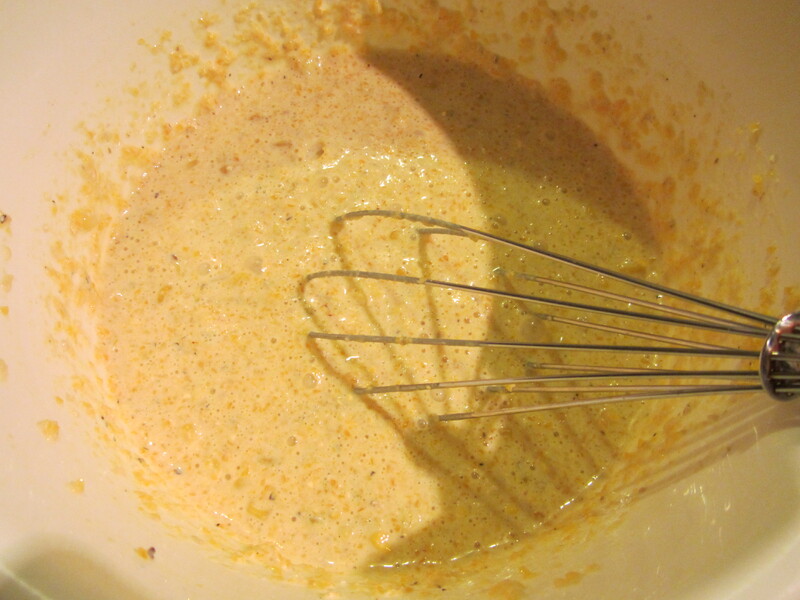 For the batter, you combine flour, baking powder, Kosher salt, cayenne pepper, Old Bay Seasoning, and a cold bottle of beer. 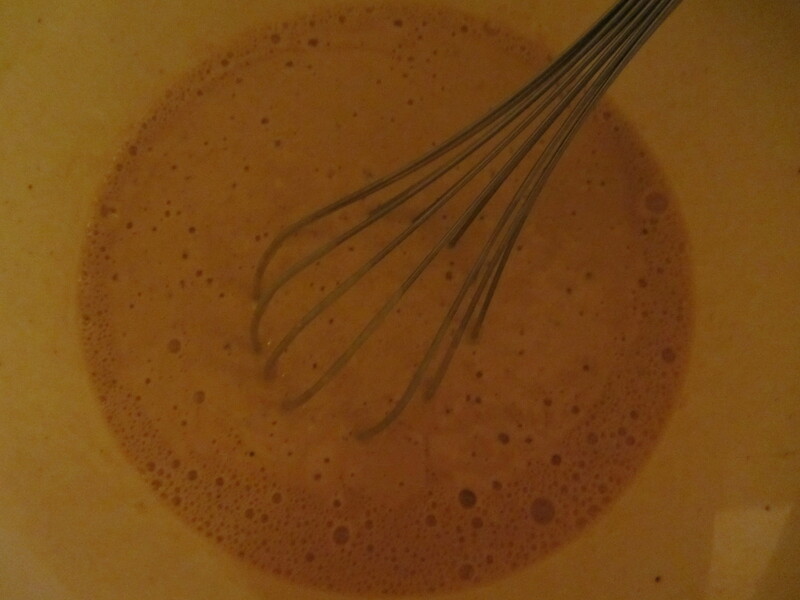 Making the batter much further in advance will cause the beer in the batter to lose its bubbles. The batter goes into the refrigerator to chill while you fry your potatoes. Flour, baking powder, Kosher salt, cayenne pepper, and Old Bay Seasoning. 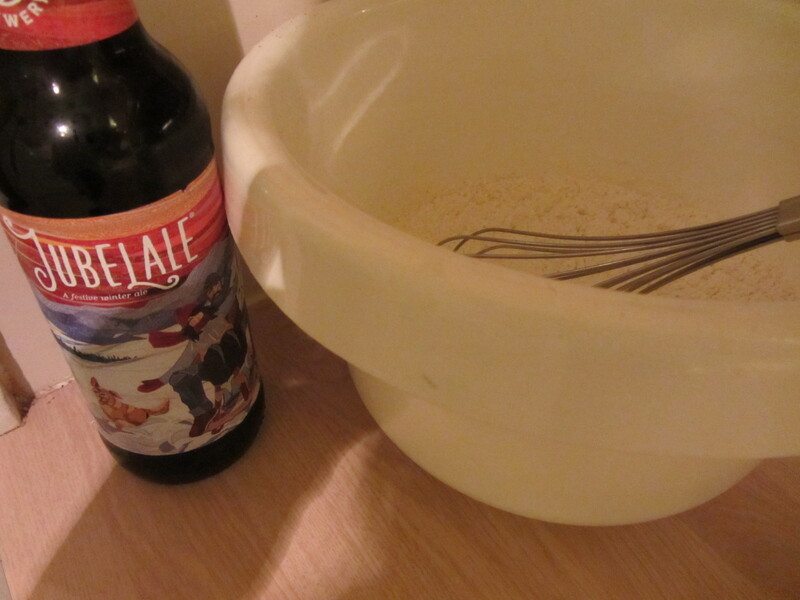 Dry batter ingredients plus a beer. Prior to frying, it is necessary to drain your potatoes very thoroughly. Alton uses a salad spinner for this step, but as we do not have a salad spinner, I used kitchen towels to roll up and pat my potatoes dry. Drained potatoes, drying on towels. 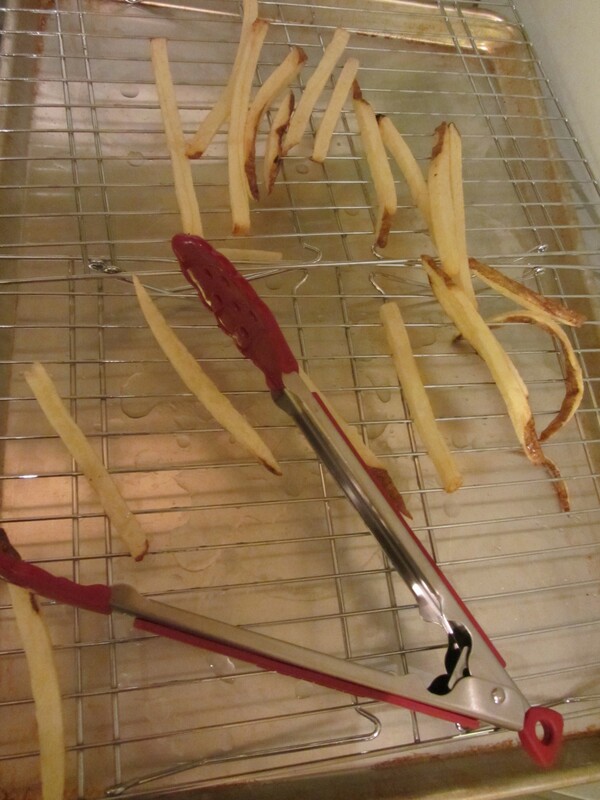 When your oil reaches 320 degrees, you are ready to begin frying your potatoes in batches (fry ~one potato at a time). Since our potatoes were very large, I fried mine in three batches. The French fries are fried two times – first at a lower temperature and then at a higher temperature. For the first frying, you just want to fry your potatoes until they are translucent and starting to get floppy, which takes two-three minutes. Cool the potatoes to room temperature. Potatoes draining on racks after first frying. 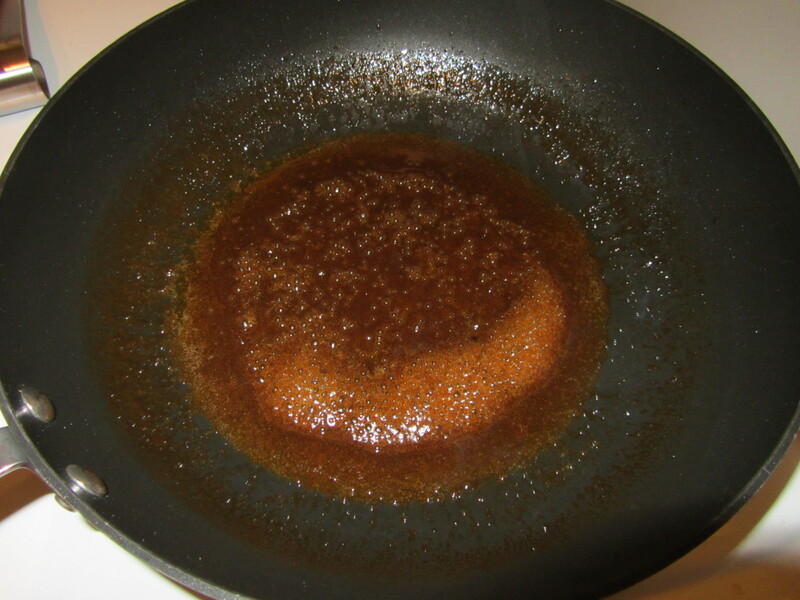 As my potatoes were taking their first dip into the oil, I noticed that my oil was really bubbling aggressively, and some oil even spilled over the edge of the Dutch oven. Ted and I noticed that there appeared to be some smoke coming from the burner, and I contemplated removing the pan from the heat. Ted convinced me not to worry (Safflower oil does, after all, have a very high smoke point). 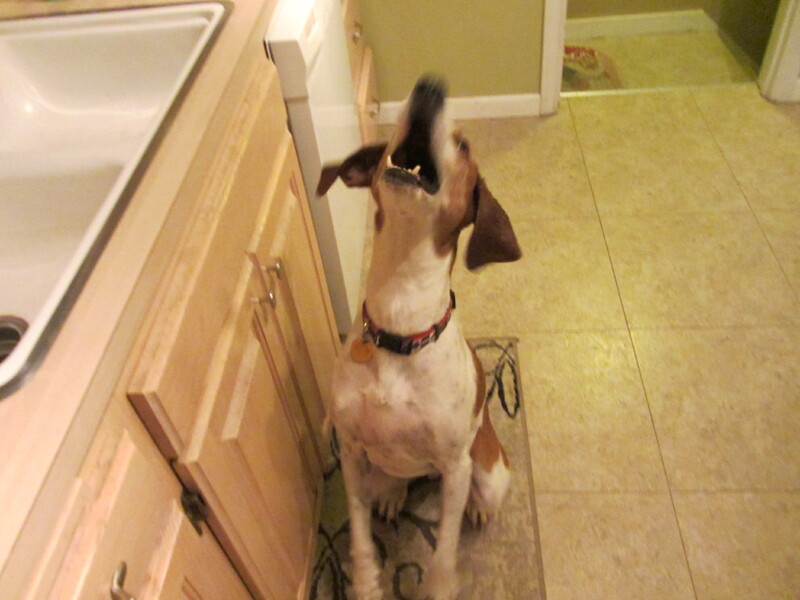 By this point, the kitchen was getting quite smokey, one Coonhound had fled to the basement for cover, all of the windows were open (it was about 22 degrees outside), and the other Coonhound was observing us from behind the blockade of chairs we put around the perimeter of the kitchen. It was about this time that we heard a “whoosh” sound as flames ignited under the pot. Fantastic. We turned the burner off immediately and Ted carried the Dutch oven out to the driveway. 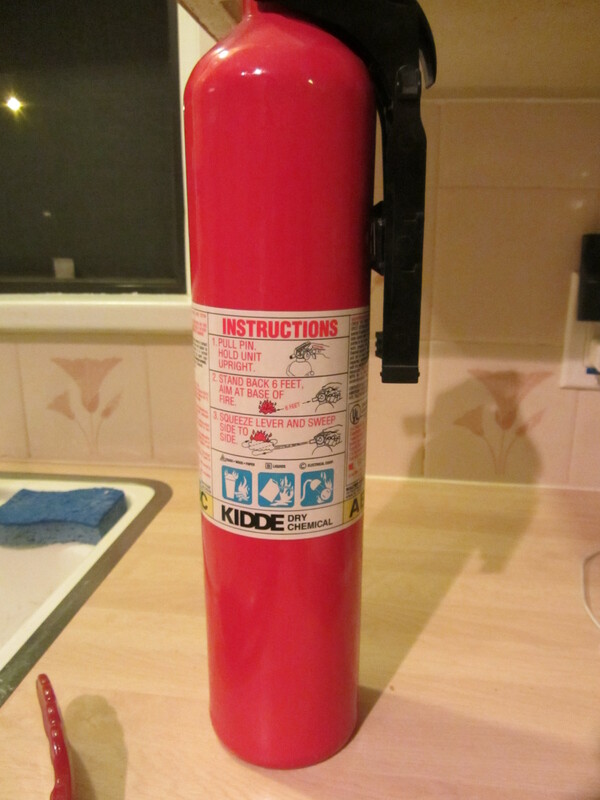 Meanwhile, the burner was still on fire and the fire extinguisher made an appearance. Never good when this makes an appearance. As Ted attempted to put out the six-inch flames with a kitchen towel, I grabbed a sheet pan and placed it over the burner to suffocate the flames. I guess all those years of watching crappy cooking shows like Hell’s Kitchen paid off, as images of Gordon Ramsay smothering flames danced in my head. After a couple of hectic moments, we were good to go, albeit with completely blackened burner drip pans, a scorched kitchen towel, a house full of smoke, and two very confused dogs. I somehow failed to get pictures of this whole series of events. Go figure. 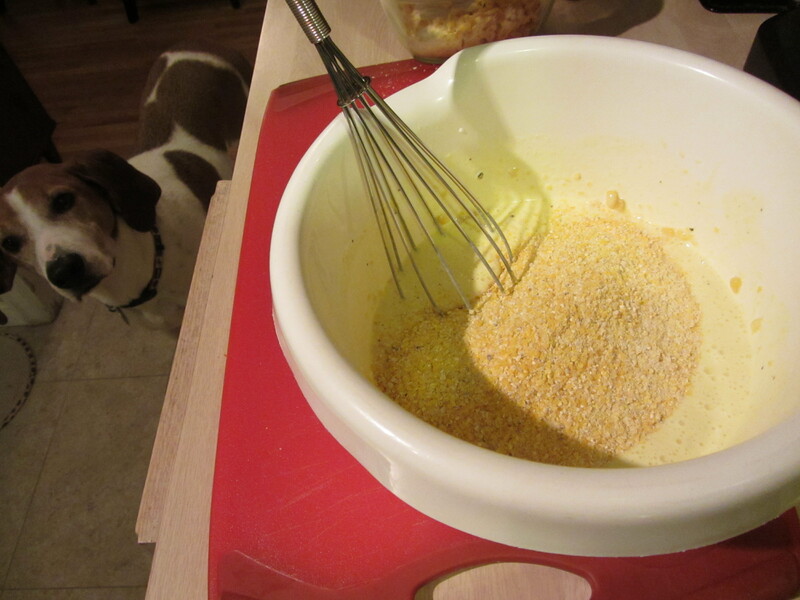 I was less than enthused about continuing with the recipe. 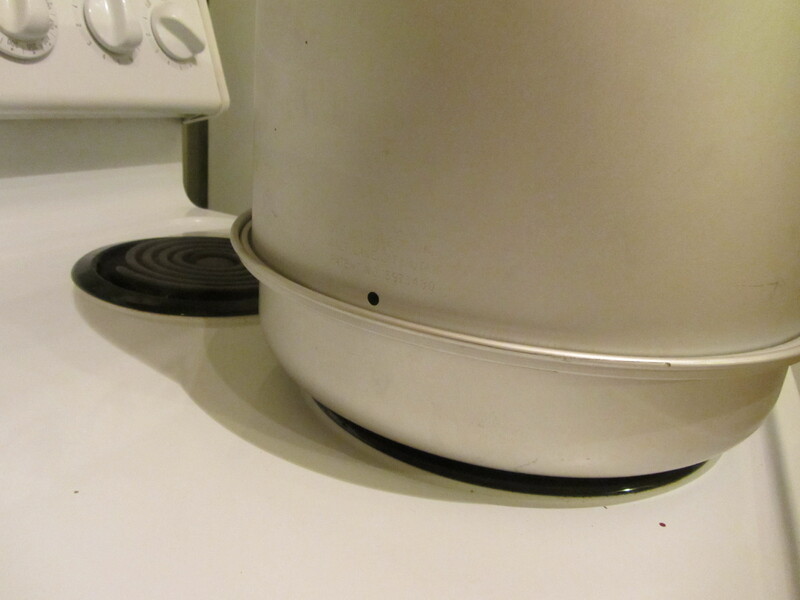 Ted, however, insisted that I continue, transferring the oil to a deeper pot (and a clean burner). Once my oil was back to temperature, I completed the first frying of my potatoes. For the potatoes’ second swim, you want to increase the oil temperature to 375 degrees and heat your oven to 200 degrees. Again, frying the potatoes in batches, you want to fry them until they are a nice golden brown. 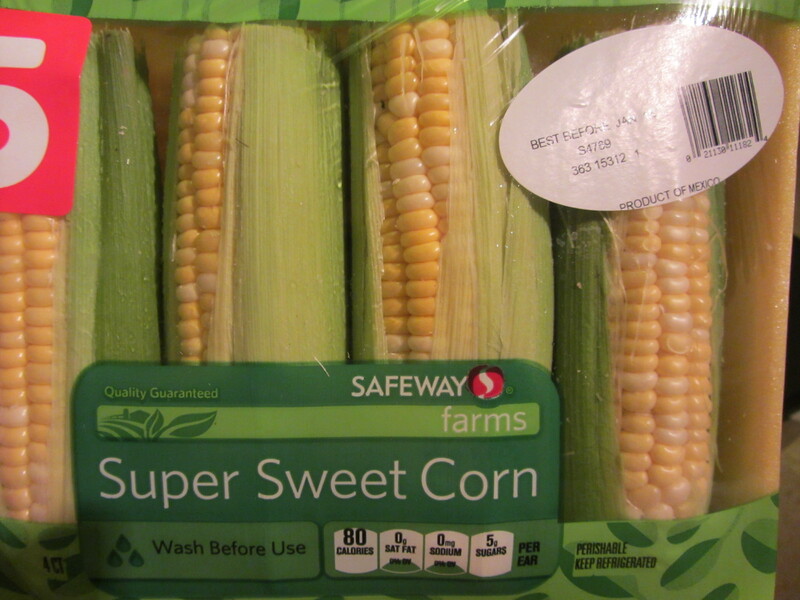 While they are still hot, season them generously with Kosher salt, and stick them in the oven to keep them warm. When the potatoes are all done, it is time to fry the fish. 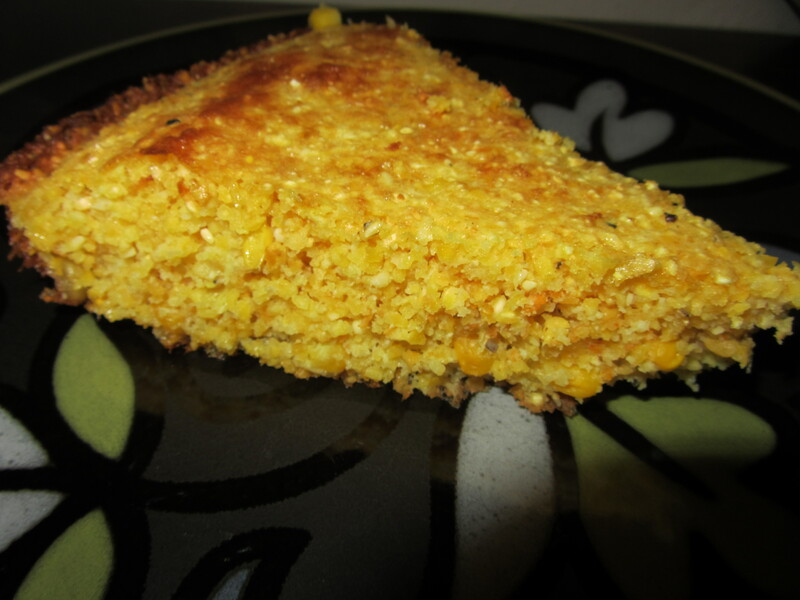 For this recipe, Alton suggests using tilapia, and he says he purchases frozen fillets. Since only two of us would be eating, I used 3/4 of a pound of tilapia, which I thawed and cut into one-inch strips. 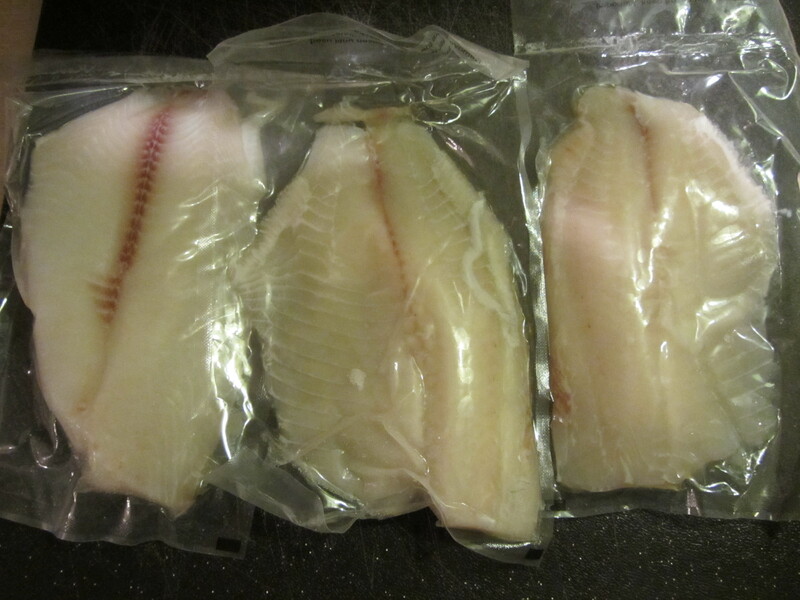 Tilapia cut into 1″ strips. 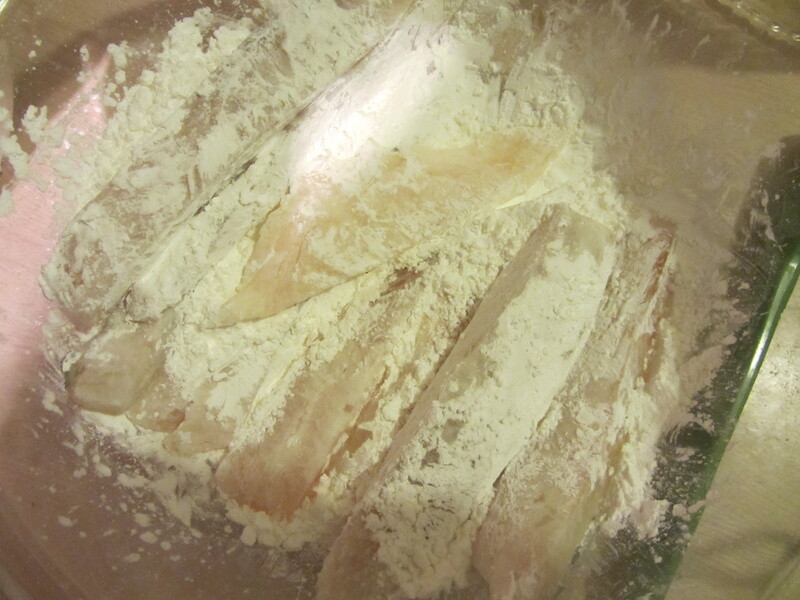 Prior to dipping your fish strips into the batter, you want to dredge them lightly in cornstarch, tapping off any excess. Then, into the batter they go. 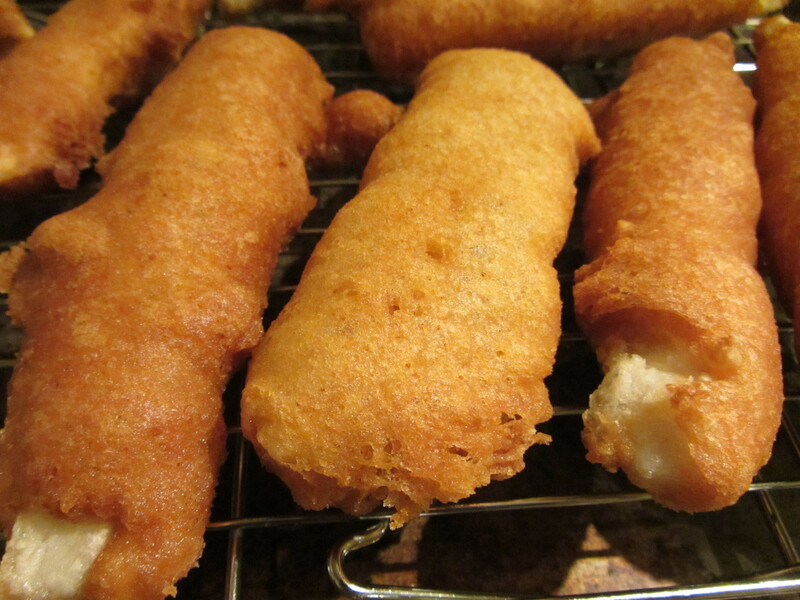 The batter has a tendency not to coat the patches of fish where there is more batter, so you may have to dip them twice. The batter is quite thick, but clings well to the fish. 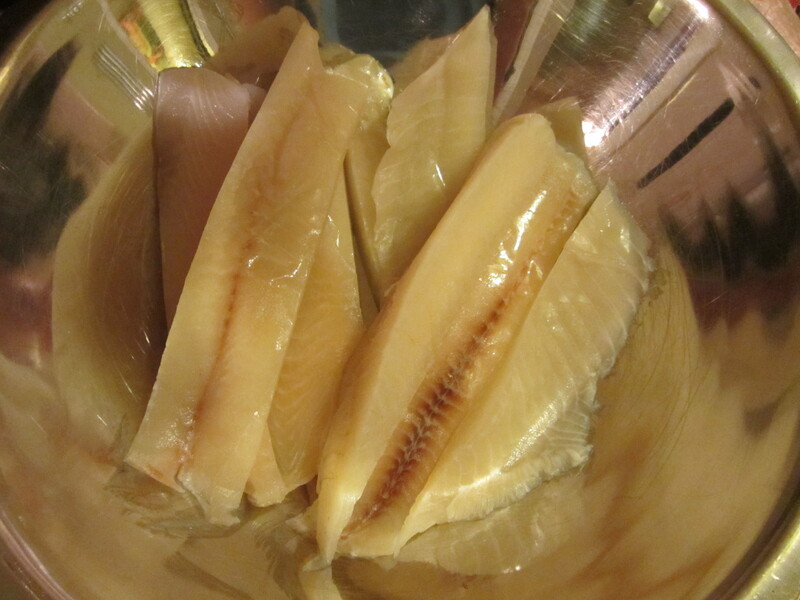 You want to fry the fish until it is golden brown, turning it over several times while frying. 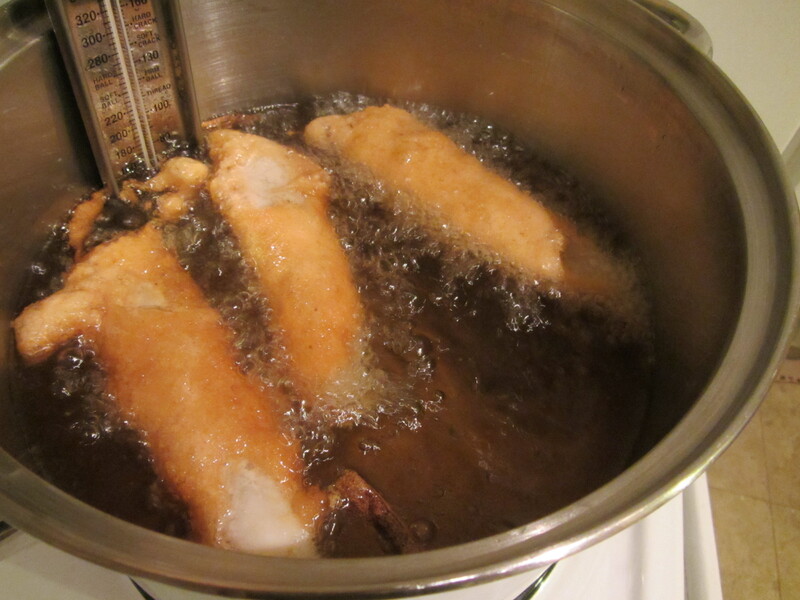 Fish frying in new, deeper pot on clean burner. My fish took about three minutes to fry. Again, you want to drain your fish on a rack to get rid of excess oil. Fried tilapia, draining on racks. Alton recommends that you break one of your fish strips in half to make sure the fish is cooked through; if not, you can finish the fish in a 350 degree oven for about 10 minutes. 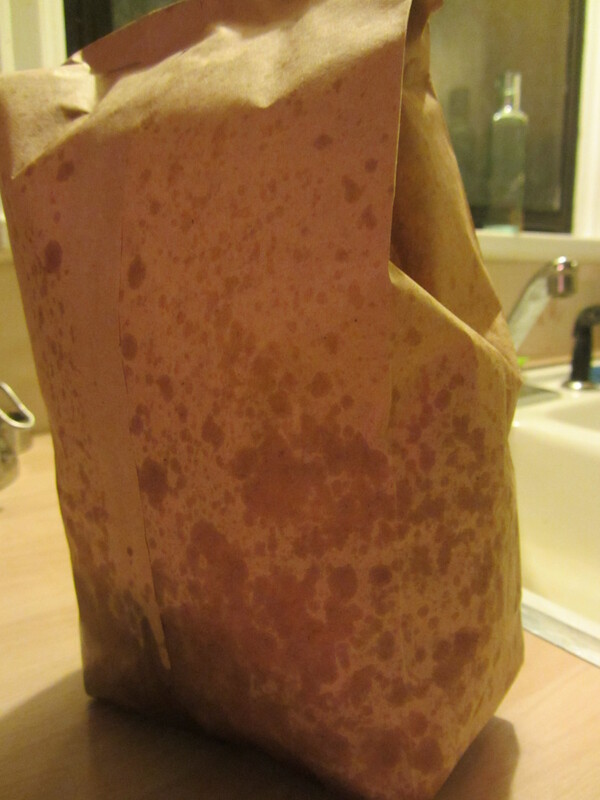 Oh, and be sure to serve your fish and chips with malt vinegar. 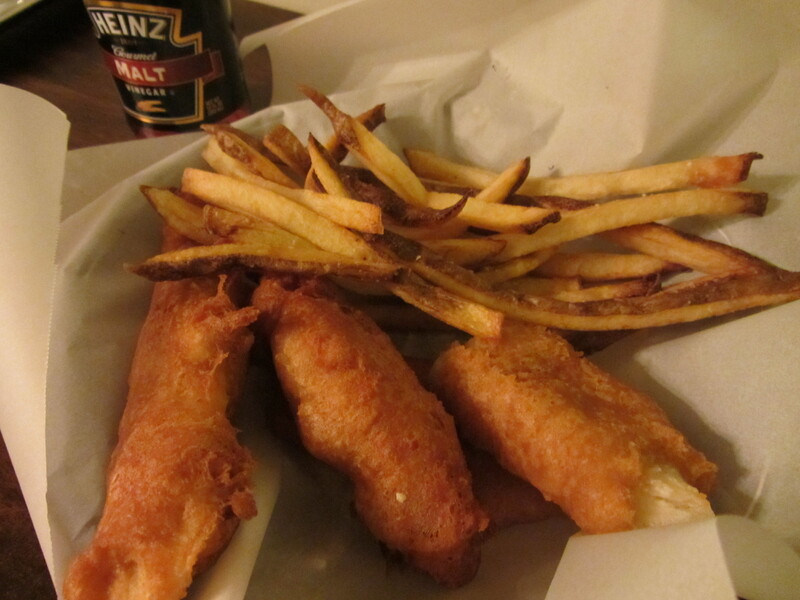 Fish and chips, served with malt vinegar. I love malt vinegar on French fries, and I fondly remember going to the boardwalk near my aunt’s house in Delaware to get a newspaper cone filled with malt vinegar-sprinkled French fries, but I digress. Though I had a bit of a “frytastrophe” in making Alton’s fish and chips, Ted and I both found the resulting product to be very good. The French fries were light and fairly crispy, though I would have preferred mine a little bit crispier. The Fish was golden brown and had a light, super crispy shell, while the fish inside remained very moist. One of my pet peeves when ordering fish and chips at a restaurant is that the batter often slides off of the fish, but the batter in this recipe clung to the fish beautifully. The fried coating was flavorful, though I could not identify the Old Bay Seasoning. All in all, this was delicious, though it ended up being too much food for us. 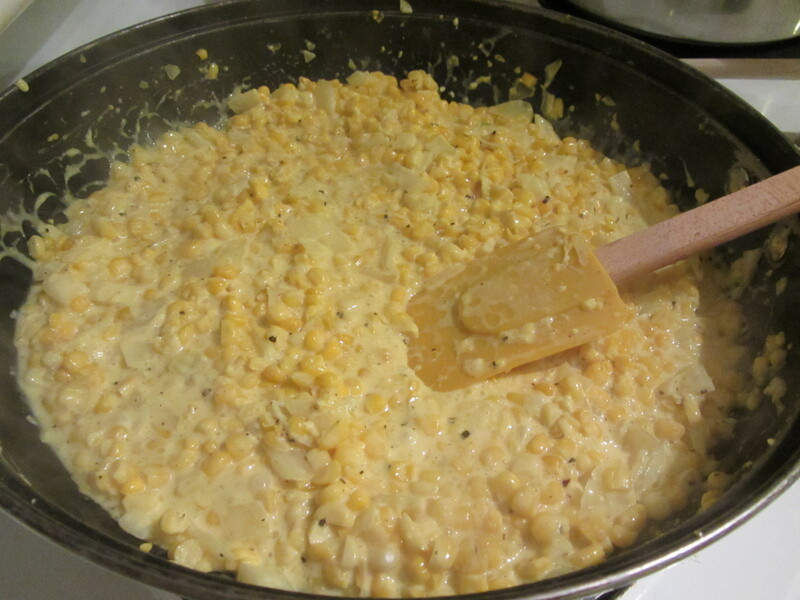 I would do a half pound of fish for two people, if I were to make this again… and I probably will make this again. 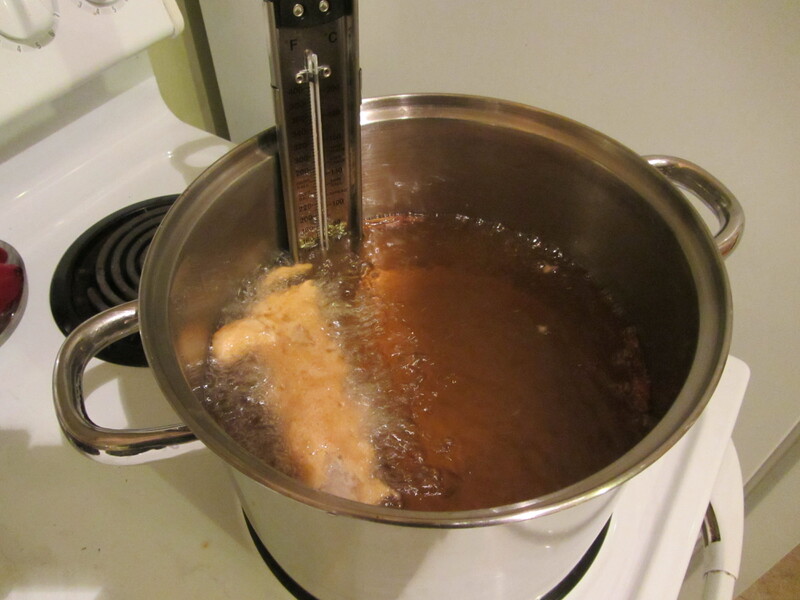 Next time, however, I will use a deeper pot for frying, and I will try to use a salad spinner to dry my fries, as I think my potatoes may have been a little too damp when they went into the oil, causing my oil to bubble over. It is safe to say that this episode goes down as the most disastrous in my little project. Let’s just hope it stays that way. The 21st episode of Good Eats features recipes on beef, specifically ground beef. What meat eater doesn’t like ground beef? The fun part about the recipes in this episode is that Alton shows you how to grind your own meat at home. When you buy ground beef at the grocery store, it is composed of all of the leftover meat trimmings, which means that the consumer is really not sure where their meat is coming from. 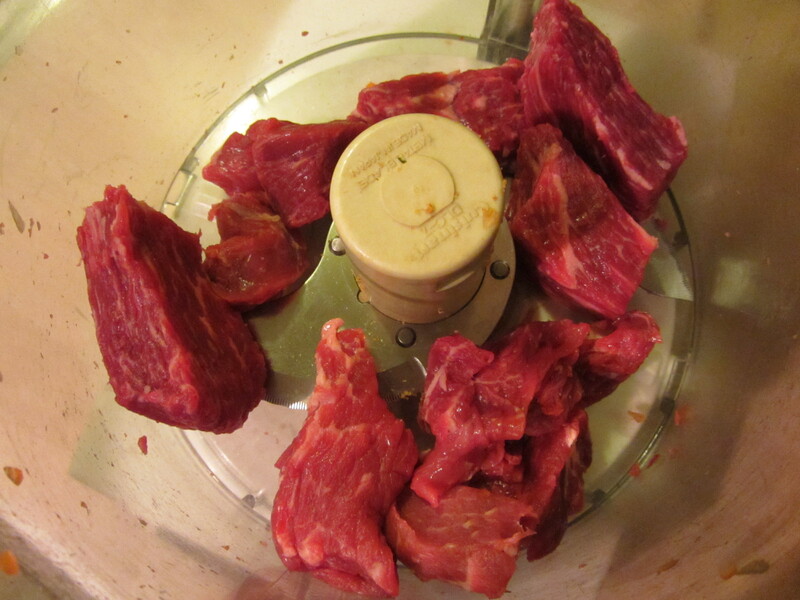 Conversely, by grinding your own beef at home, you know exactly what part of the cow you are eating. 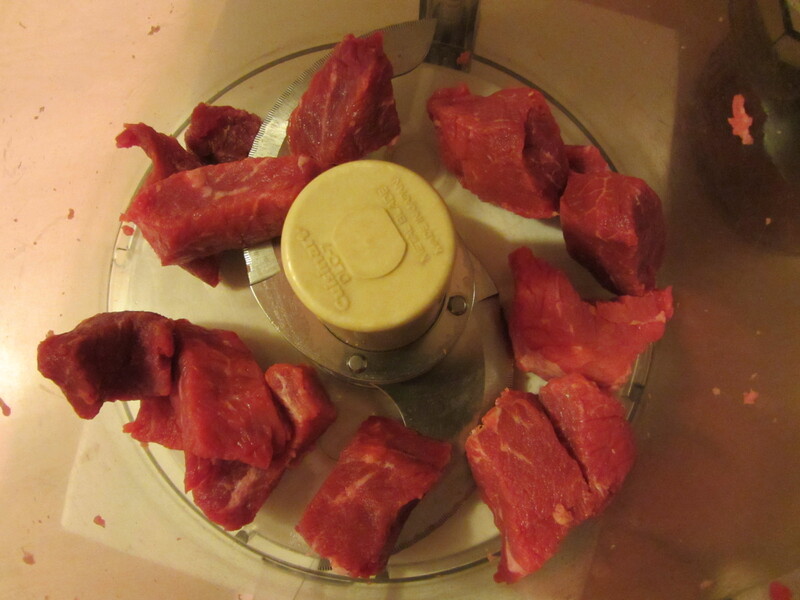 Alton explains that there are really three good ways to grind your own meat; you can use a meat grinding attachment on a stand mixer, an old-fashioned hand grinder, or a food processor. For these recipes, Alton uses the latter. It had honestly never really occurred to me to grind my own meat, and especially not with my food processor, so this was a fun experiment for me to try. The first recipe Alton tackles is for a classic burger. For this recipe, you want half of your meat to be chuck and the other half to be sirloin. Sirlon and chuck, ready to grind at home. 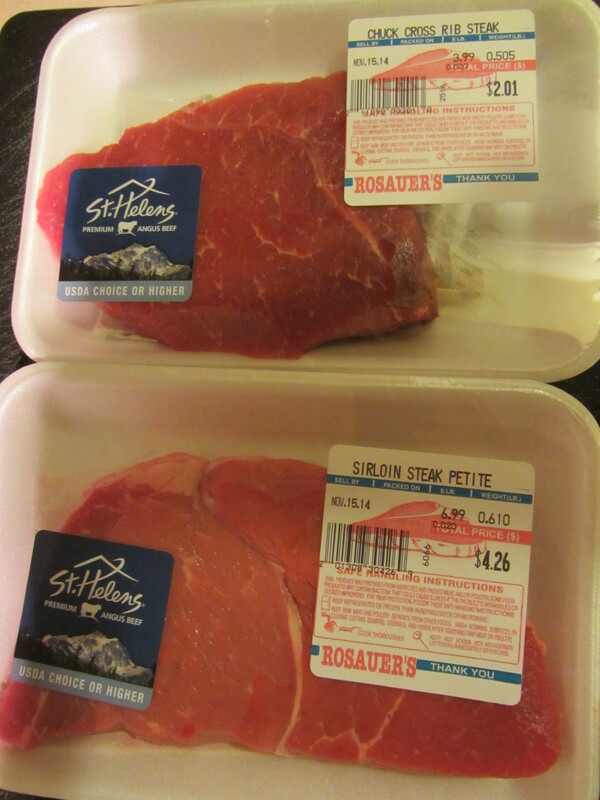 Since chuck is about 30% fat, it is ideal for blending with lean meats like sirloin. To begin, you want to trim your meat of any visible fat or tough connective tissue. My meat needed very little trimming. 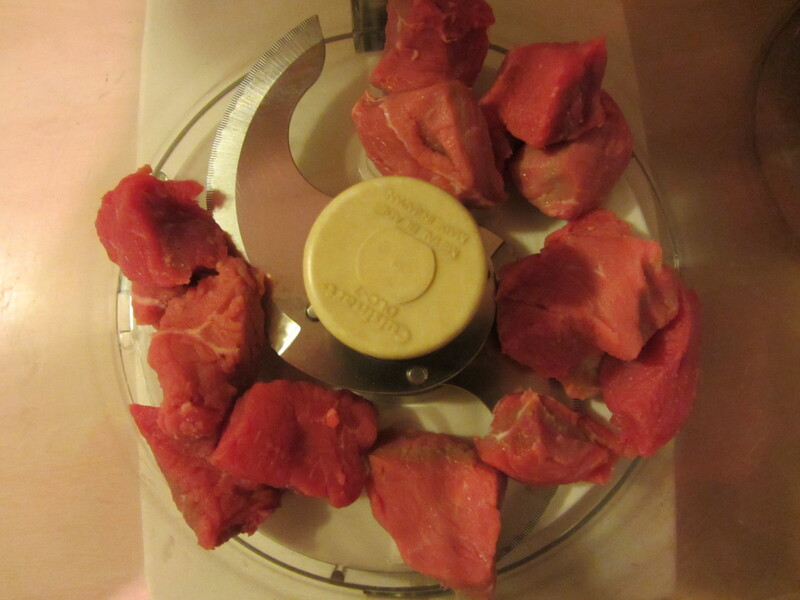 Once trimmed, you cut your meat into 1 1/2″ cubes. For grinding, you want your meat to be chilled. 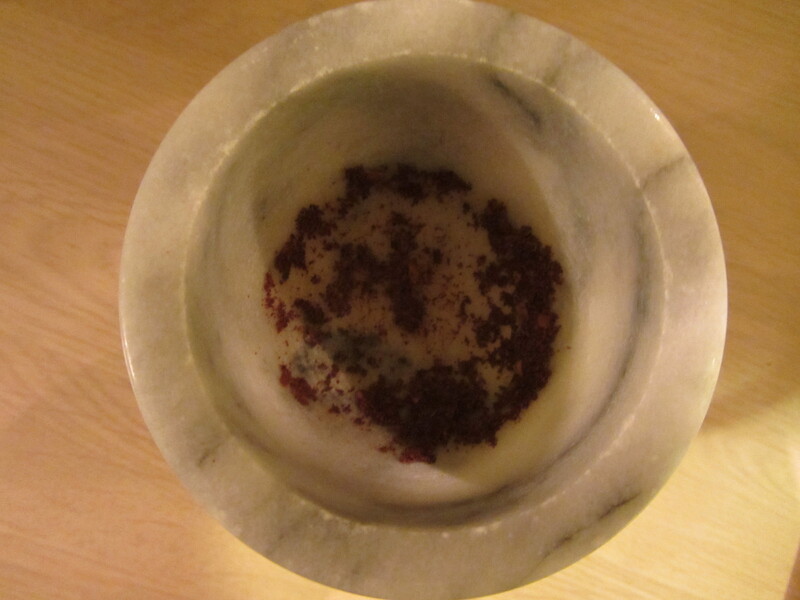 My meat was still cold after I trimmed it, so I began grinding right away. You want to process your meat in small batches, using short pulses. I found that putting eight ounces of trimmed meat into the processor was the perfect amount of meat for one batch, so I only had to do a total of two batches. 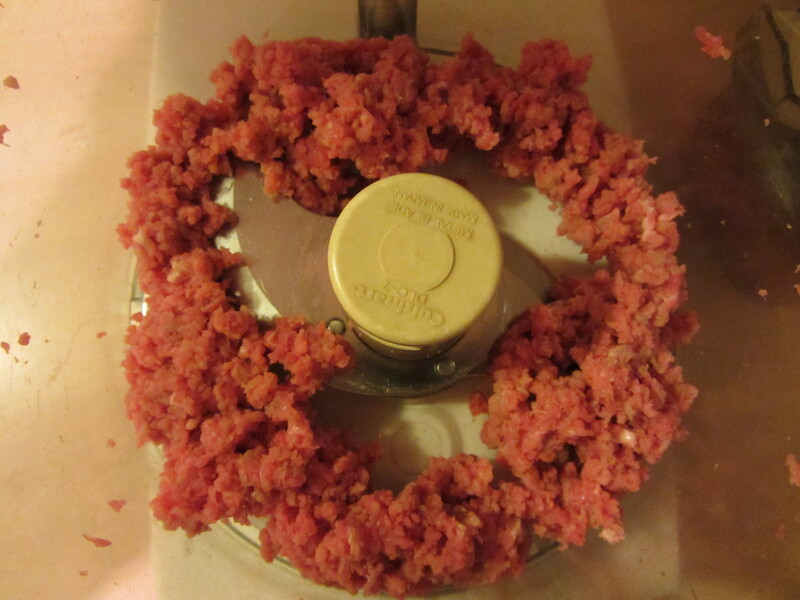 Alton tells you to pulse the processor about 10 times for perfect burger meat. I ended up doing about 15 pulses for mine, and it seemed to be just about right. FYI Alton tells you to pulse meat about six times for perfect chili meat. Sirlon in the food processor. 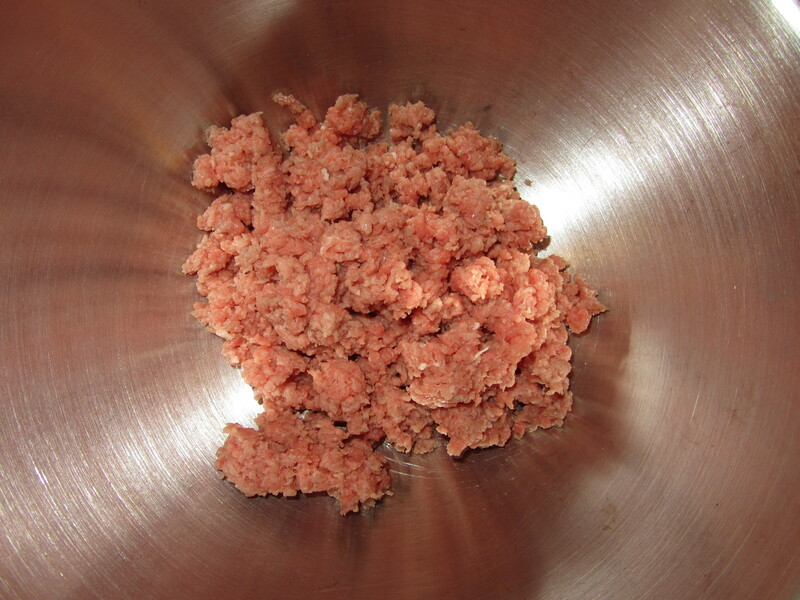 Ground sirloin, after ~15 pulses. Chuck, ready to be ground. 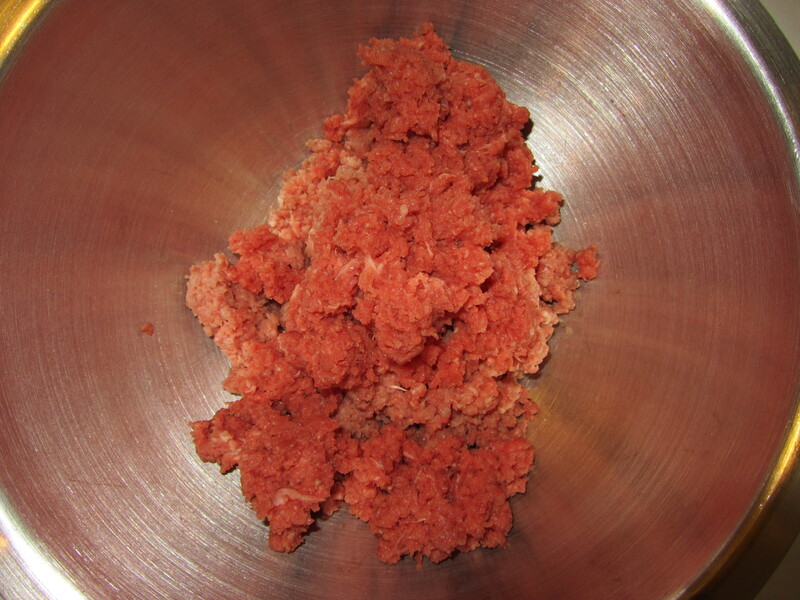 Once your meat is ground, you lightly mix it with your hands in a bowl. At this point, you can use the meat right away, or you can refrigerate it for a day or two. 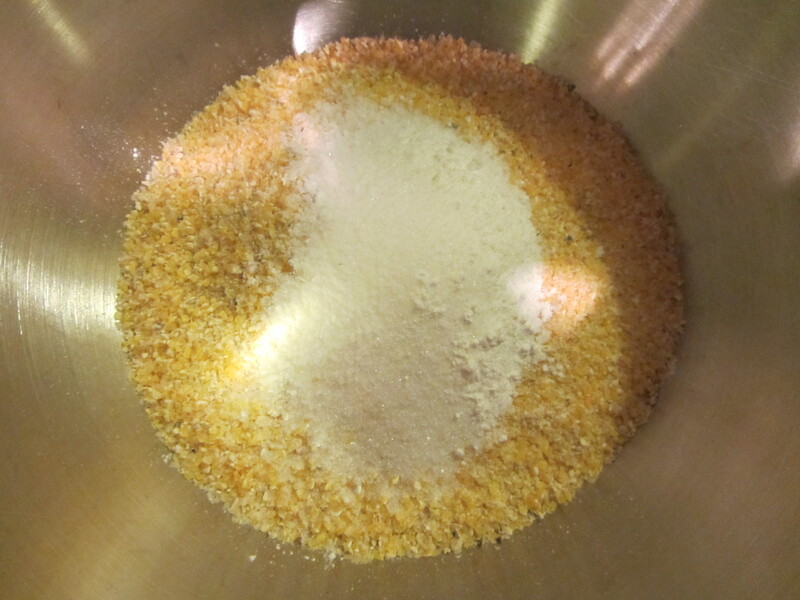 When ready to use your meat (I used mine right away), add some Kosher salt and mix it in gently with your hands. Alton stresses that salt is all the seasoning you need for a perfect burger. For a perfectly sized burger patty (4″ x 3/4″), weigh five ounces of meat. 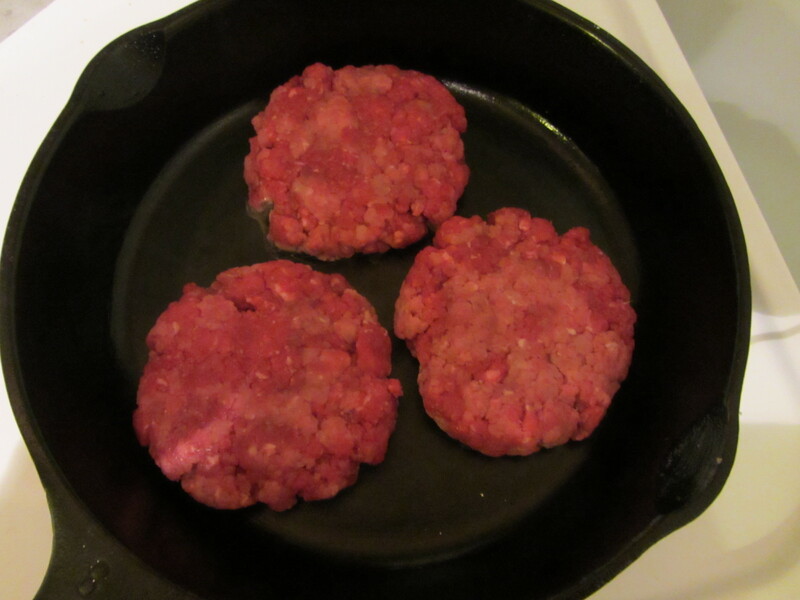 Lightly toss the meat between your two hands, forming it into a ball, and then flatten the meat into a patty. You do not want to compress the meat too much, as this will kill its texture. When your patties are all formed, heat a cast iron skillet over medium-high heat until water sizzles and bubbles away, about two minutes. Cook your burgers for four minutes per side if you want a medium-rare burger. Cook for an additional minute per side to get a medium burger. 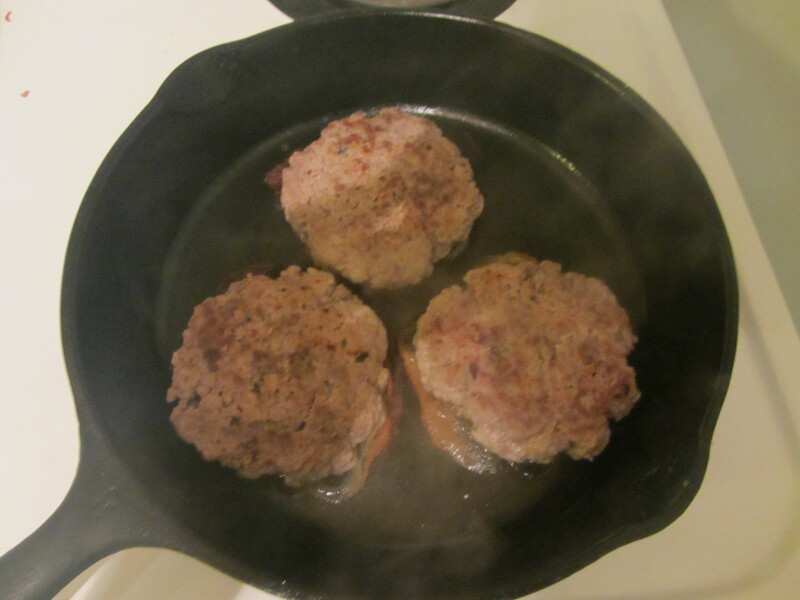 Burgers flipped after 4 minutes. Though this may conflict with every burger you have ever seen being cooked in an American diner, Alton informs you that you should, under no circumstances, smash your patty with a spatula while it is cooking. Patty smashing only serves to get rid of the good juices you want in your burger. Alton’s other rule for burger cooking: flip burgers only one time. 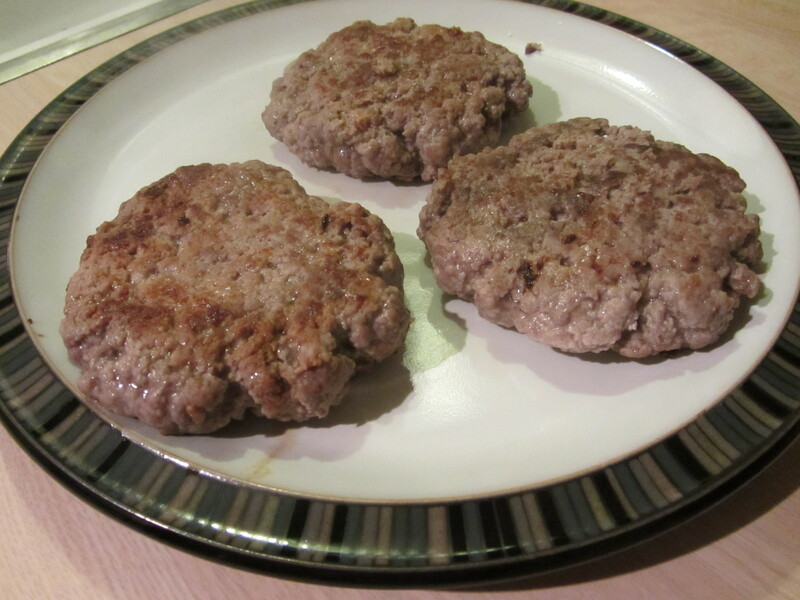 Once your burgers are cooked to your desired degree of doneness, let them rest for a minute or two before eating. 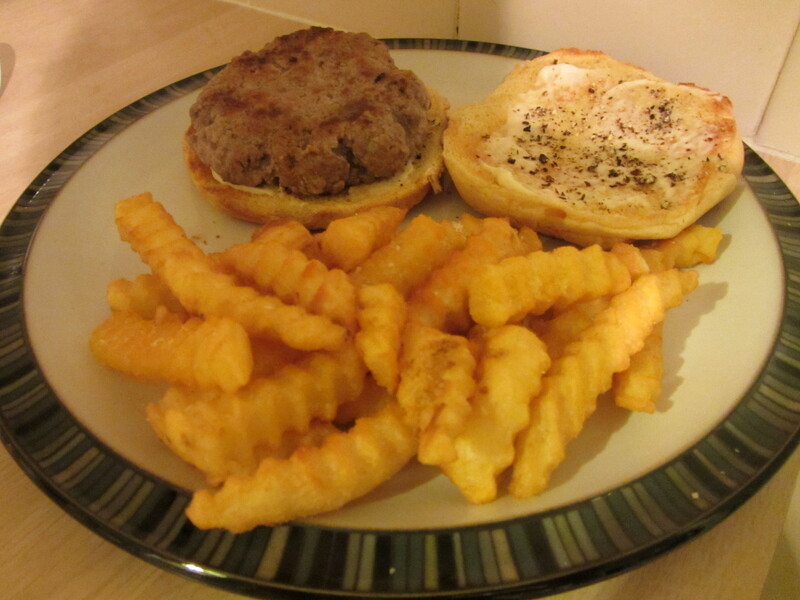 In the episode, Alton begs you to serve your burgers his way, which is on a toasted bun with only some mayonnaise and freshly ground pepper. I complied with his request. 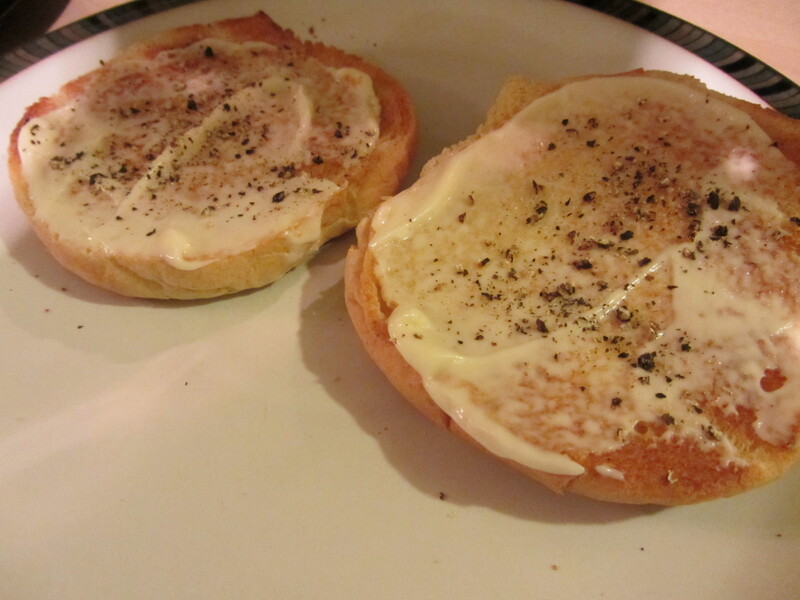 Bun adorned the Alton way, with only mayo and pepper. We ate our burgers with French fries on the side. The texture of the beef was great, as the burgers stayed moist and were not overly dense. Unfortunately, my burgers were a little overcooked, which I think was due to my burner being a little too hot from the French fries cooking simultaneously below. Still, though, the burgers were flavorful and juicy. I am not a huge fan of mayonnaise, so I was skeptical about eating my burger with only mayo and pepper. I do have to say that the meat flavor really stood out and was complimented by the spice of the pepper and creaminess of the mayo. I do think that we sometimes overwhelm the basic flavors of the meat itself by piling on a lot of condiments. Really, though, it’s just about what you like, right? This burger recipe was a winner. Grinding the meat at home really took very little extra time and effort, though it is a bit more expensive to do so. If you want to treat yourself to a good burger at home, it is worth the expense to grind your meat. Plus, you’ll know exactly what you are eating, which is a bonus. The second recipe in this episode is for meatloaf. I really like meatloaf, especially at this time of the year. 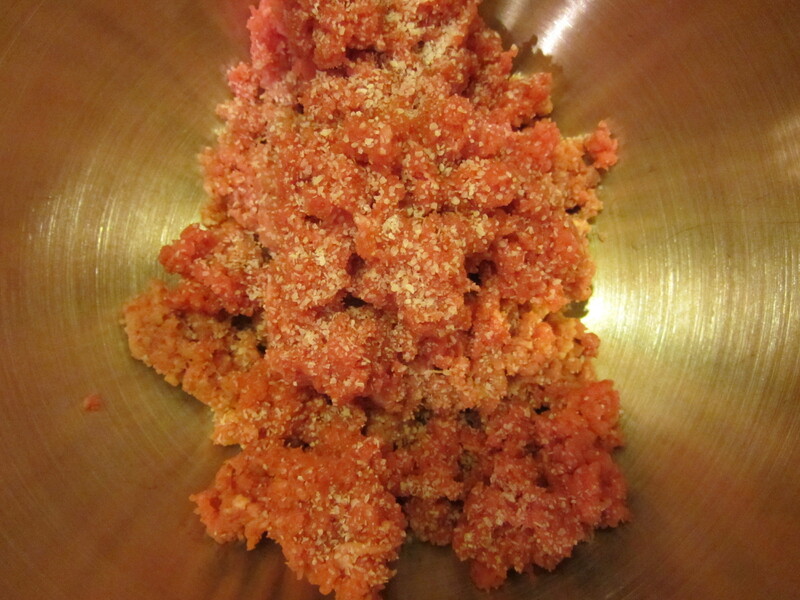 Like the burger recipe, this recipe uses a food processor. 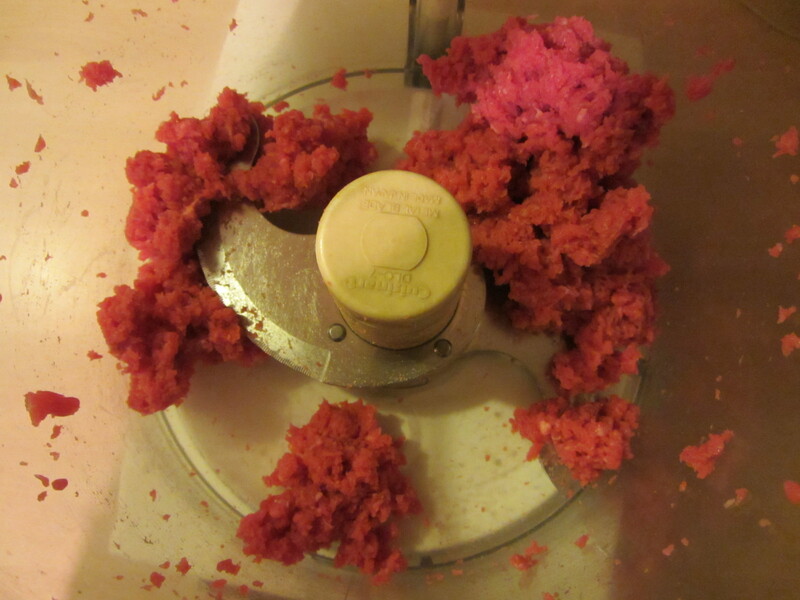 The food processor I use belonged to my parents, and I’m fairly sure it was a wedding present to them in 1974. You do have to keep your hand pressing on the lid or it will stop running, but it otherwise works just fine. 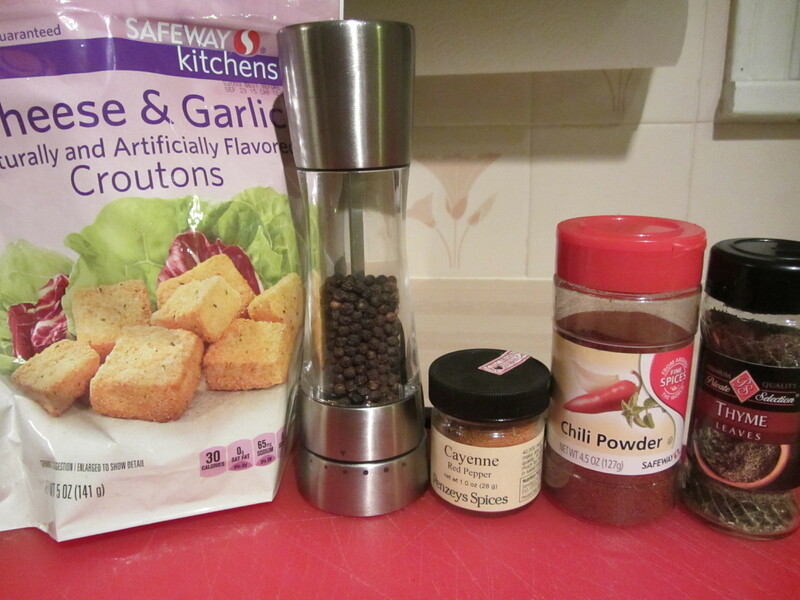 To begin, you combine garlic-flavored croutons, black pepper, cayenne, chili powder, and dried thyme in the processor. 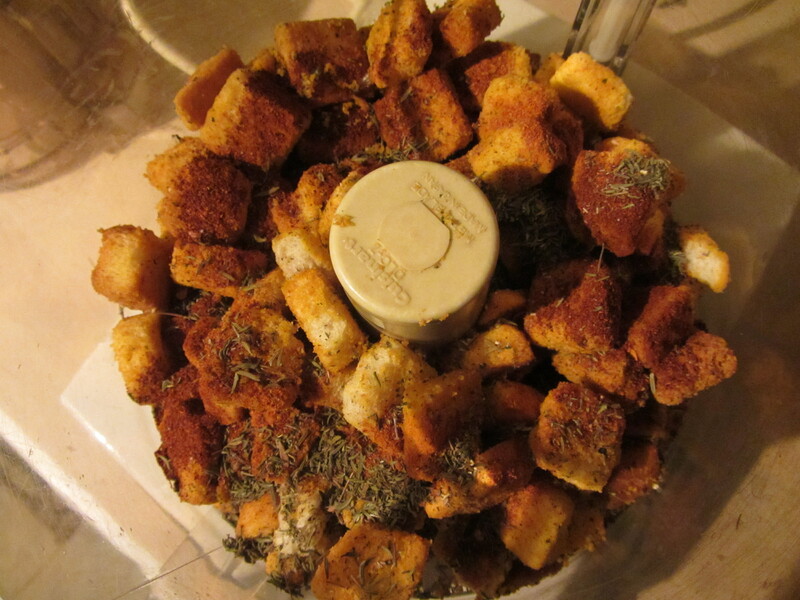 Grinding the crouton mixture in the food processor. You want to process this until all of the visible crouton cubes are gone. 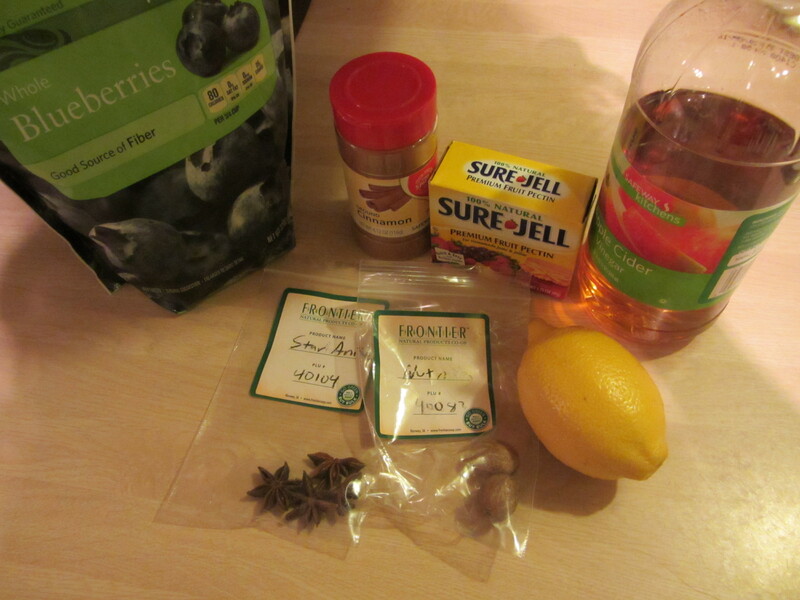 This mixture then goes into a large mixing bowl. 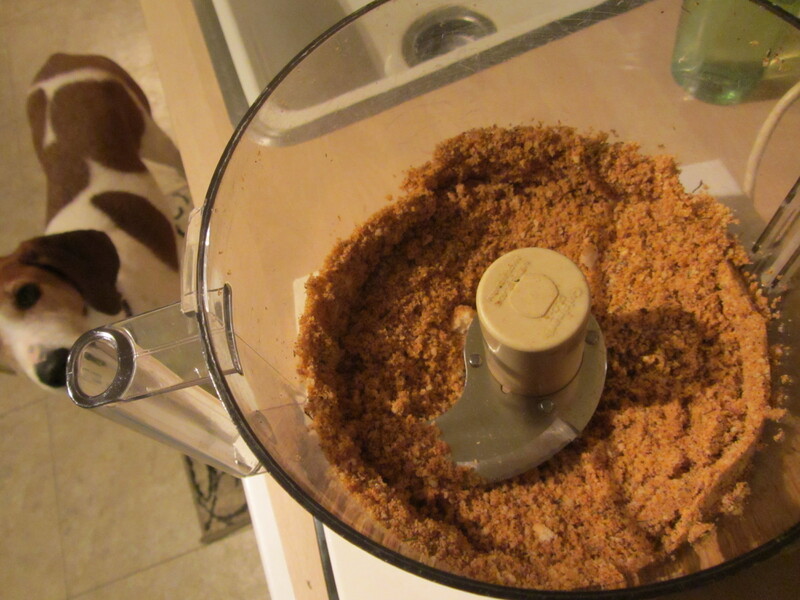 The ground crouton mixture, and Coonhound cameo. 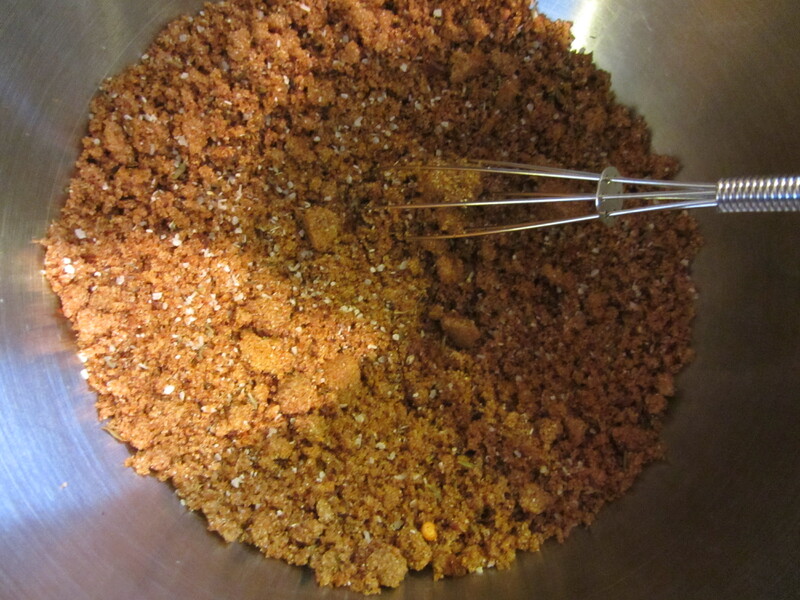 Ground crouton mixture in mixing bowl. 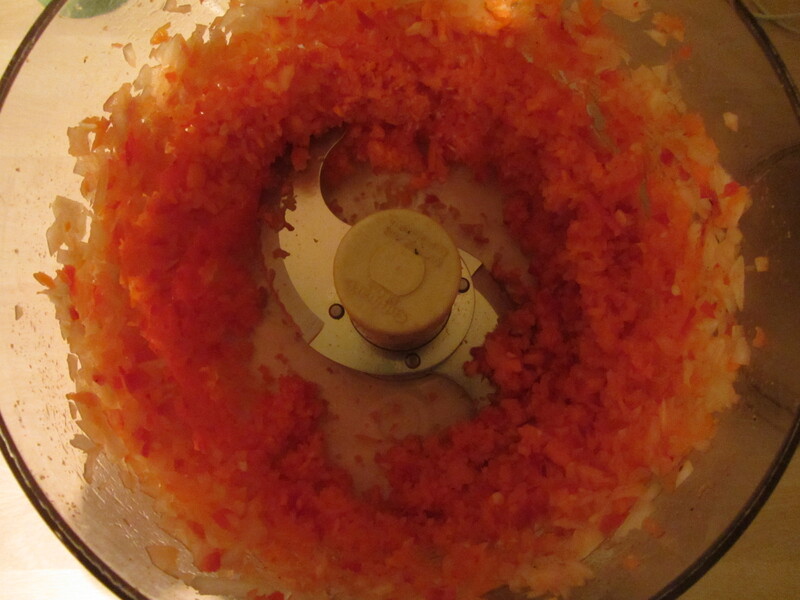 Next, again in your food processor, you combine onion, carrot (no need to peel), garlic, and bell pepper. 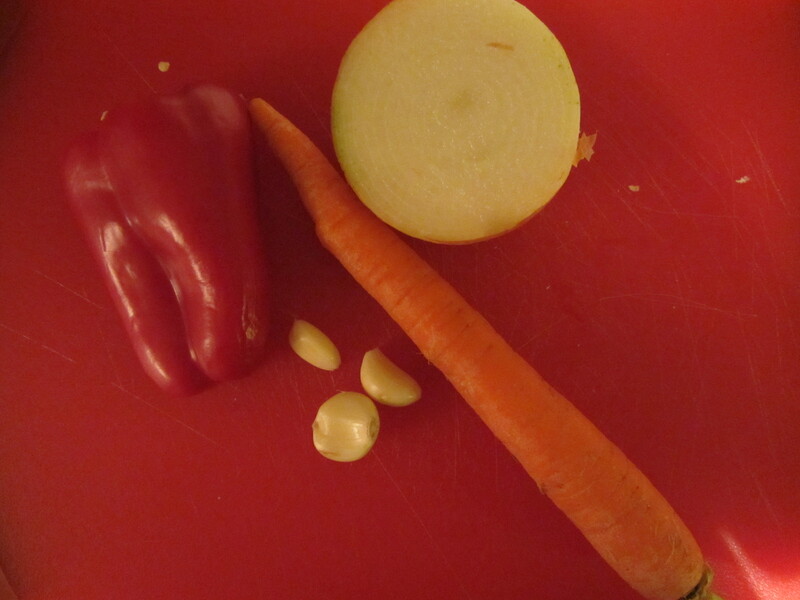 Bell pepper, carrot, onion, and garlic. 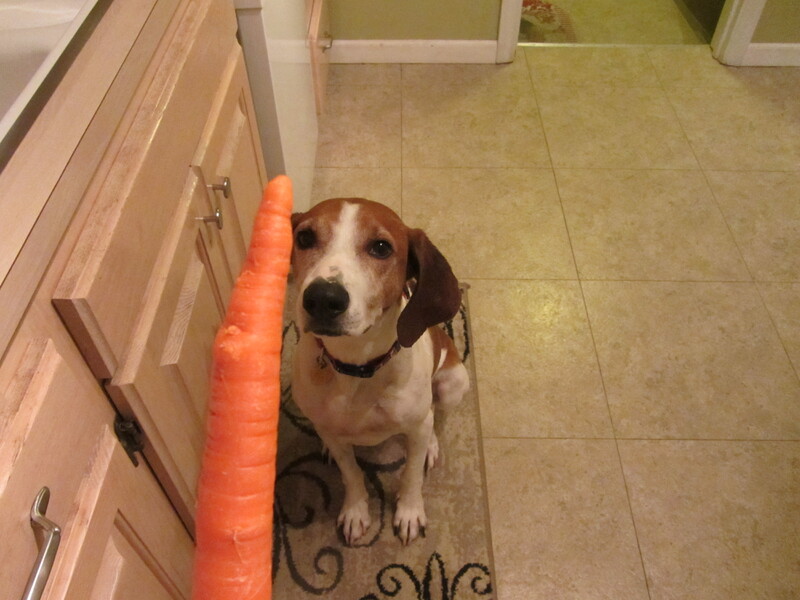 He is NUTS for carrots. 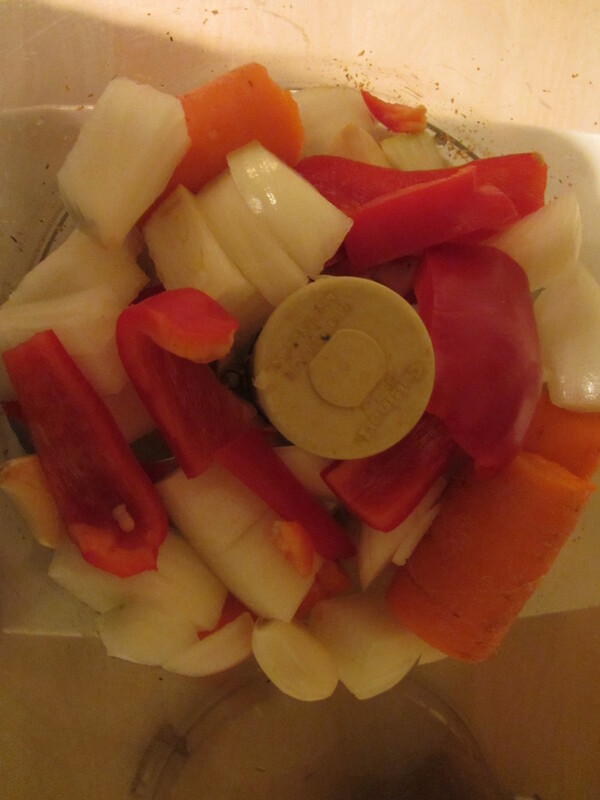 Veggies in the food processor. 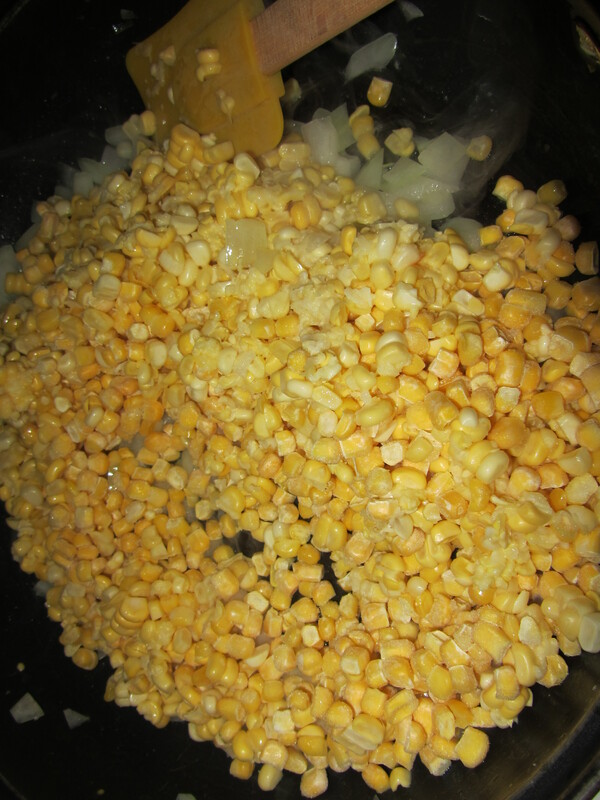 You want to process the vegetables until they are finally chopped, but you do not want to puree them. 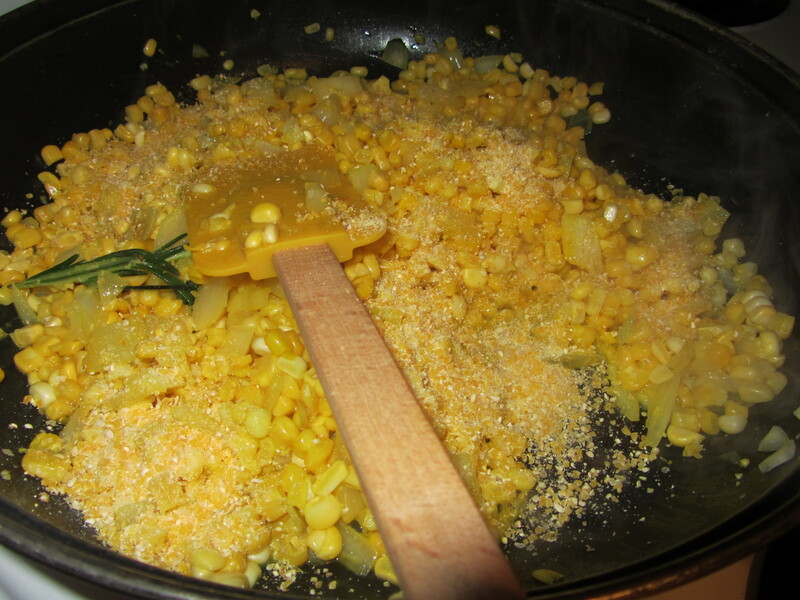 Once chopped, the veggies go into the bowl with the crouton mixture. Veggies in the bowl with the croutons. 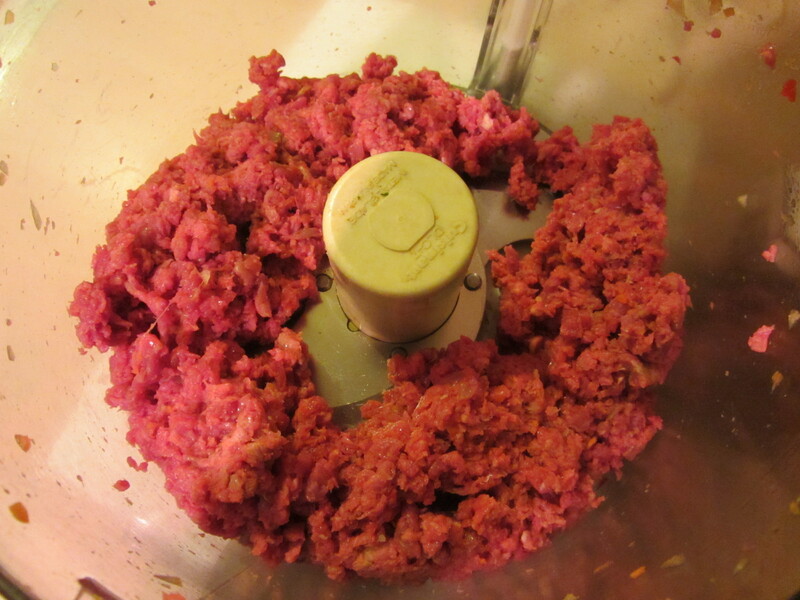 Next, into the food processor goes your meat. 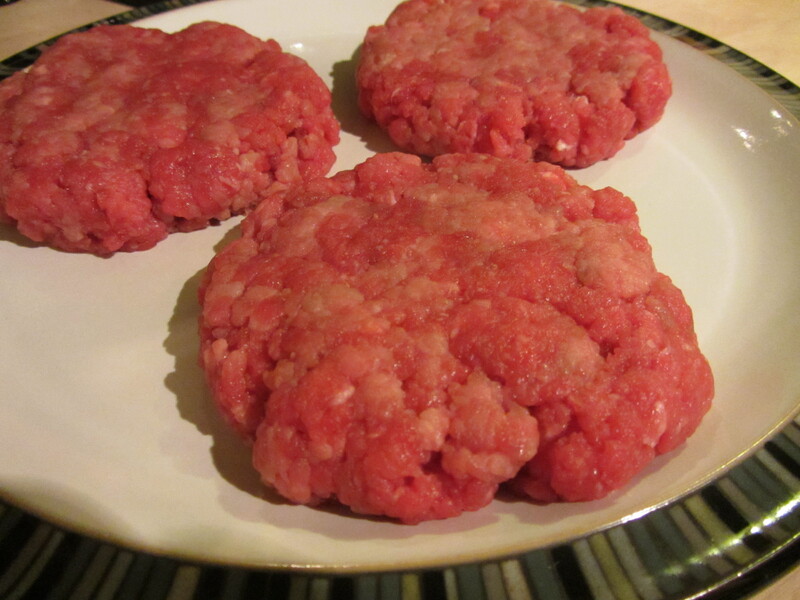 Just like with the burger recipe, you want to use 50% chuck and 50% sirloin that you have trimmed and cubed. 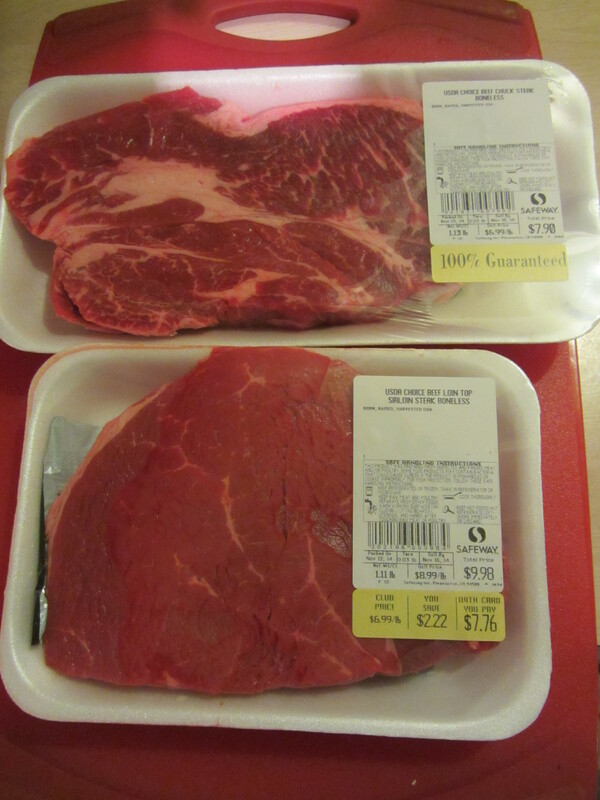 Sirloin and chuck to be trimmed and ground. I had to do a bit more trimming with this meat than for the burgers, so it took slightly longer. I was still able to do my meat in two batches, pulsing about 15 times. 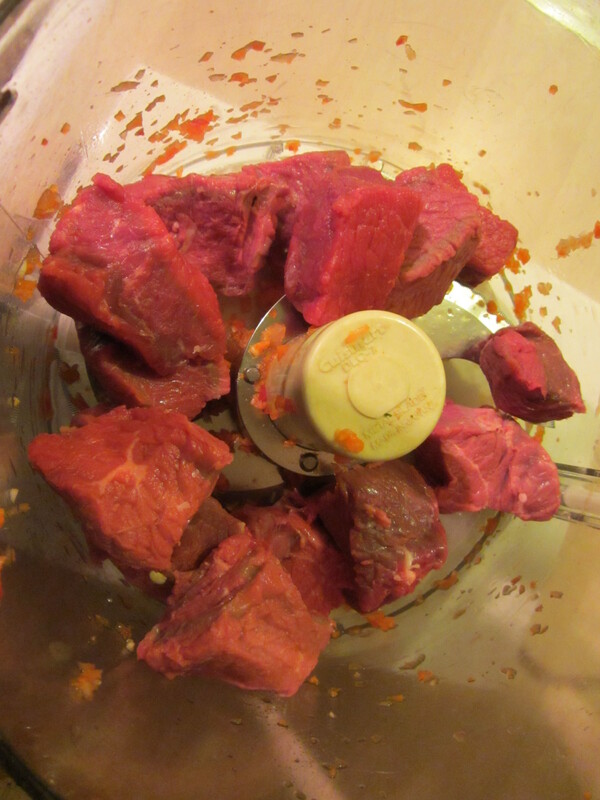 Sirloin in the food processor. 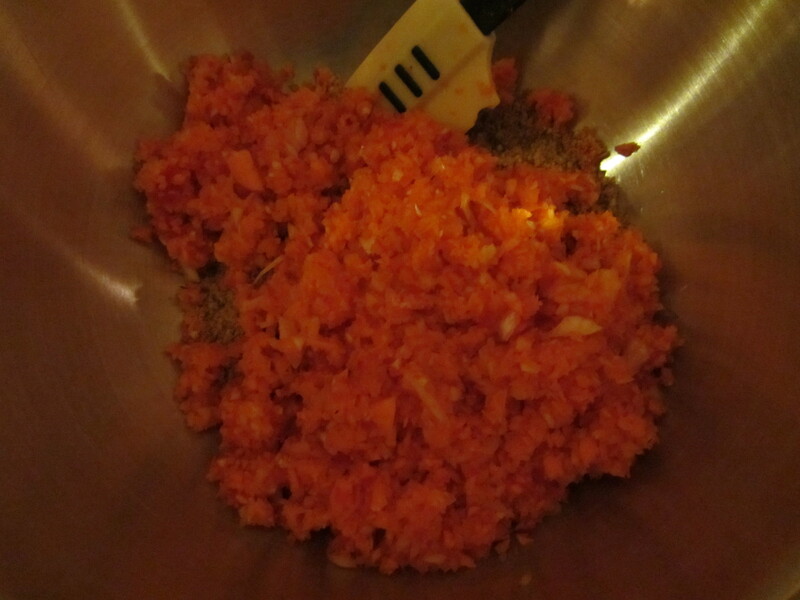 Chuck in the food processor. 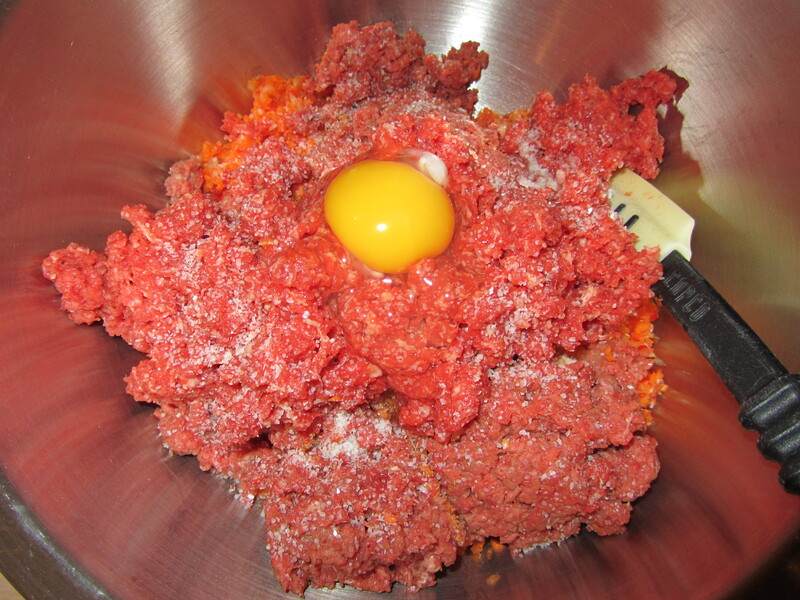 Once your meat is ground, you add it to the bowl with the other ingredients, along with some Kosher salt and one egg. Both ground meats added to the veggies and croutons, along with salt and an egg. 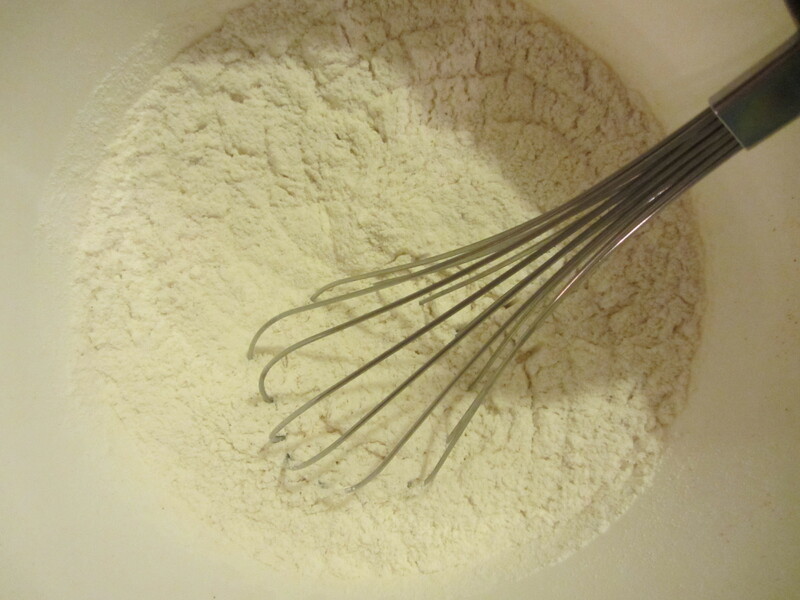 You want to use your hands to gently toss this mixture. Alton tells you not to squeeze the meat. Once everything is suitably combined, pack the meat into a loaf pan, using a spatula. The combined mixture after mixing with my hands. Packed into a loaf pan. Here is where Alton’s recipe differs from most meatloaf recipes, as you do not actually bake the meatloaf in the loaf pan. 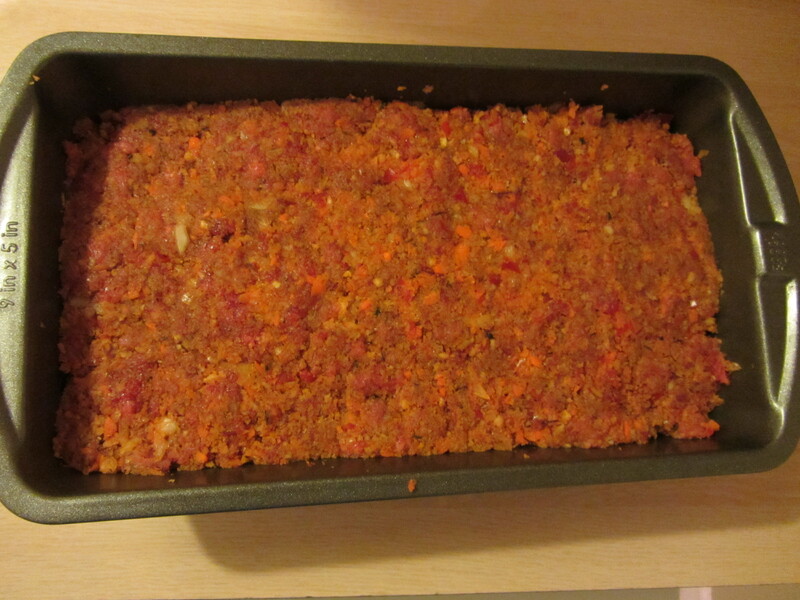 Instead, you turn the meatloaf out onto a parchment-lined baking sheet, using the loaf pan simply as a mold. Alternatively, you could just shape the meatloaf on the sheet pan with your hands. 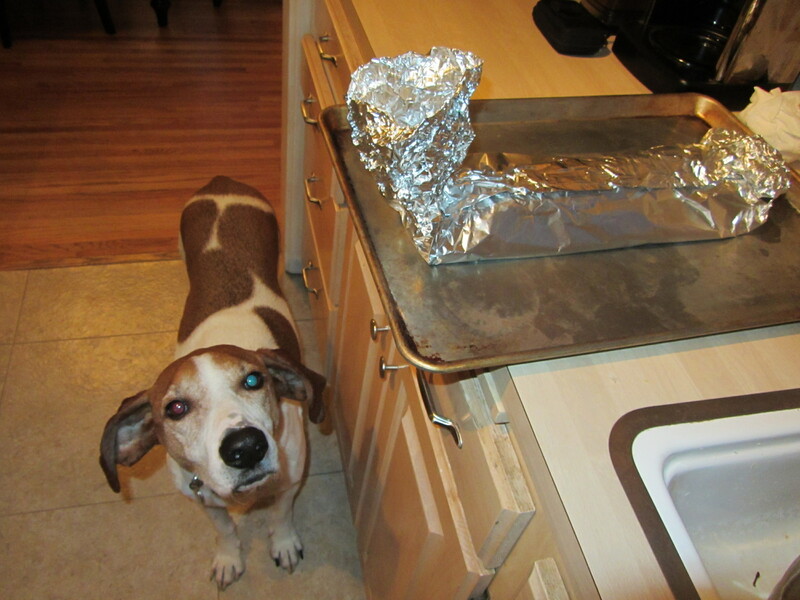 Why does Alton not have you bake in the loaf pan? Cooking the meatloaf on a sheet pan allows the fat to escape while the heat gets in. Turned out onto a parchment-lined sheet pan. 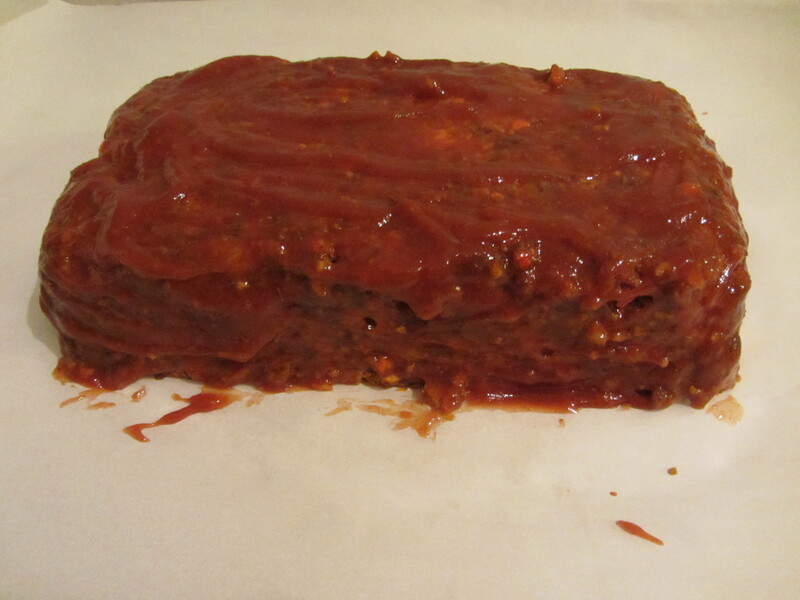 After baking for about 10-15 minutes, you want to brush a glaze onto your meatloaf. 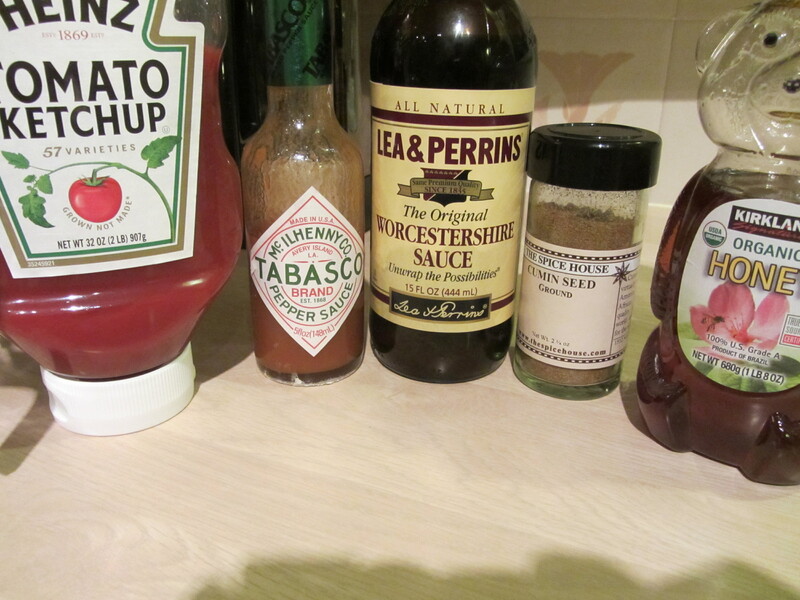 For the glaze, combine ketchup, cumin, Worcestershire sauce, hot sauce (I used Tabasco, as did Alton), and honey. 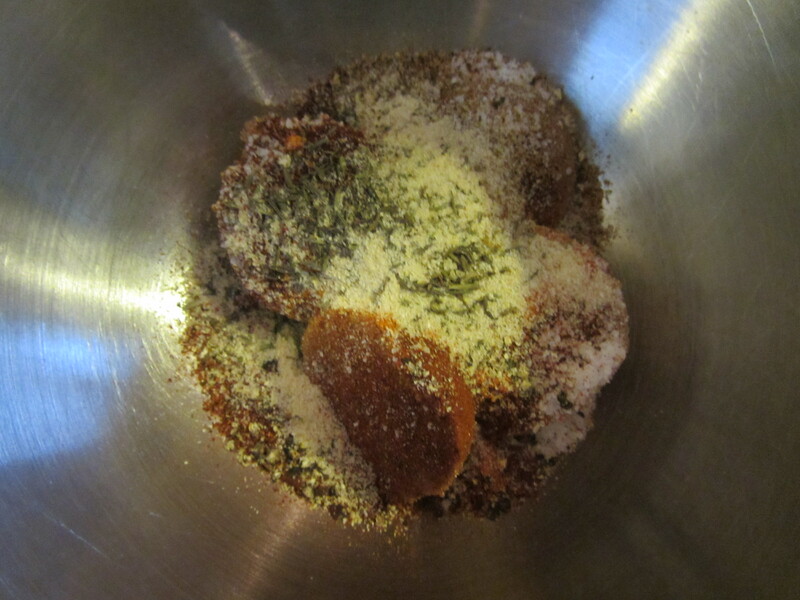 In the online recipe, the glaze calls for a teaspoon of ground cumin, though Alton used a whole tablespoon of cumin in the episode. I, or course, went with what he did in the episode. Glaze ingredients: ketchup, hot sauce, Worcestershire sauce, cumin, and honey. 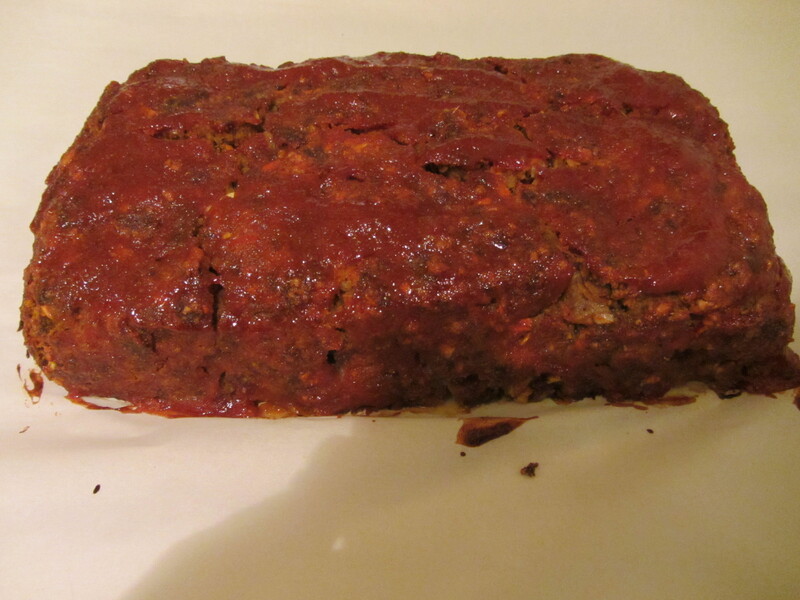 Meatloaf after 10-15 minutes in the oven. Glaze brushed on and back into the oven. For his meatloaf, Alton uses a probe thermometer (set to 155 degrees), which he inserts into the center of the meatloaf at a 45 degree angle. I do not have a probe thermometer, so I simply checked the temperature of my meatloaf regularly until it reached 155 degrees. 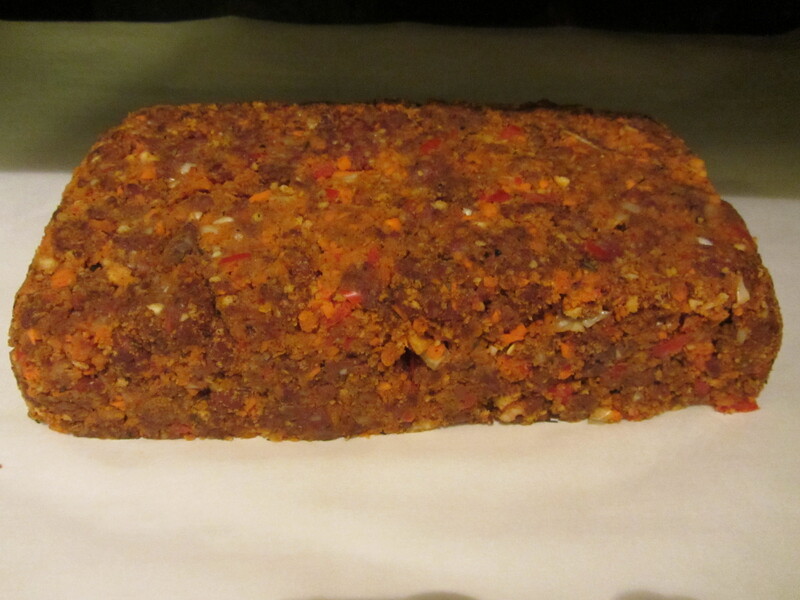 Confession: my meatloaf’s temperature was a bit higher than 155 degrees when I removed it from the oven. Once you remove your meatloaf from the oven, be sure to let it rest for about 10 minutes before slicing. 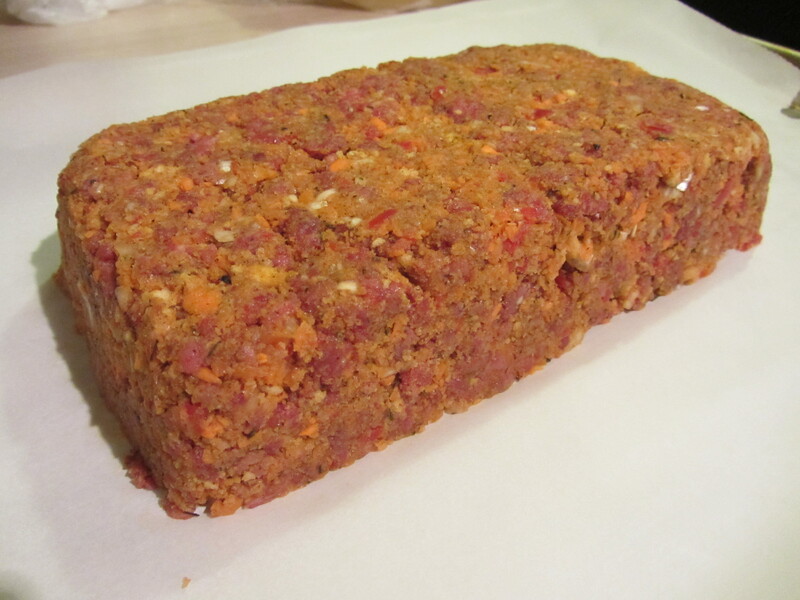 Meatloaf after baking to 155 degrees (+). We ate our meatloaf last night, alongside some steamed, seasoned broccoli. The meatloaf did crumble a bit when it was sliced, but it was far from dry. 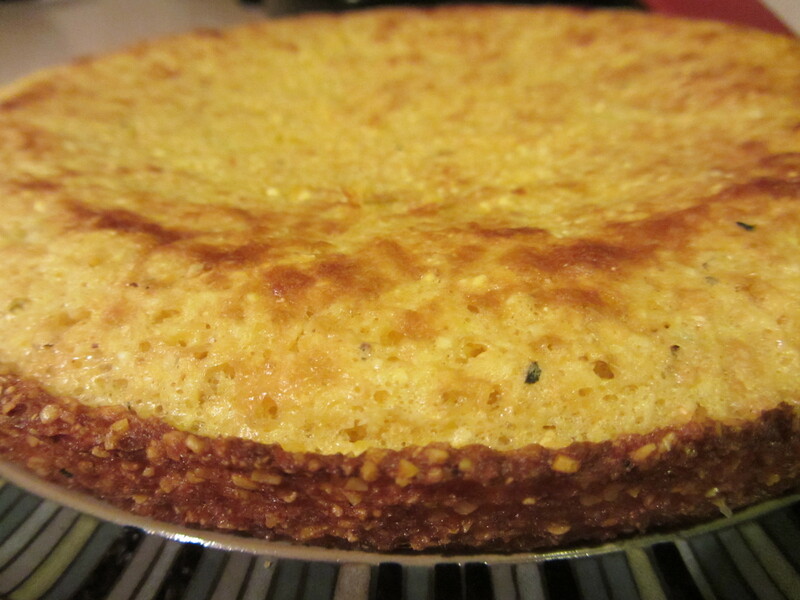 In fact, it was very moist in the middle with a nice crust from the glaze on the outside. We both really liked the combination of spices used, and said we will likely use them again for any future meatloaf, even if we are not grinding our own meat. 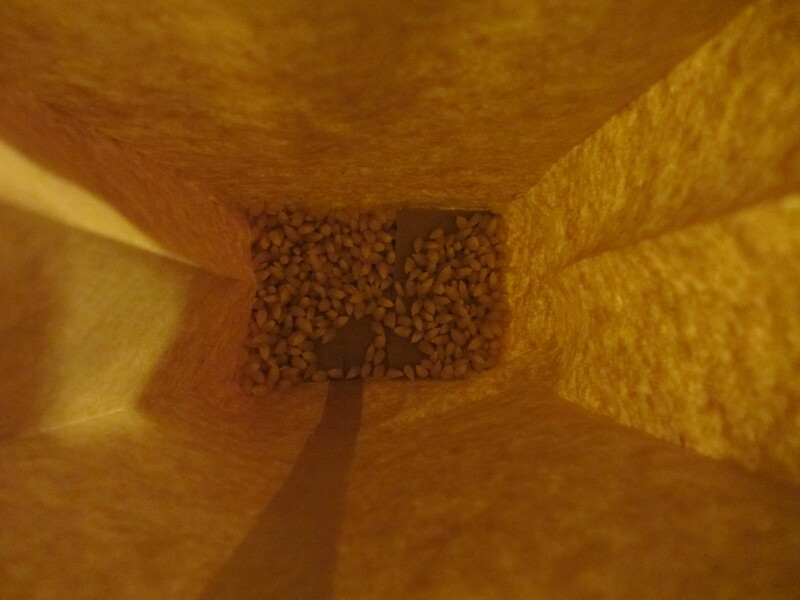 The cumin was the predominant spice, so those who do not like cumin may find this to be a bit overpowering. We, however, thought it was just right. 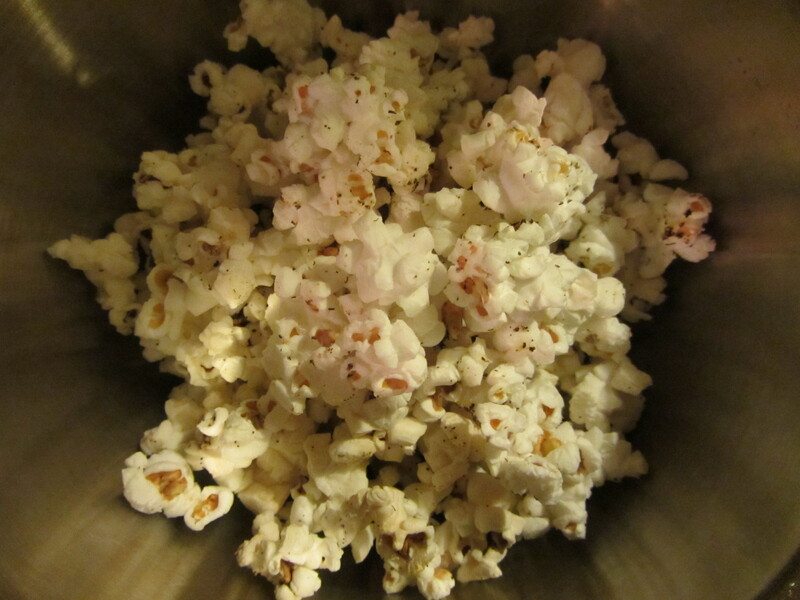 The flavor was zesty, slightly spicy from the cayenne and hot chili powder, and sweet from the ketchup and honey. The meat flavor still came through, even with all of the spice, and the vegetables served to keep moisture in the meatloaf. 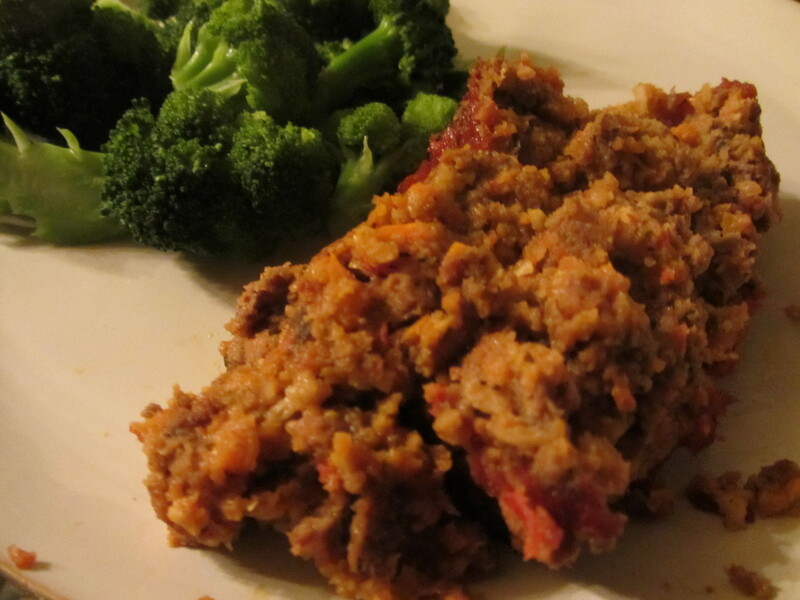 If you are looking for a super flavorful, spicy meatloaf, give this one a try.